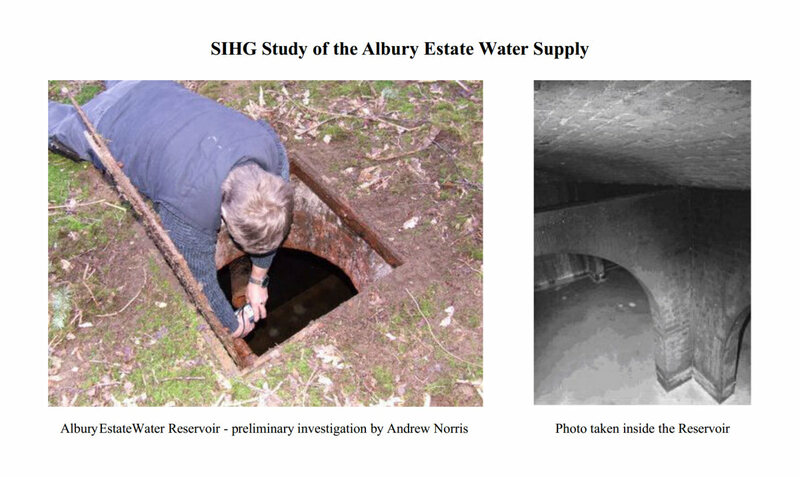 AGM plus The Albury Water Supply An illustrated talk by Pam Taylor. 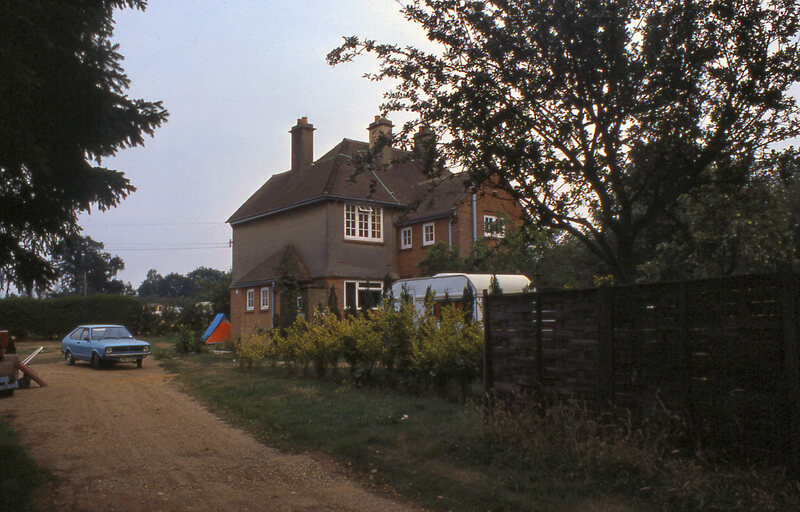 Tuesday 16 April A Pitch Hill Childhood, living near the Windmill. 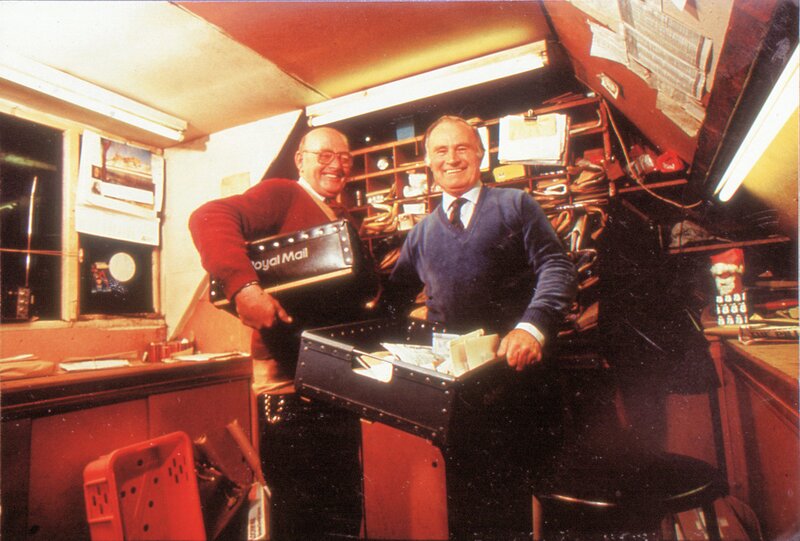 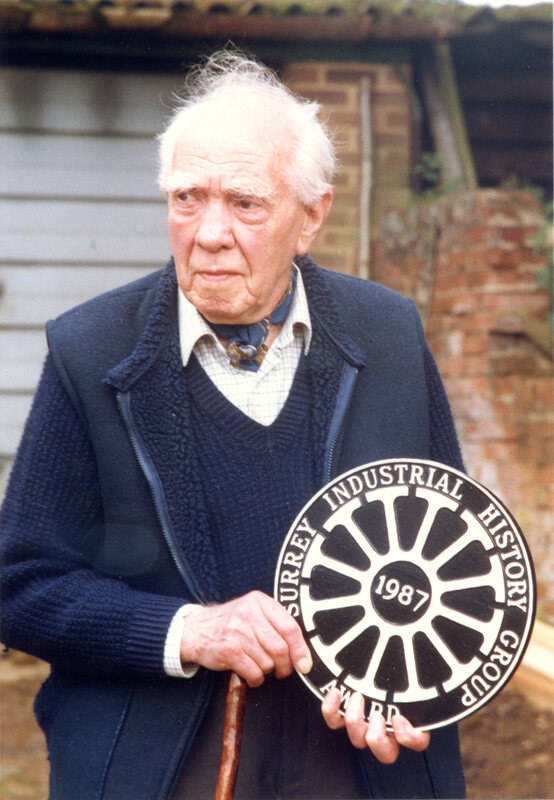 A 1997 recorded and illustrated talk by Albert Carter. 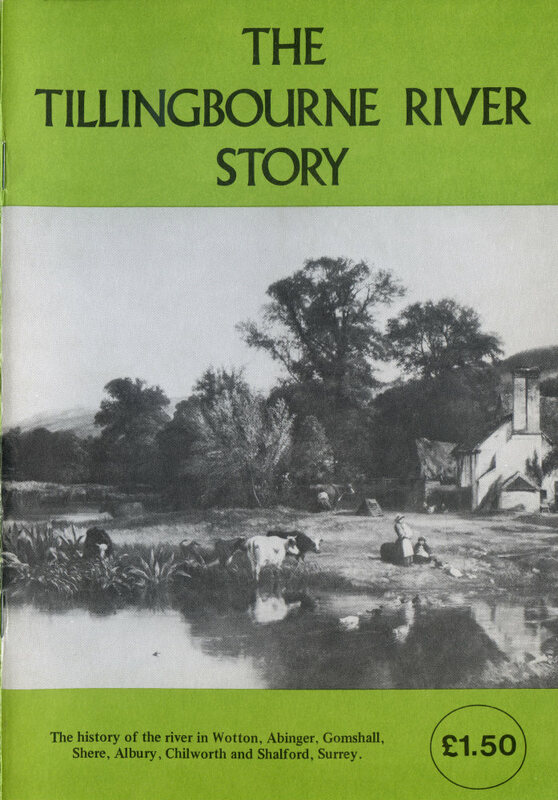 Poisonous Plots A fascinating insight into devious and deadly deeds. 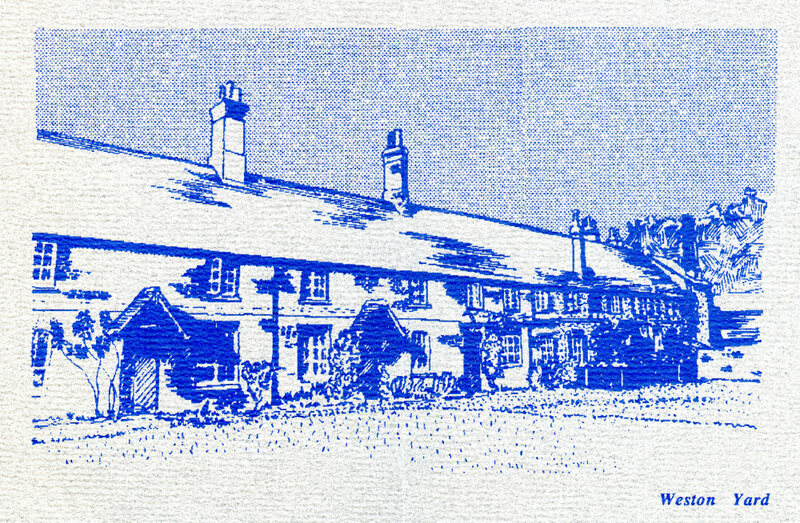 An illustrated talk by Sheila Willis. 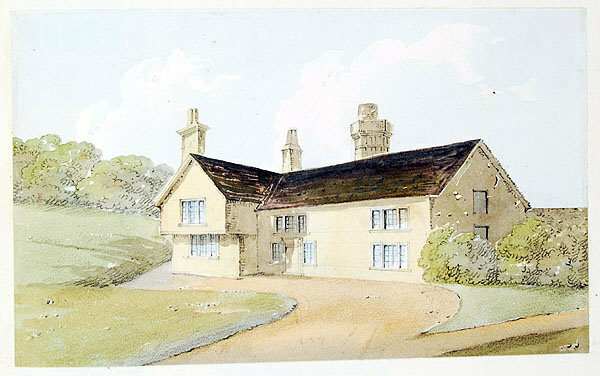 Visit to Tower Hill Manor, Gomshall By kind permission of Sarah Stevens, including a cup of tea. 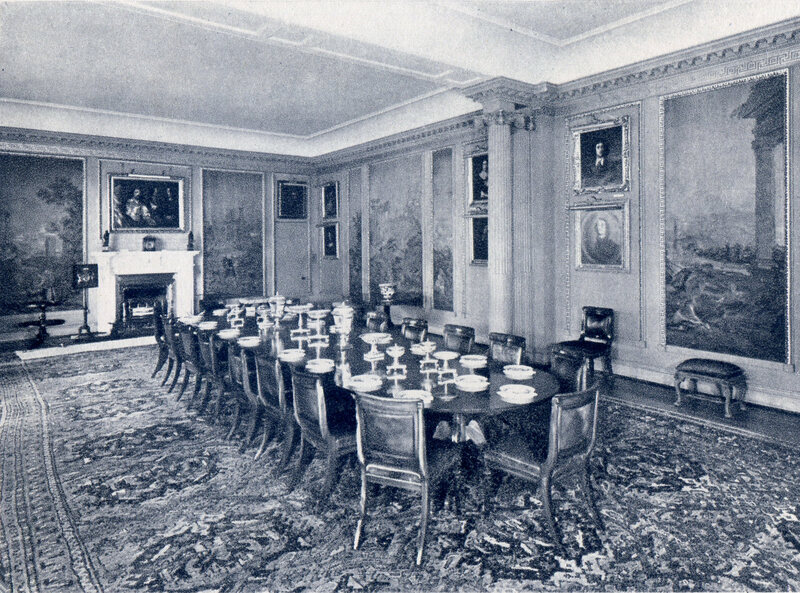 Reservation essential. 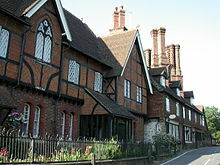 Guided visit to Abbot's Hospital, High Street, Guildford - founded by George Abbot in 1619 and received its Royal Charter in 1622. 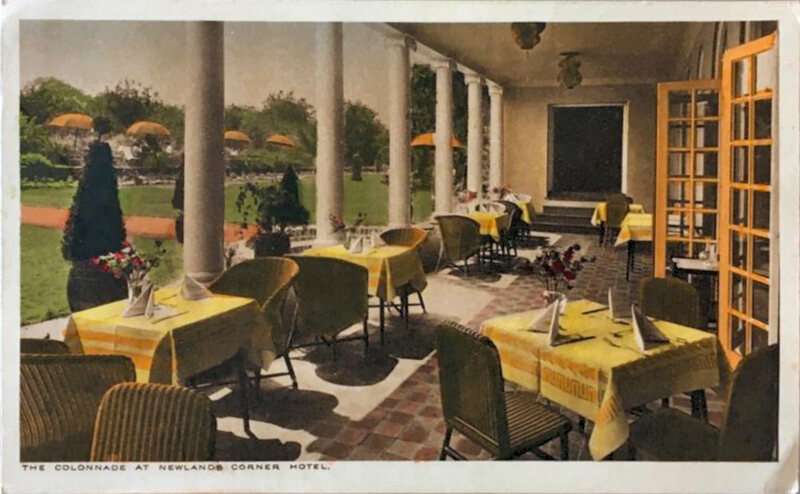 Reservation essential. 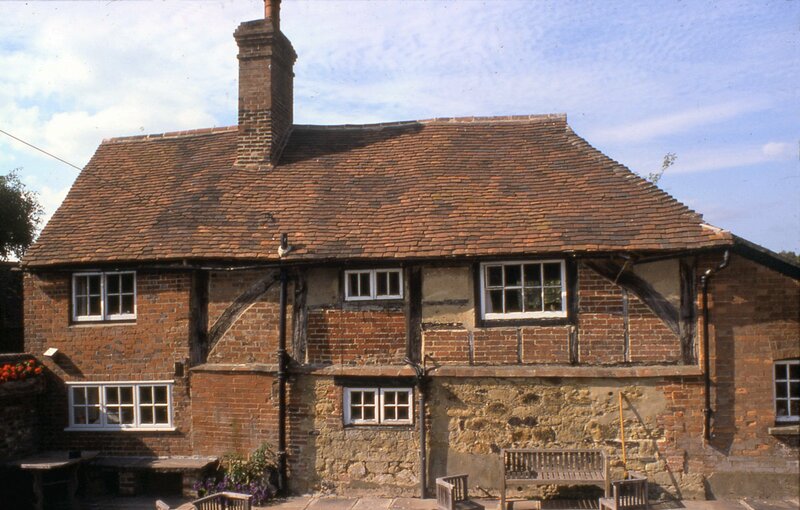 Tuesday 17 September 18th Century Watercolours of Surrey This illustrated talk by Julian Pooley provides a wonderful glimpse of buildings and High Streets two centuries ago. 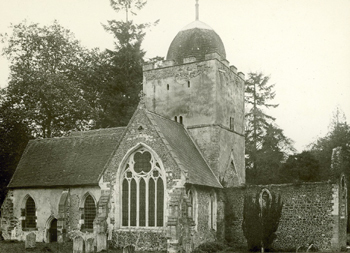 Tuesday 15 October Guildford Cathedral - "Build Anew on Tradition" An illustrated talk considering the architect's aim by Janet Mathews, Chief Guide. 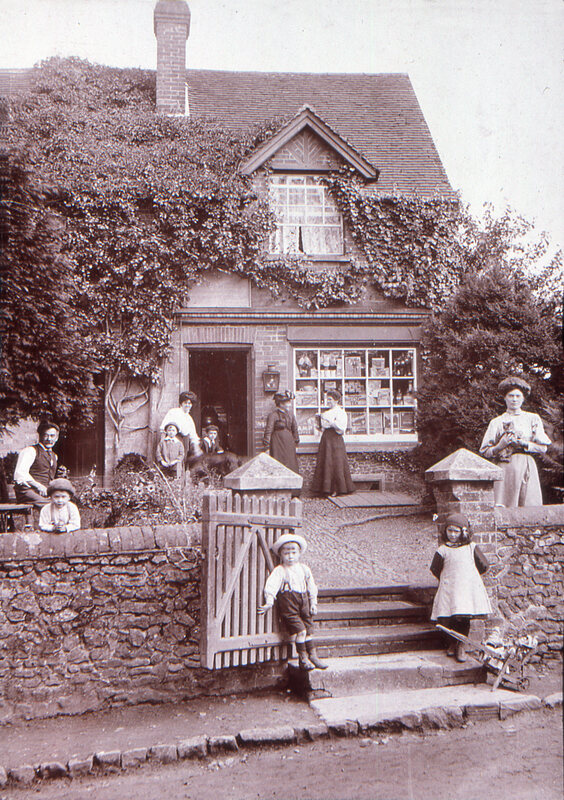 Tuesday 19 November Bottles & Bygones An illustrated talk by David Rose. 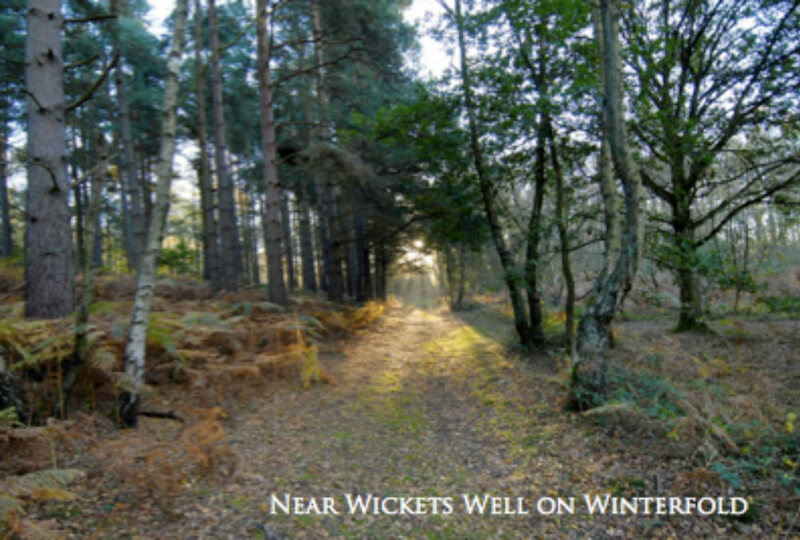 Followed by mulled wine & mince pies. 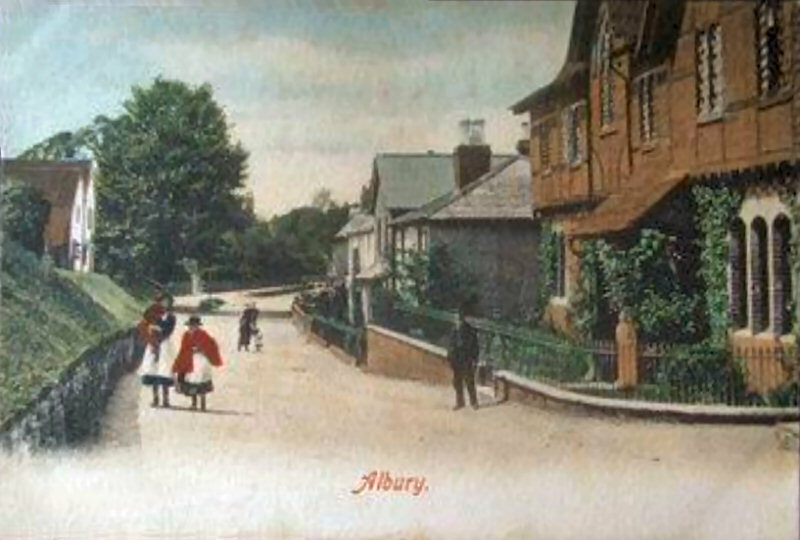 Albury History Society, alburyhistory.org.uk, was founded in 1971 with the aims of promoting interest and research in local history. 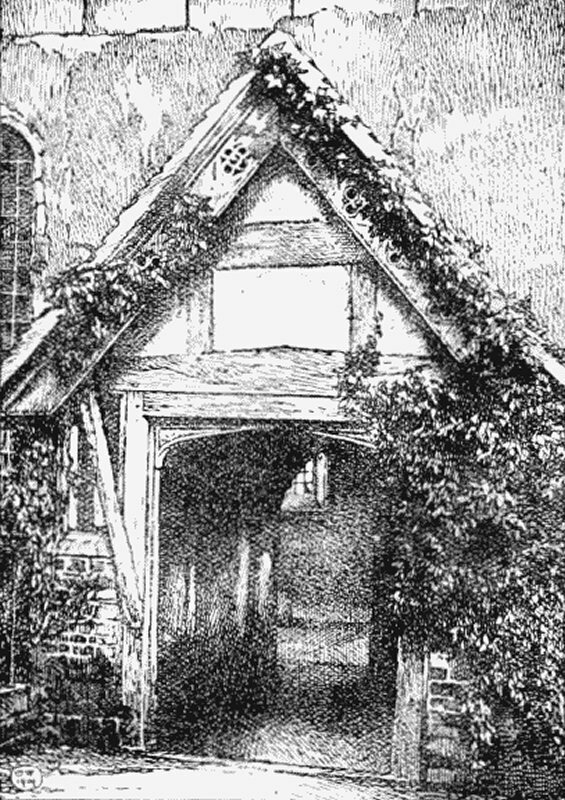 Between March and November each year we have a programme of illustrated talks and visits to places of historical interest. 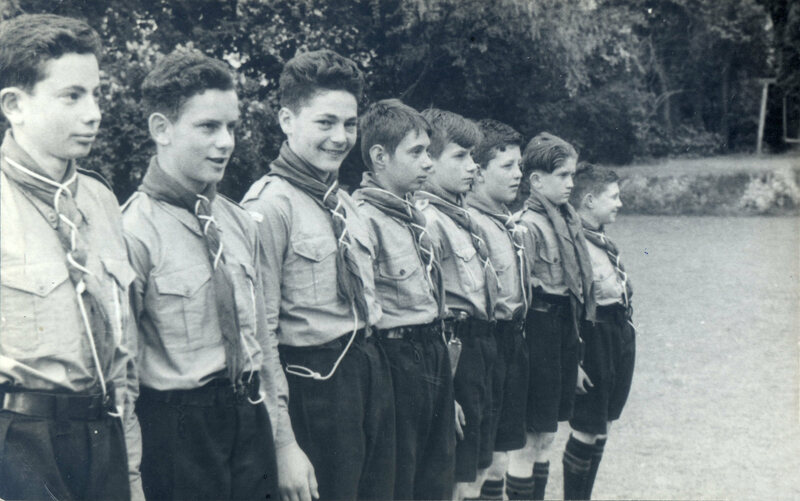 Honorary Secretary: Margaret Clarke, 01483 202 294, m.andm.clarke@gmail.com. 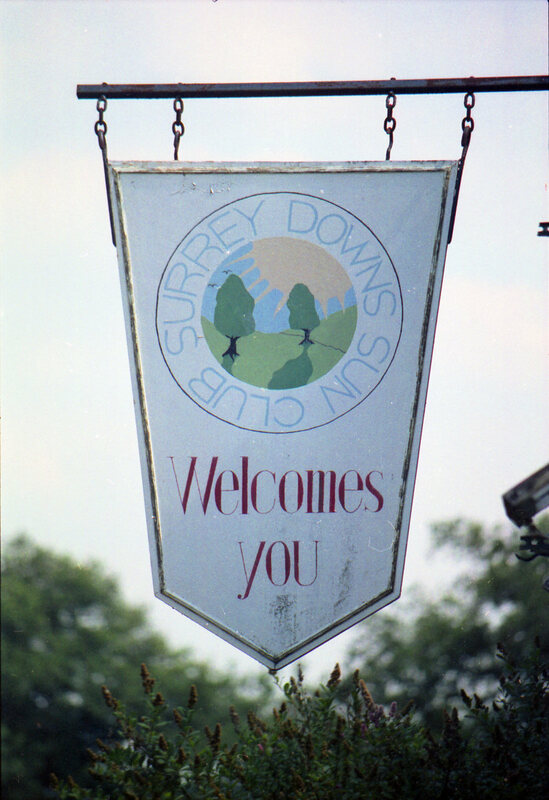 Minutes of our 2018 AGM, secretary and financial reports are here. 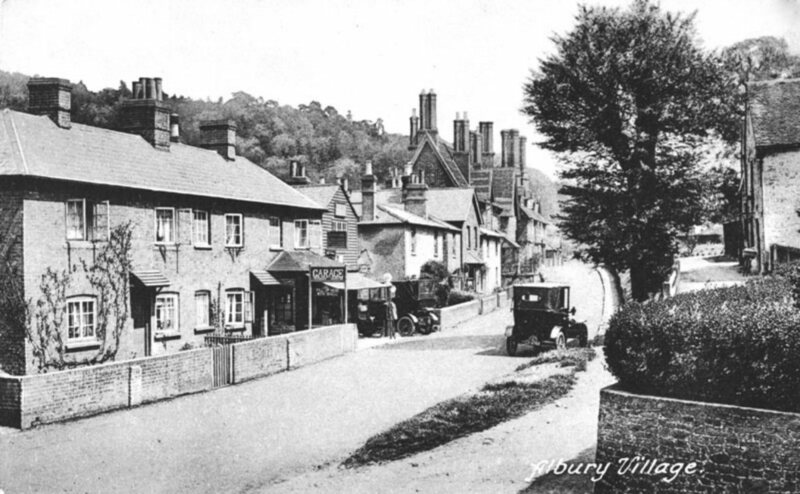 Wikipedia has entries on Albury, Albury Park, Farley Green, Newlands Corner, the Tillingbourne, Lawbrook or Postford Brook and Silent Pool. 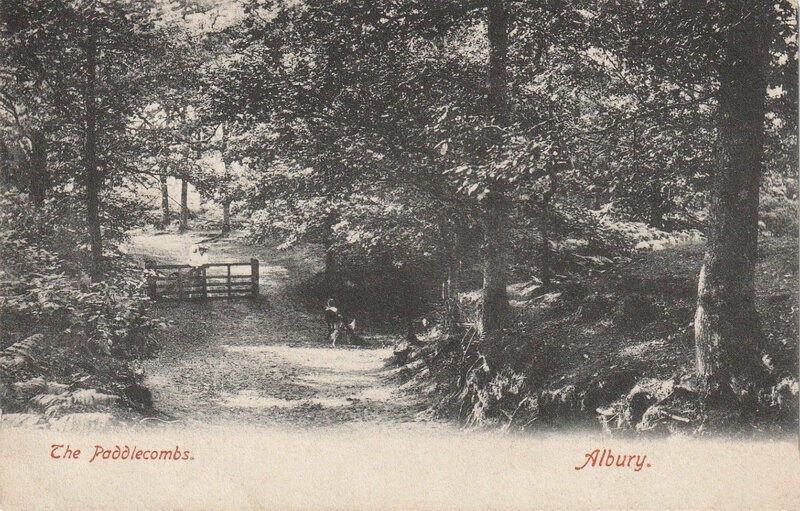 The Exploring Surrey's Past article about Albury is here: exploringsurreyspast.org.uk/themes/places/surrey/guildford/albury. 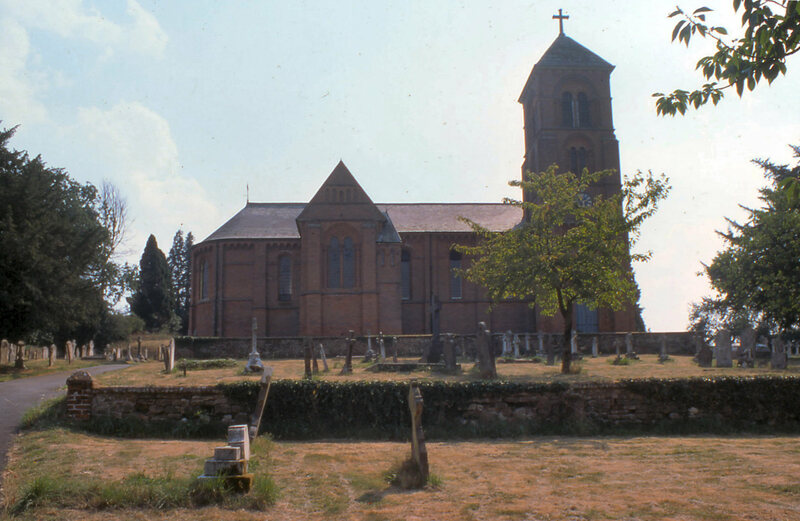 Some history of the Saxon Old Church, Barn Church, Irvingite Catholic Apostolic Church and St Peter & St Paul is at Albury Churches: here. 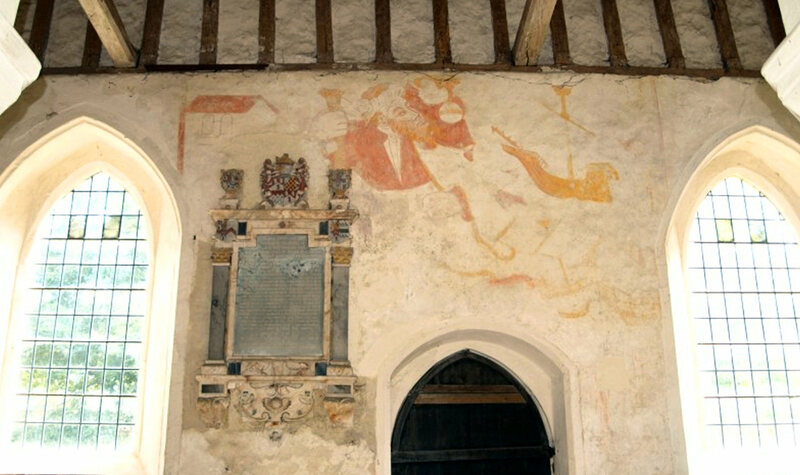 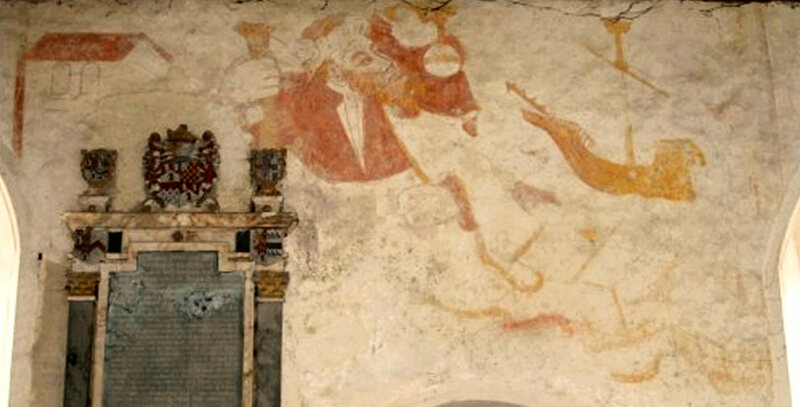 Revealed beneath plaster in 1885 and facing the unusual north door of Albury's Saxon Church is this c1480 wall painting of St Christopher. 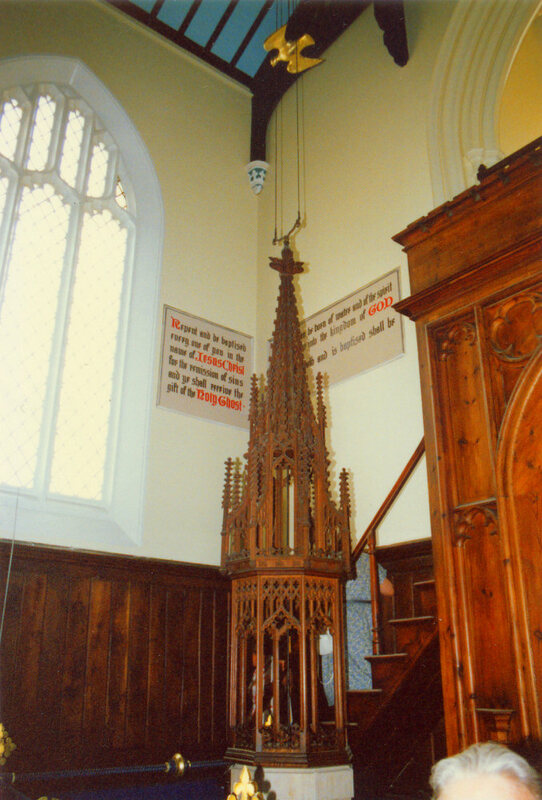 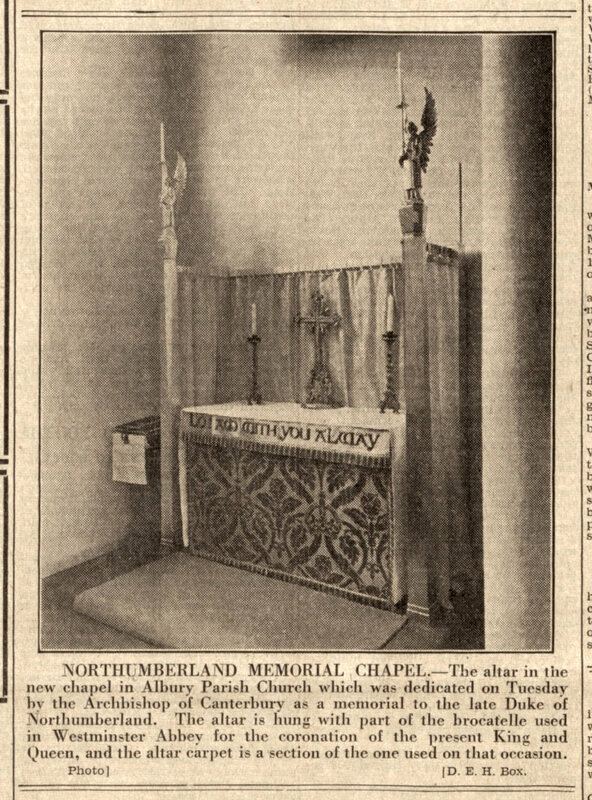 Albury Church's 1939 Northumberland Chapel was designed by Guildford Cathedral architect Edward Maufe and hung with brocatelle from King George VI's coronation. 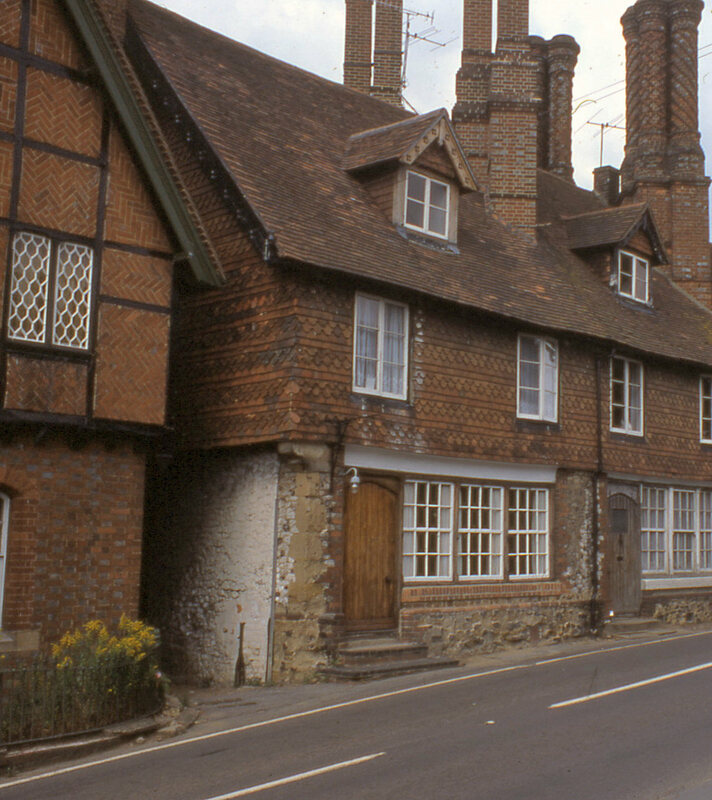 A detailed history of Albury, from 'ald' and 'burh', and Weston Street at British History Online is here: british-history.ac.uk/vch/surrey/vol3/pp72-77. 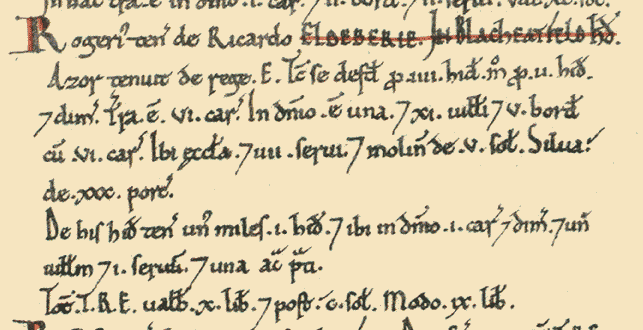 In 1066 Albury and 22 households appear in the Domesday Book. 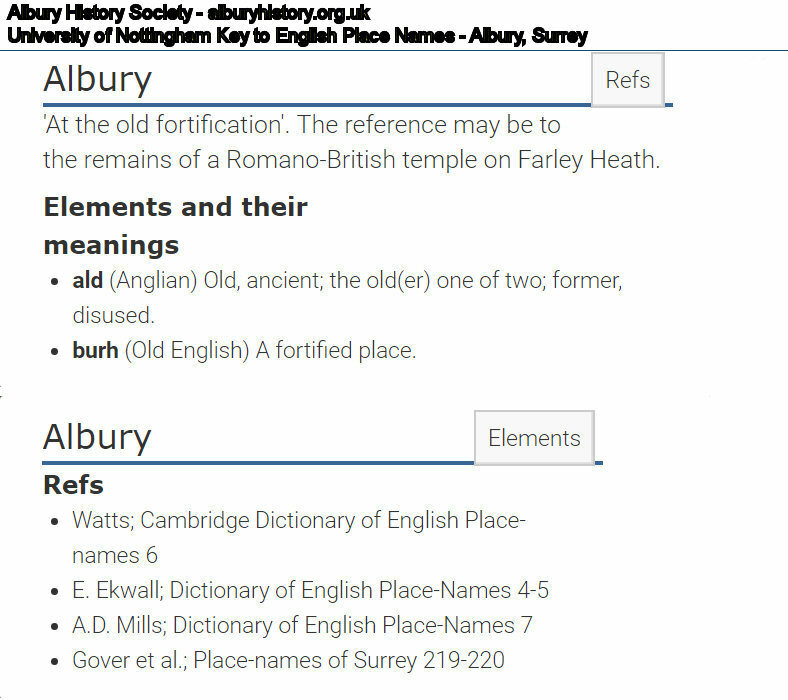 Over a dozen historic spellings of Albury in Blackheath Hundred are documented. 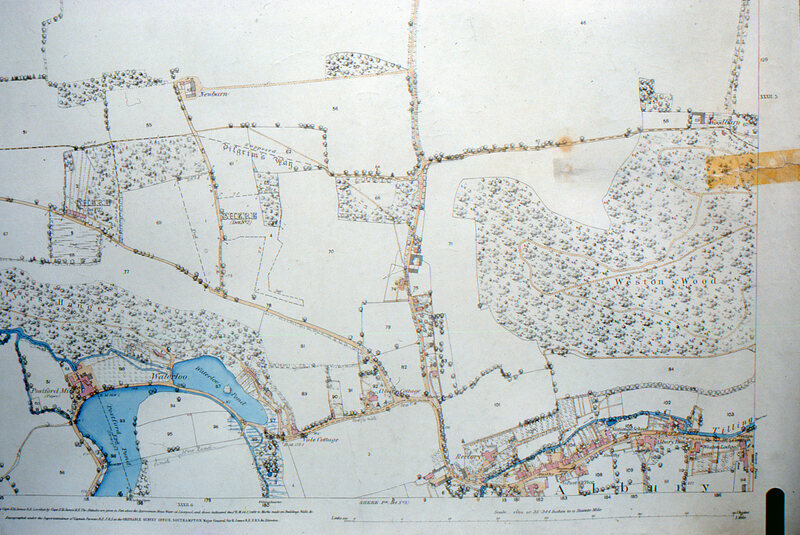 Several historical maps, some history and William Cobbett extracts from the University of Portsmouth are here: visionofbritain.org.uk/place/2719. 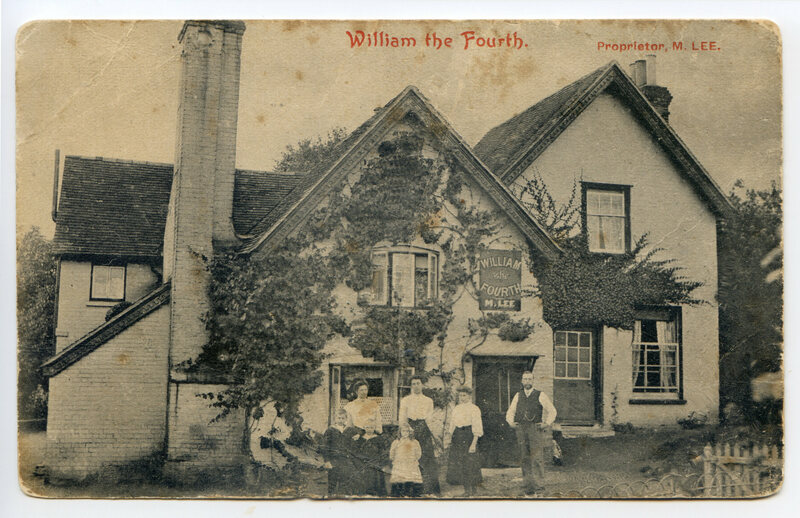 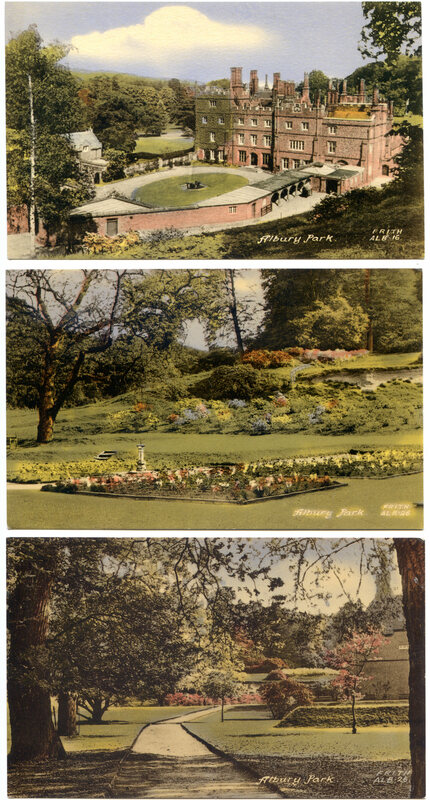 Albury photographer Percy Lloyd introduced postcards to Britain: penny-plain-tuppence-coloured; Lloyd's son interviewed: audio. 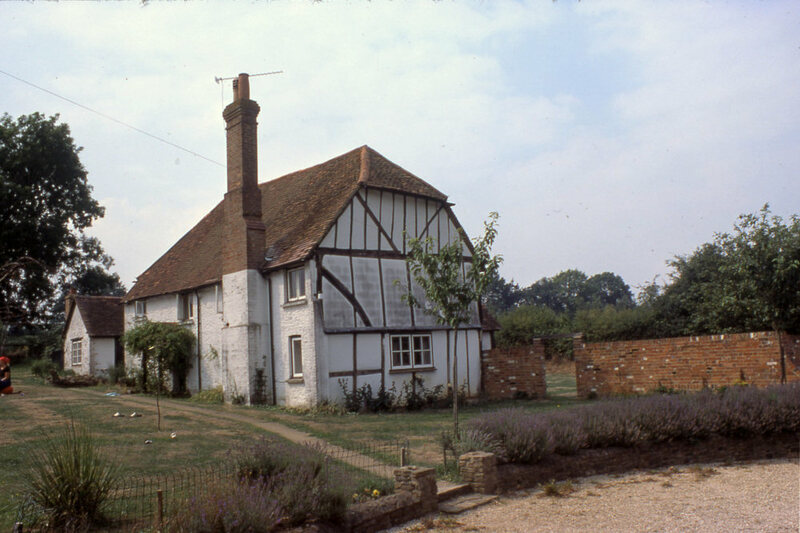 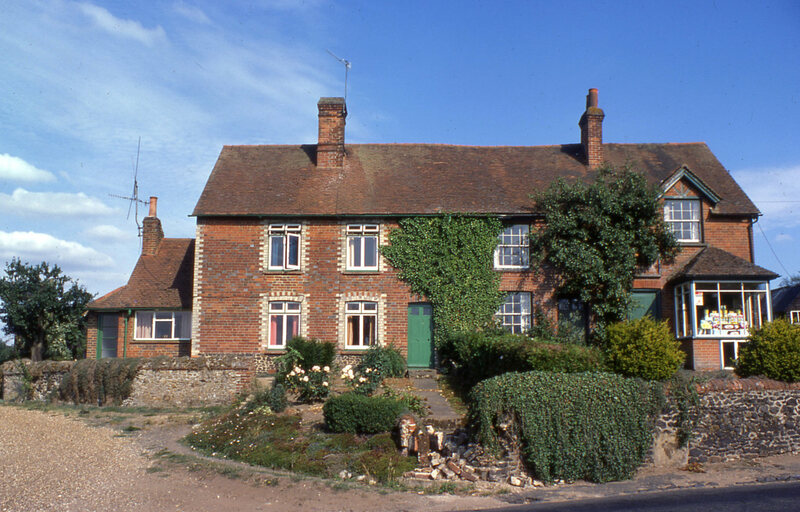 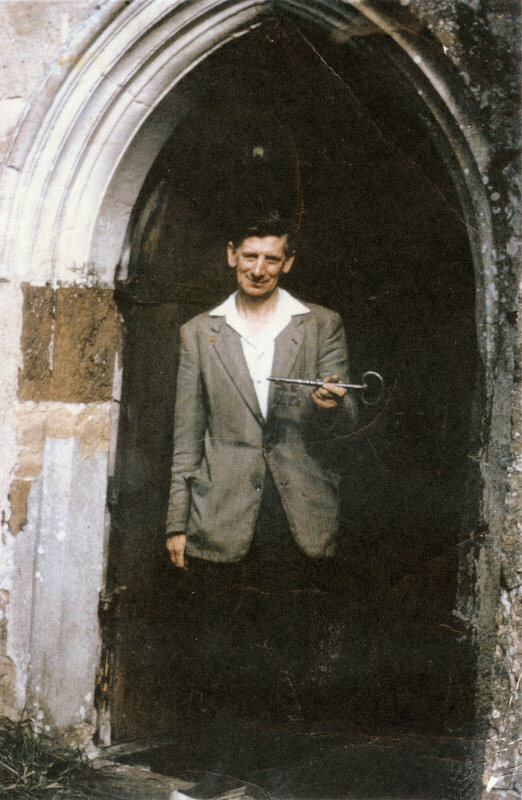 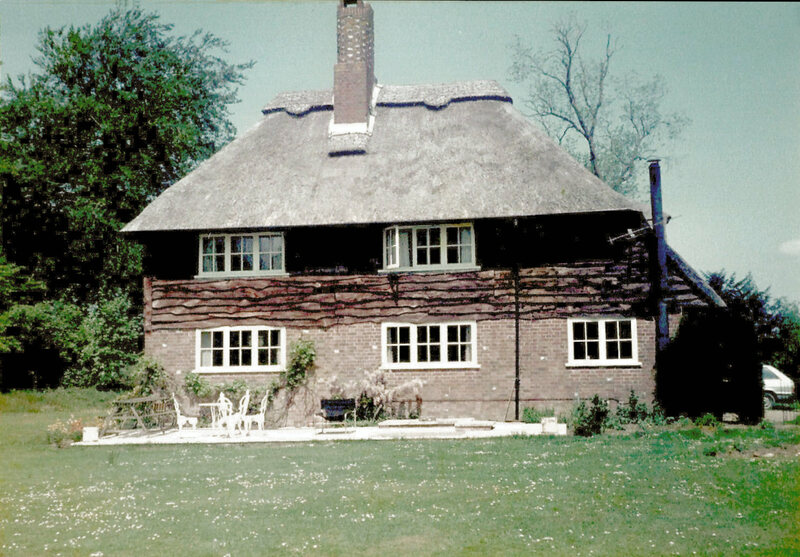 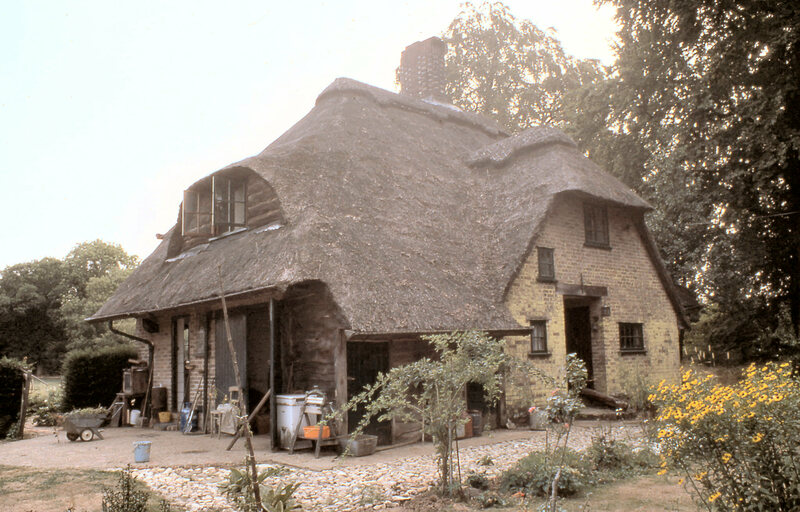 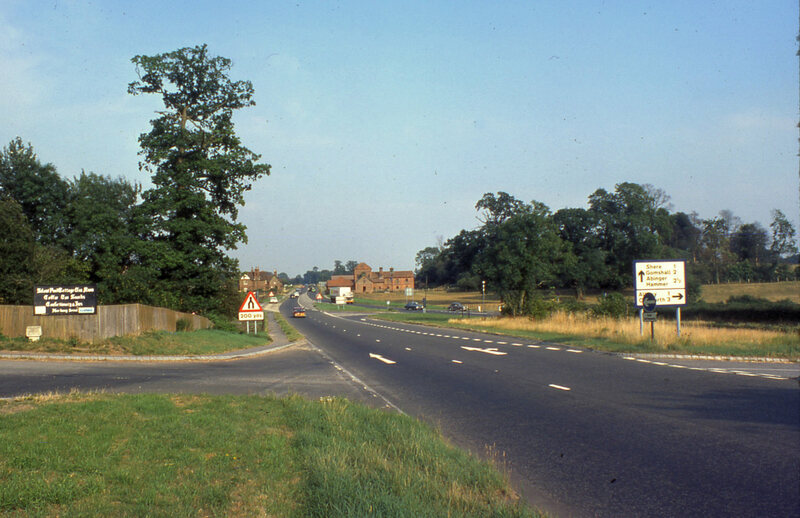 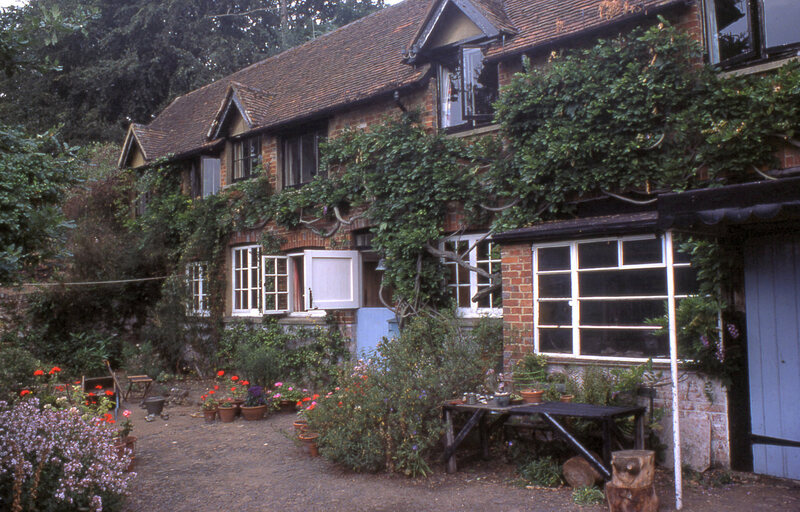 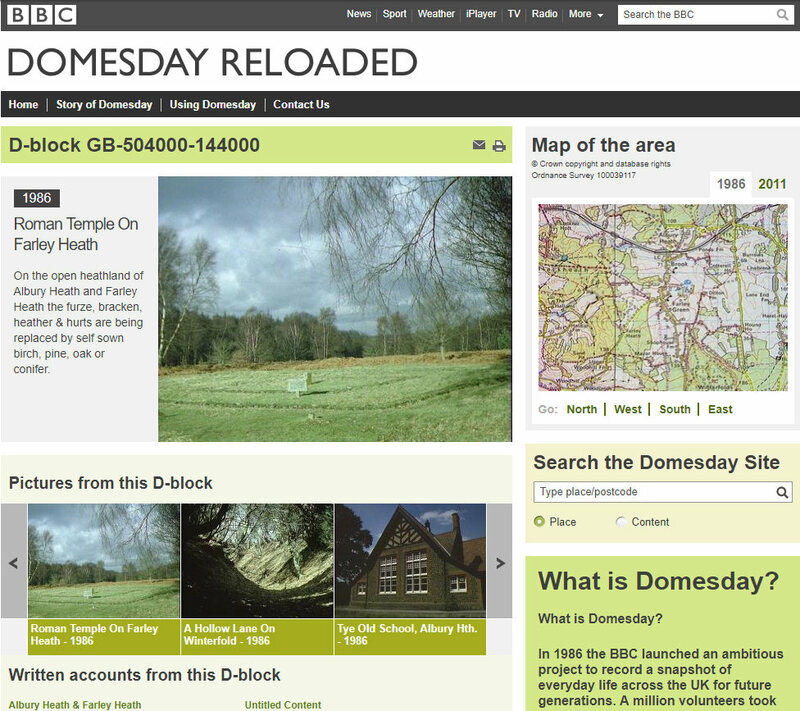 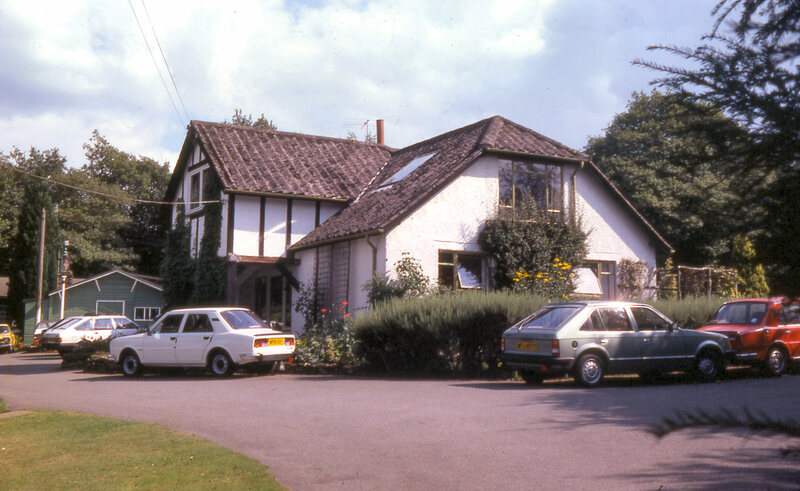 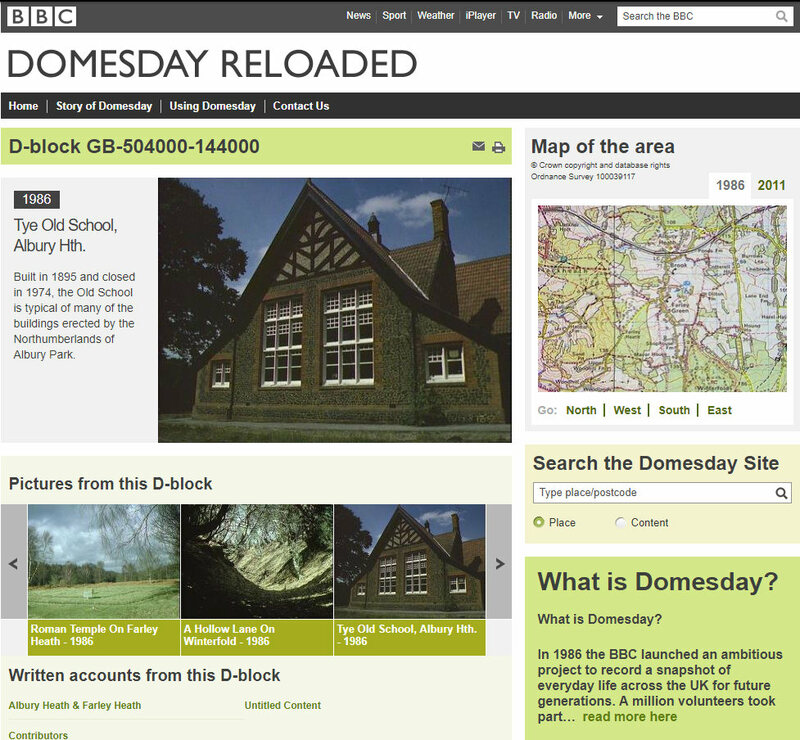 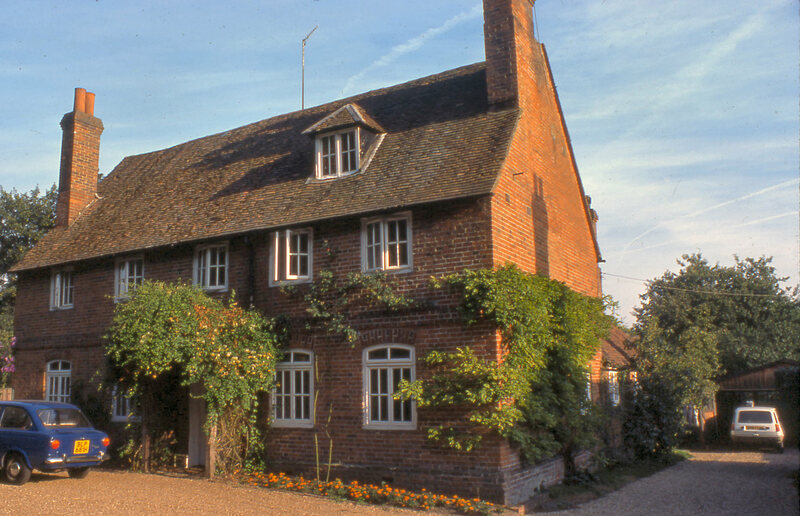 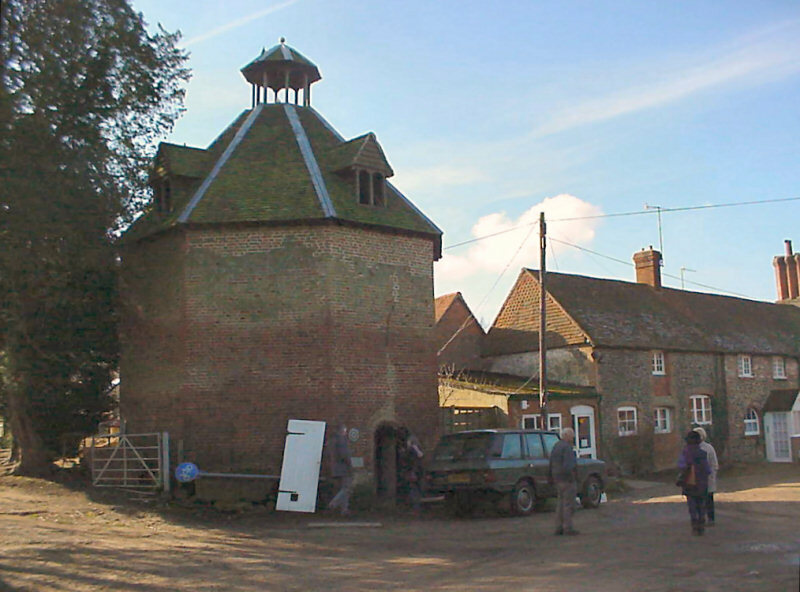 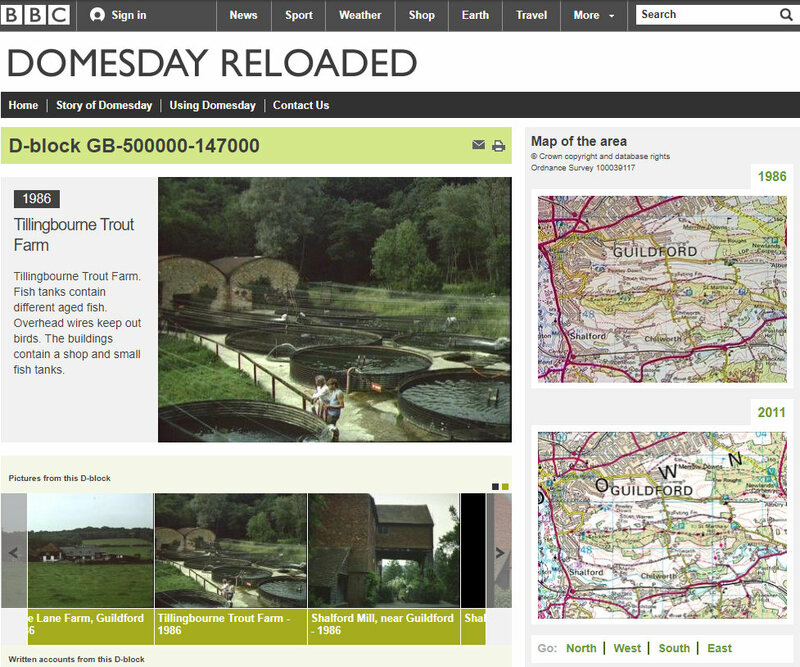 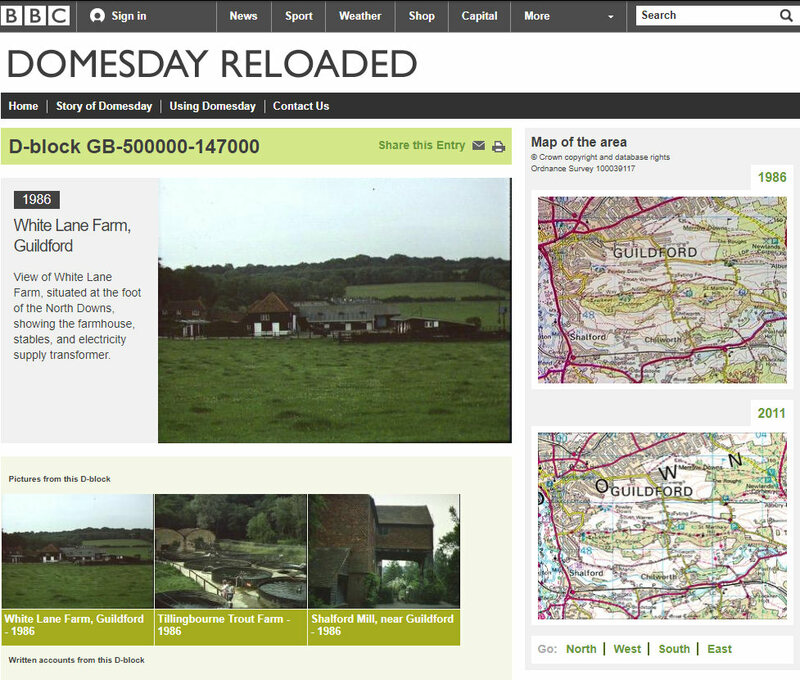 The BBC Domesday project of 1986 includes The Old School, Albury and Farley Heath, Tillingbourne Trout Farm, the Roman Temple and White Lane Farm. 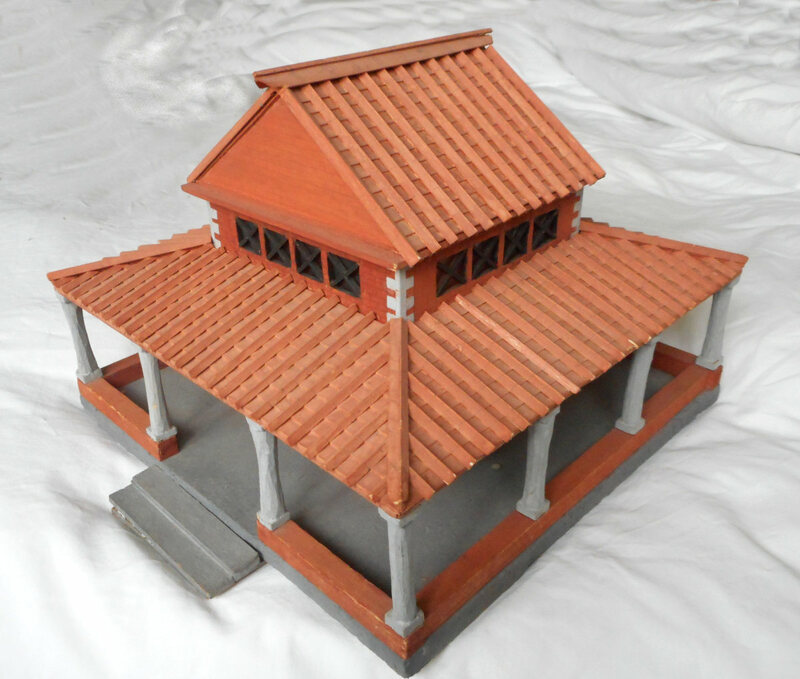 AHS has this model of Farley Heath Roman Temple, Friends of the Hurtwood have a few details, while a 147 page Surrey Archaeology paper is here. 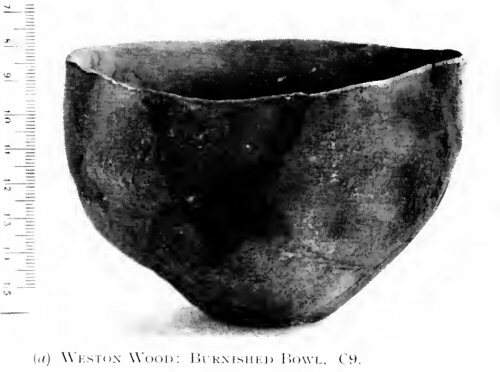 The story of this Samain bowl find is in Surrey Archaeological Collections of 1932 and a 1939 summary of Farley Green Temple appeared in Nature. 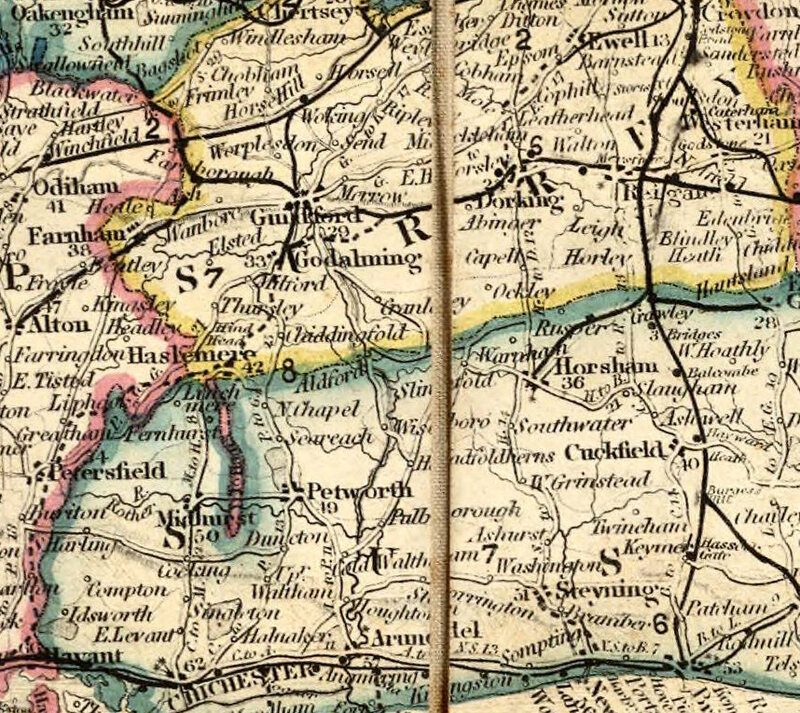 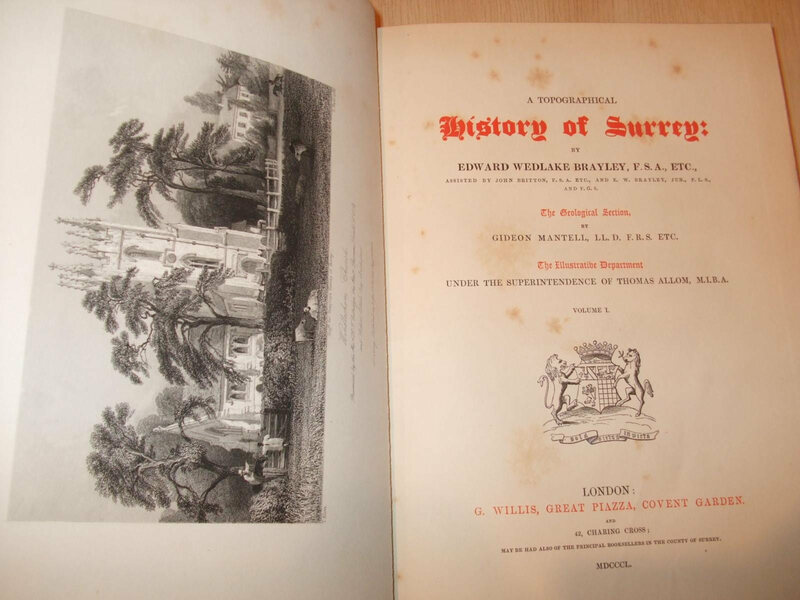 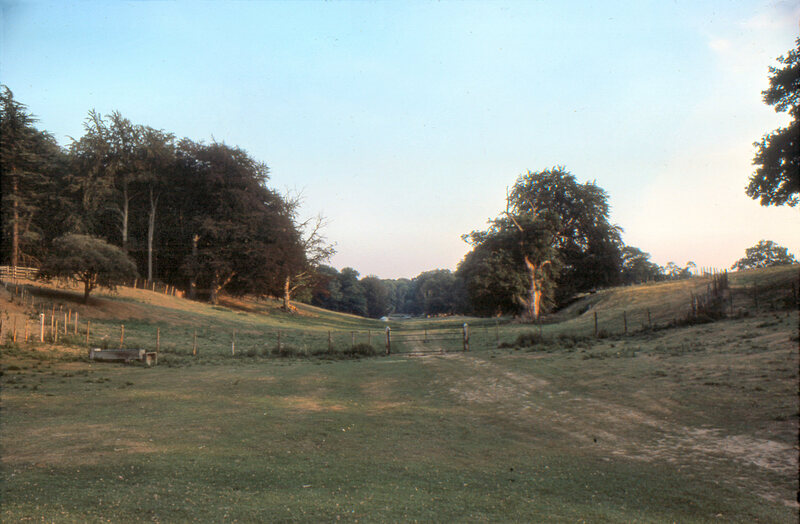 Much about 1841 Albury, the Roman site on Farley Heath and surrounding villages appears in A Topographical History of Surrey by E.W. 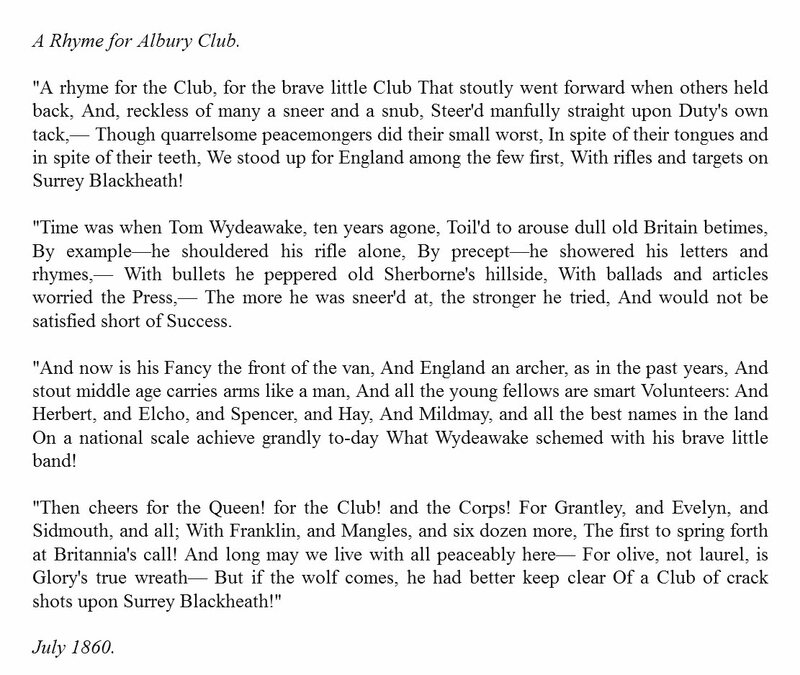 Brayley. 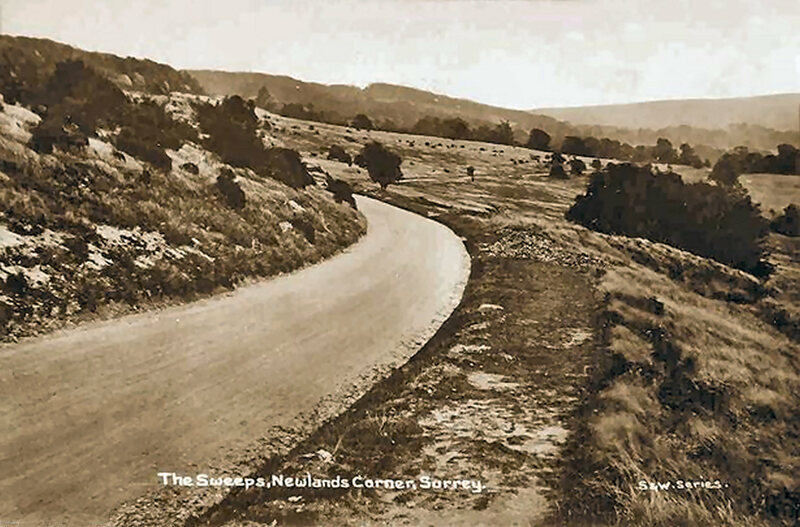 Seventy old photographs covering Albury, Silent Pool and Newlands Corner from 1890 are in the Francis Frith collection, here. 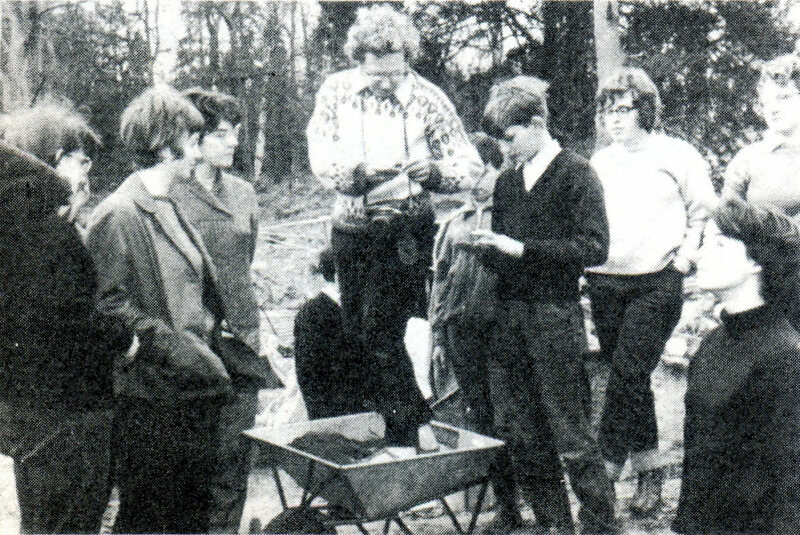 Bargate Stone, Hythe Sand, Gault Clay and Upper Greensand are explained in Newlands Corner - Albury Geology Trail, by Surrey RIGS. 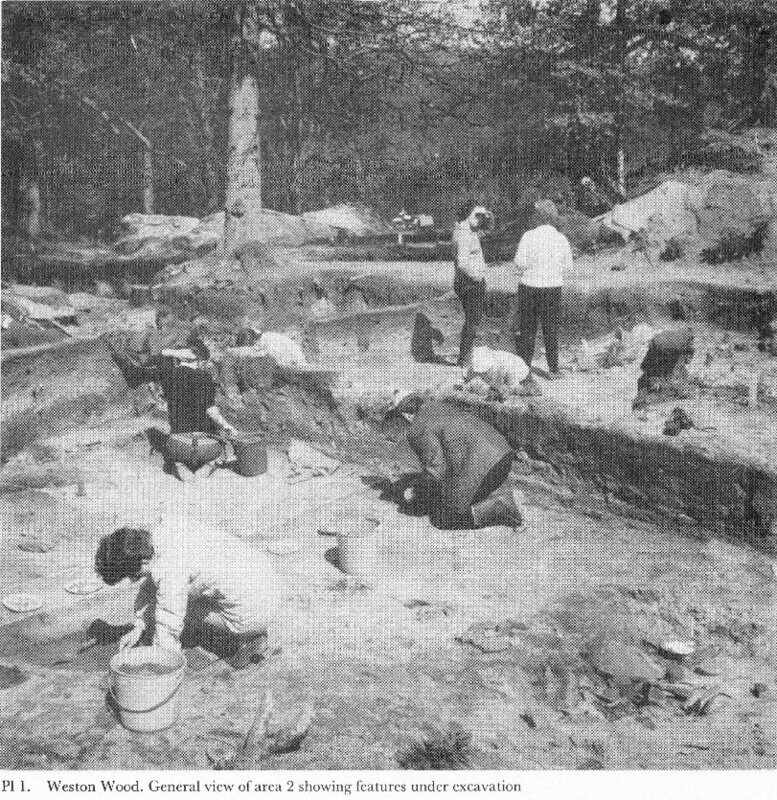 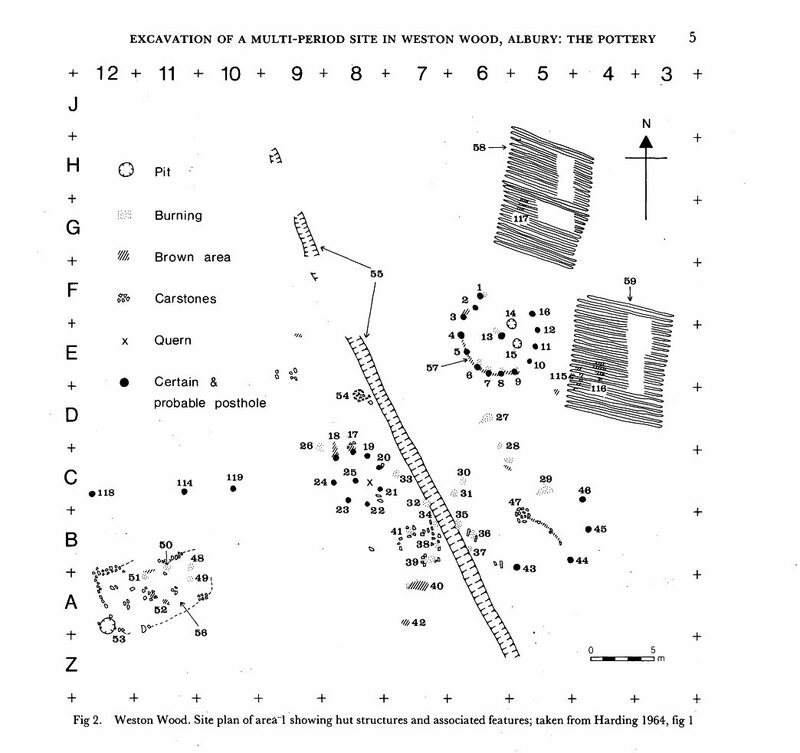 Joan Harding's 1963 Bronze Age Weston Wood excavation details are here, in Surrey Archaeology and audio 023. 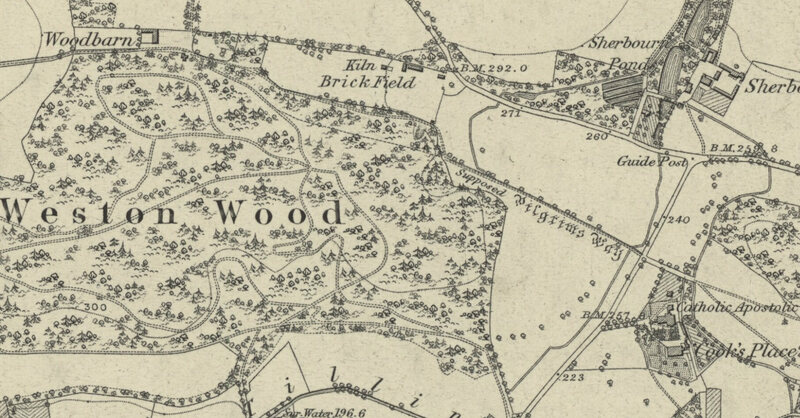 Megalithic Portal lists Albury Park Mound, Weston Wood Tumulus (demolished), Albury Fishponds Stone, Tyting Farm Barrow, St Martha's Circles and Lid Well. 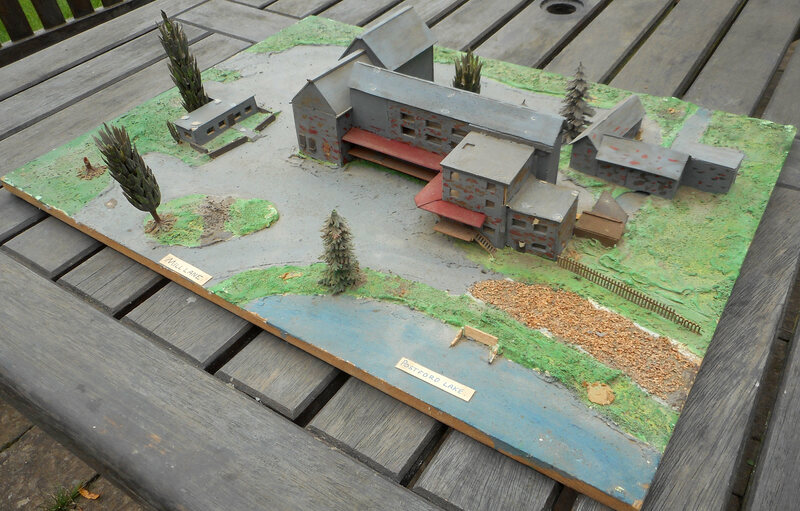 AHS has this 1830 court model of Albury Mill, when James Warner was executed for attempted murder and arson in the Swing Riots; page 23 here. 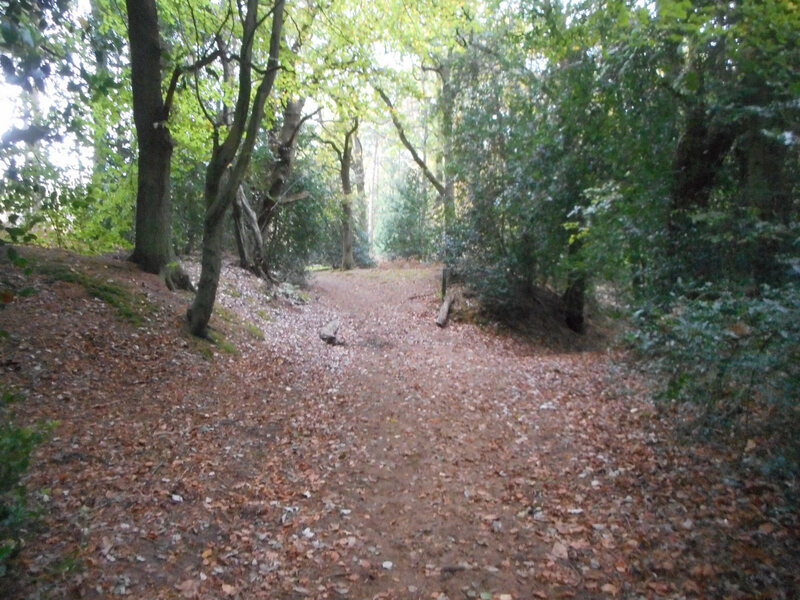 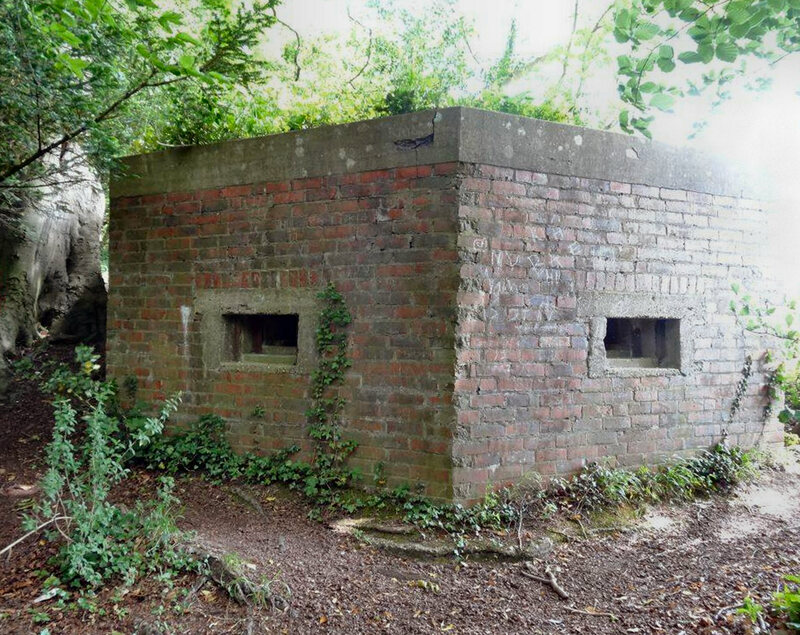 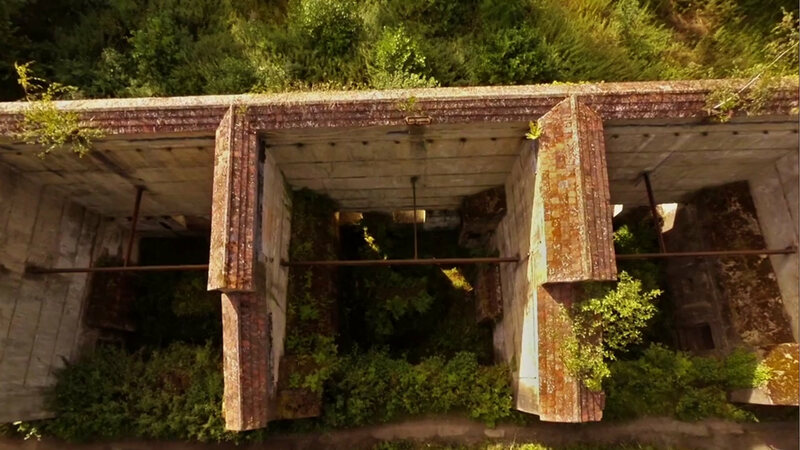 Scheduled monument Chilworth Gunpowder Works [video] had WW1 anti-aircraft guns and employed 600; details in Wey River and a walk by Glenys Crocker. 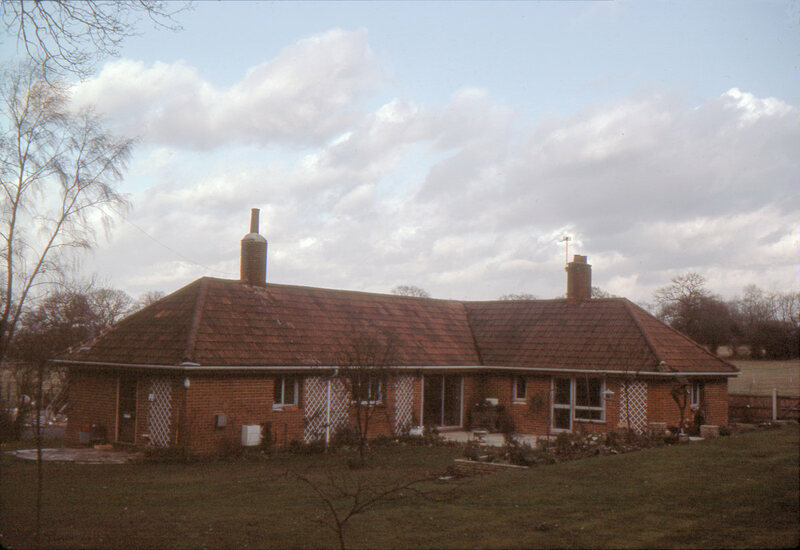 Albury's unusual octagonal Tudor Pigeon House in Weston Yard (for saltpetre in gunpowder) was restored by Dr Maurice Burton, 1979-1980; talk. 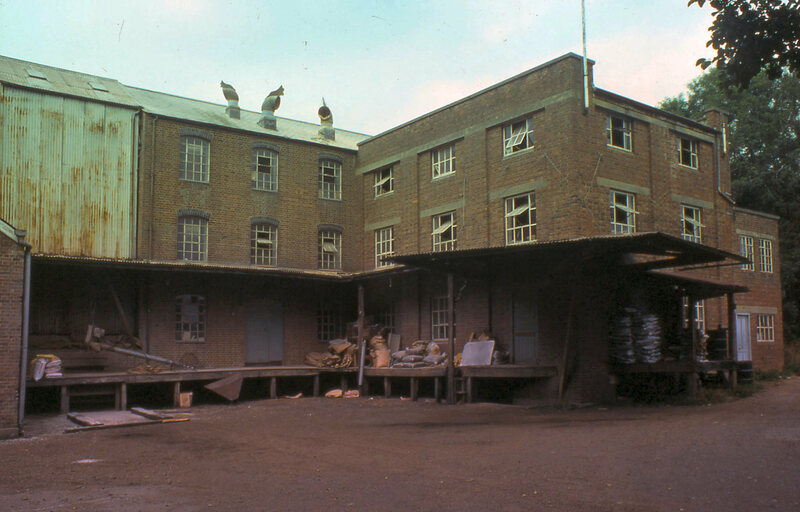 Albury Pigeon House in Weston Yard is visible beyond the estate Carpenters Yard and its workshops. 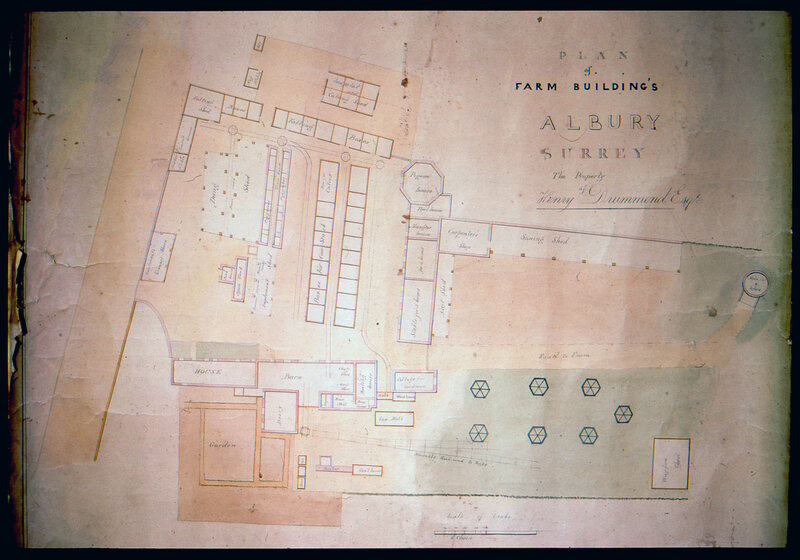 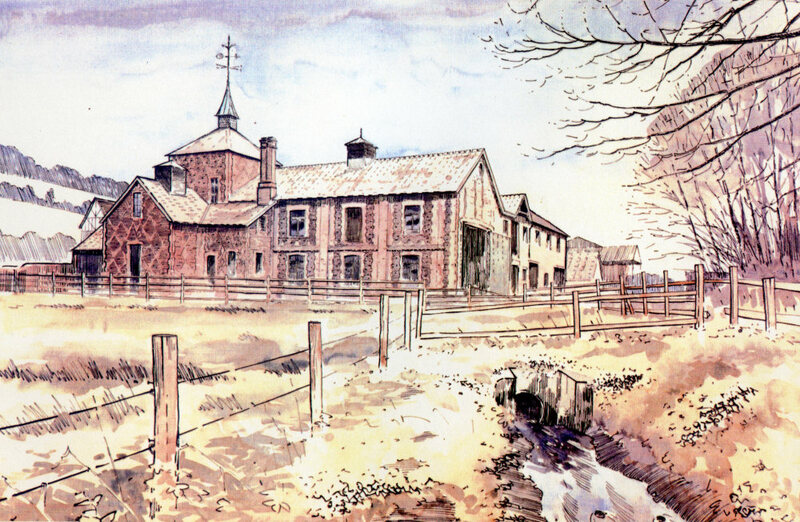 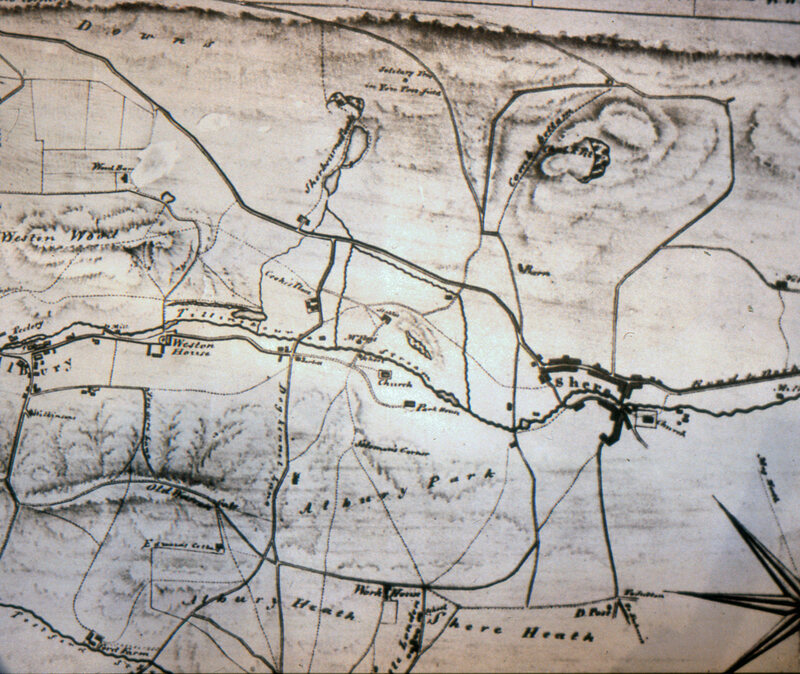 Henry Drummond's Plan of Farm Buildings shows a network of tram roads and turntables in Albury Estate yard, with moveable railroad tracks to the hay ricks. 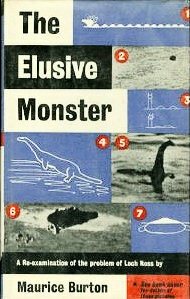 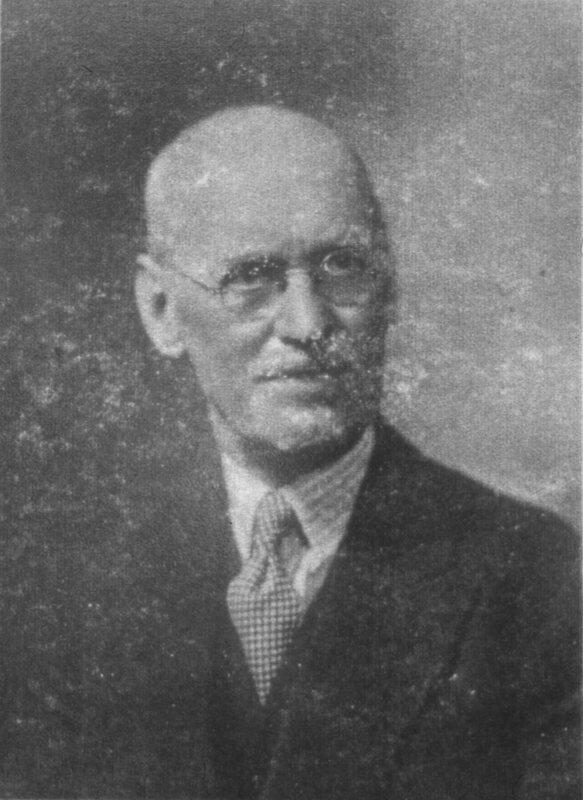 Maurice Burton, zoologist, Elusive Monster author and New Scientist writer dismissing Loch Ness monster claims, lived at Weston House. 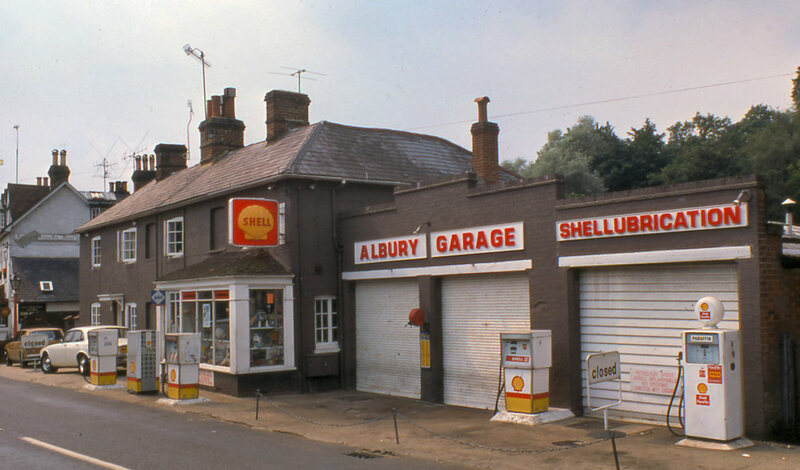 Albury had a bakery and petrol station until the 70s. 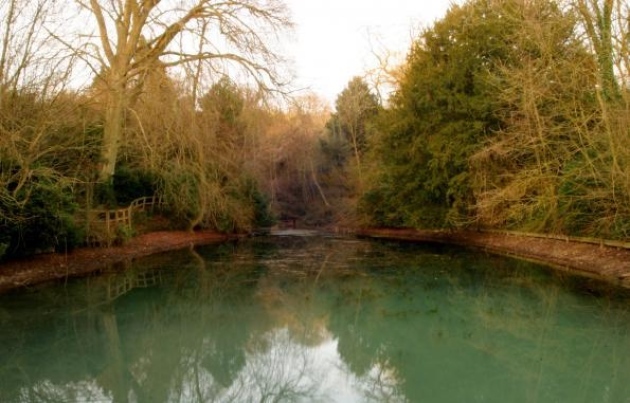 Surrey Life has articles on Silent Pool, Albury Park Mansion and Albury. 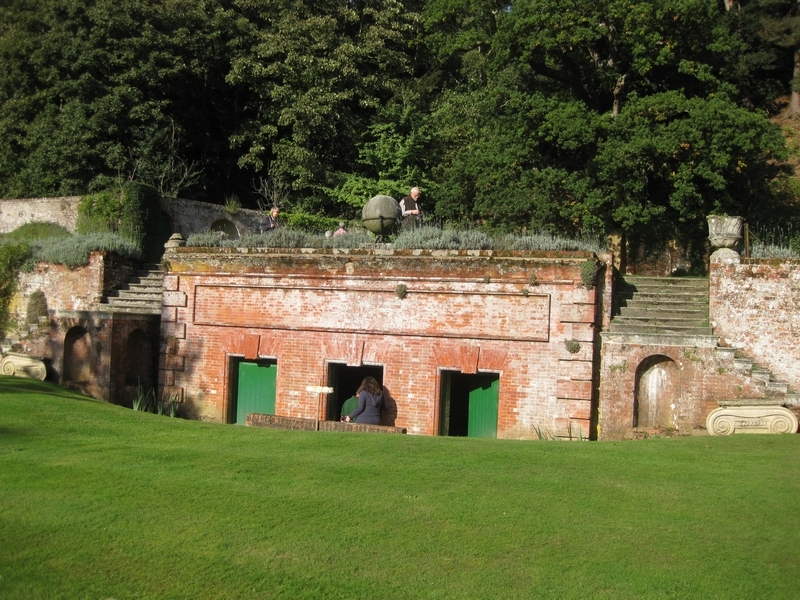 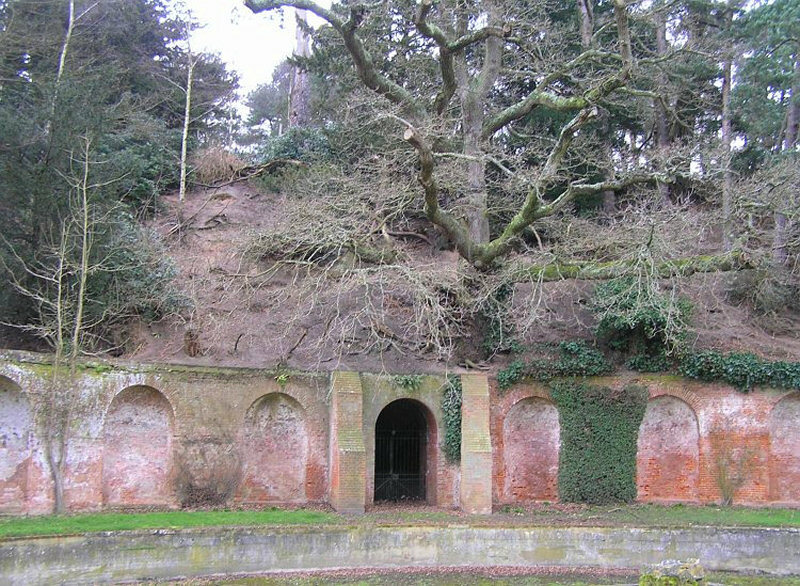 Albury Park gardens, terrace, tunnel under Silver Wood and 'Roman Baths' created by John Evelyn around 1665 are described in London's Lost Gardens. 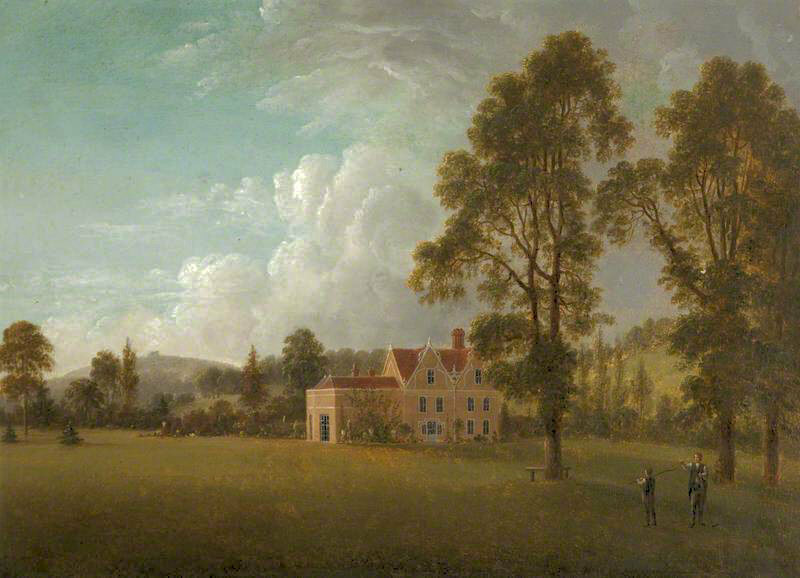 Both Albury Park and Weston House had ice houses and some watercolours of Albury by John Hassell from about 1800 are here. 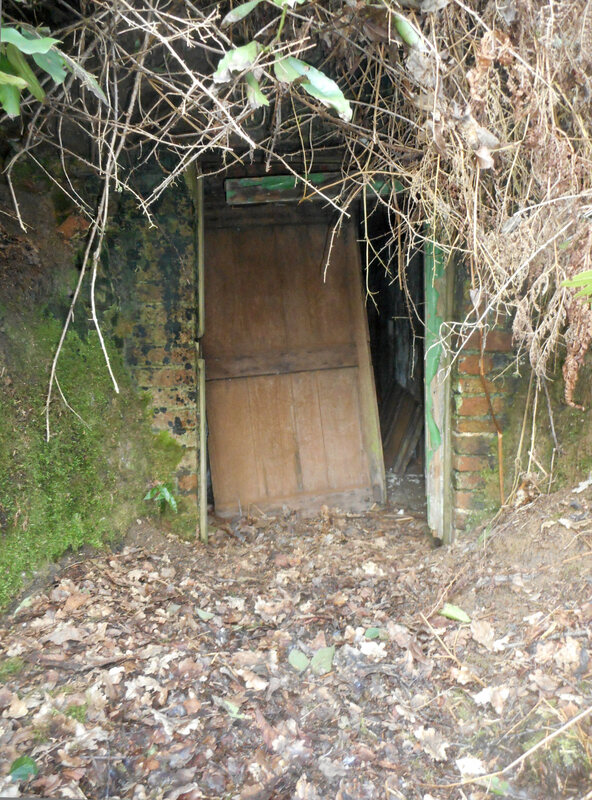 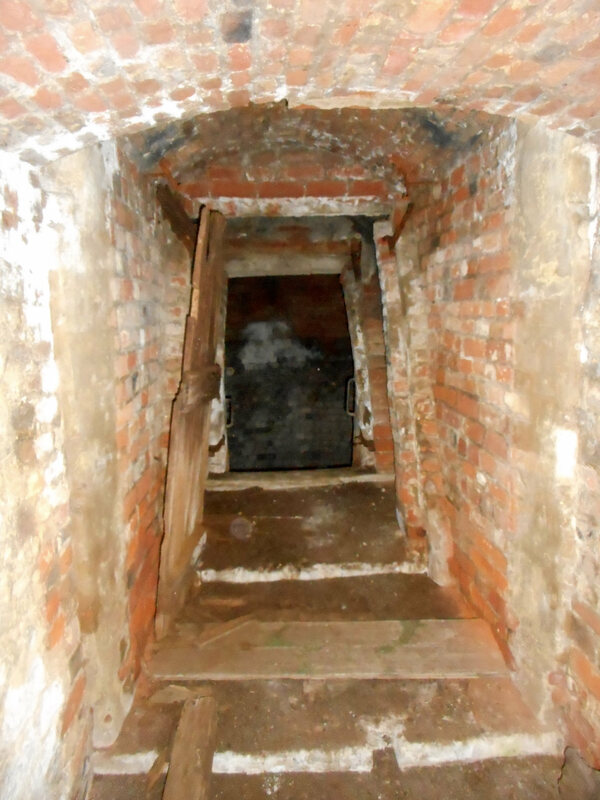 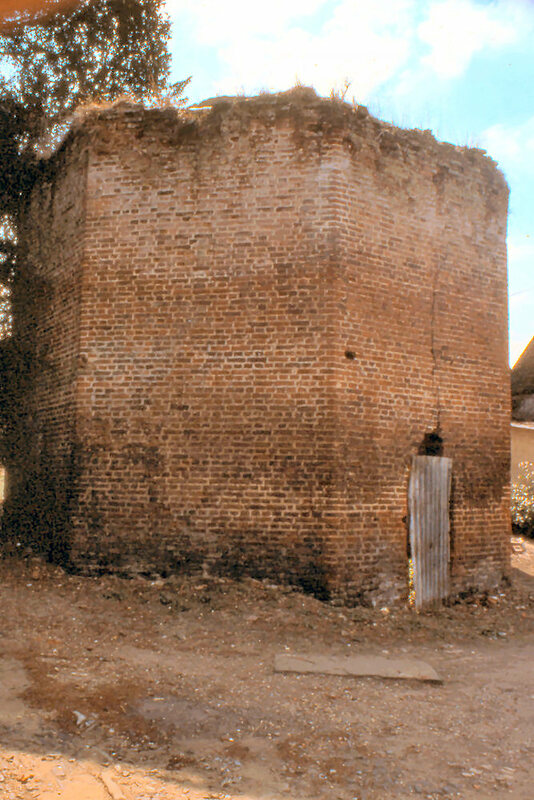 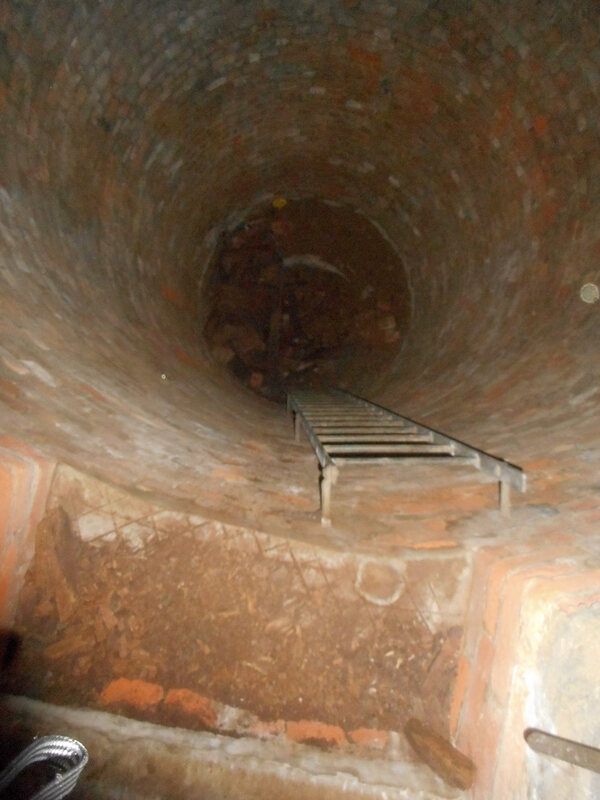 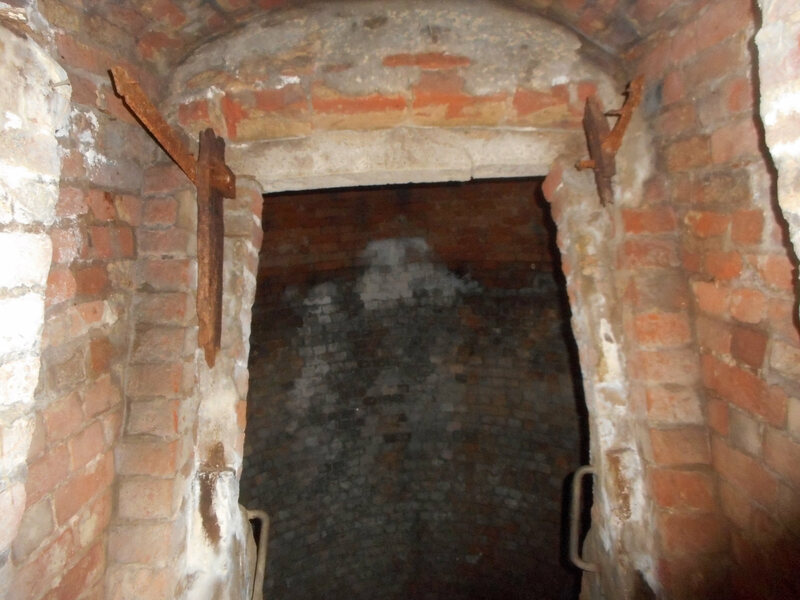 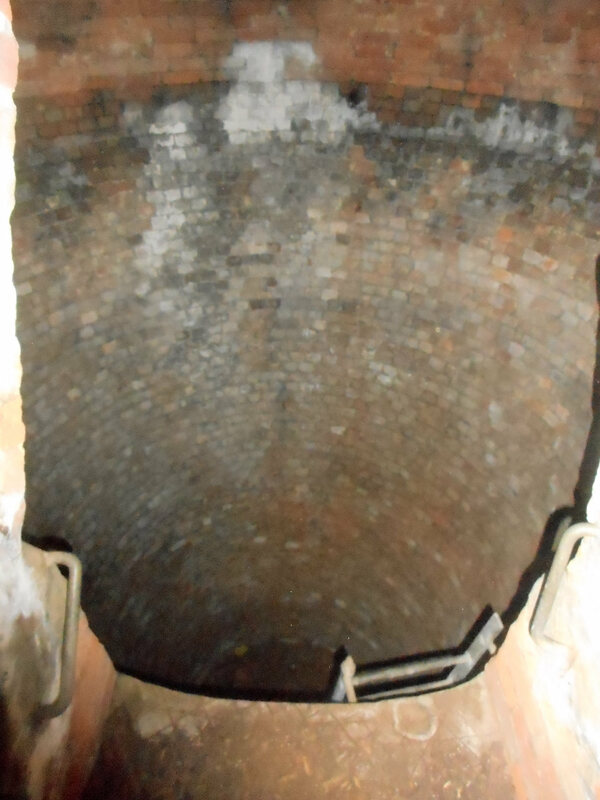 Albury Park Mansion's hillside icehouse had a door leading to a brick lined passage, a further door and then a ladder into a deep pit for ice and produce. 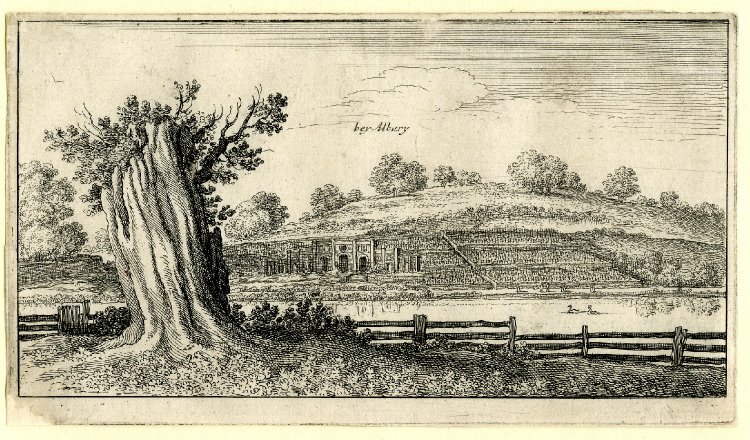 A lake, vineyard, swans and an arched building are depicted in a 1645 Wenceslaus Hollar print of Albury at the British Museum. 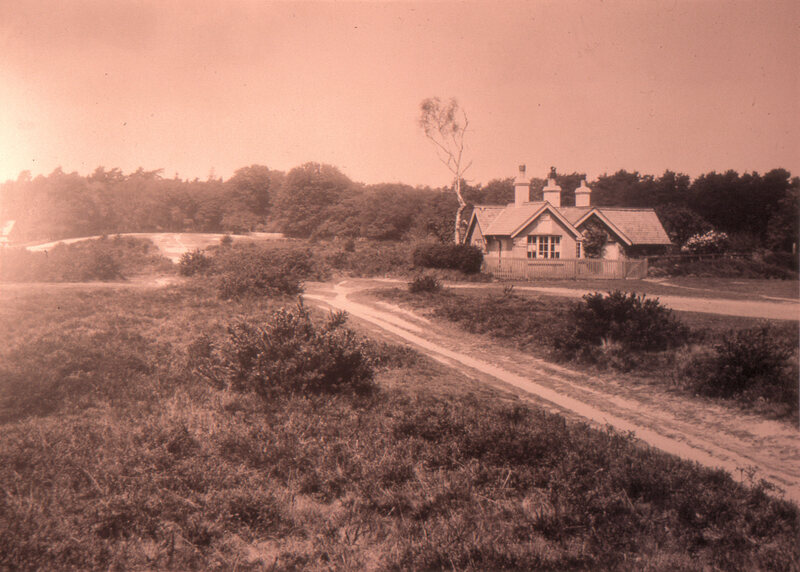 Dog Kennel Lane connected Albury Heath with Albury Green until Henry Drummond constructed New Road around 1842 and enclosed the Park. 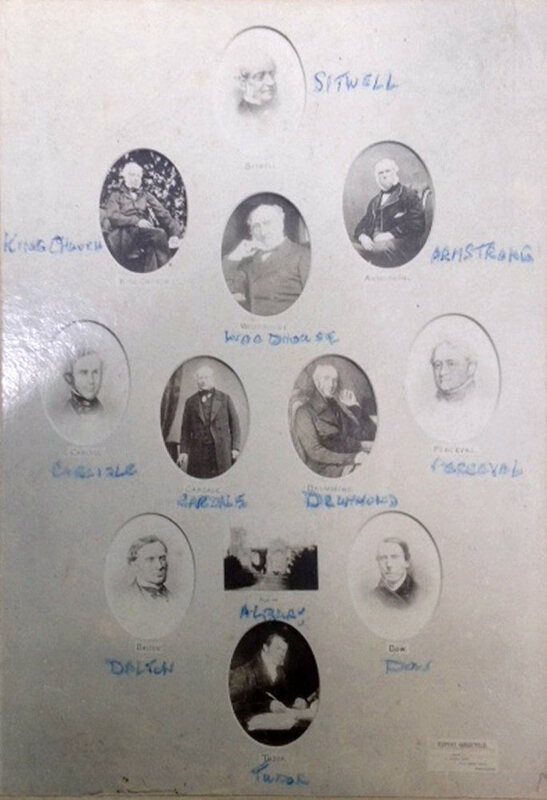 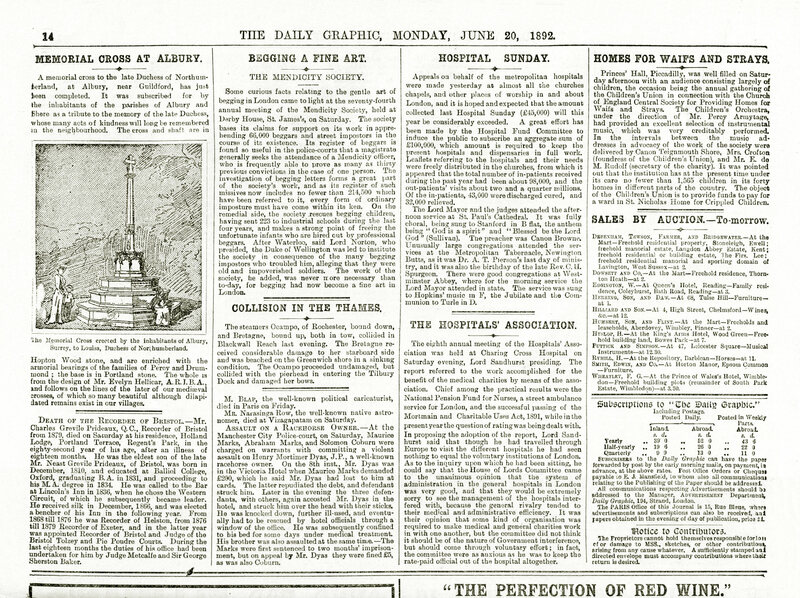 1850s photographs show eleven Apostles and the AHS talk about the Irvingite Albury Conferences, Albury and the Catholic Apostolic Church by Dr Tim Grass, is here. 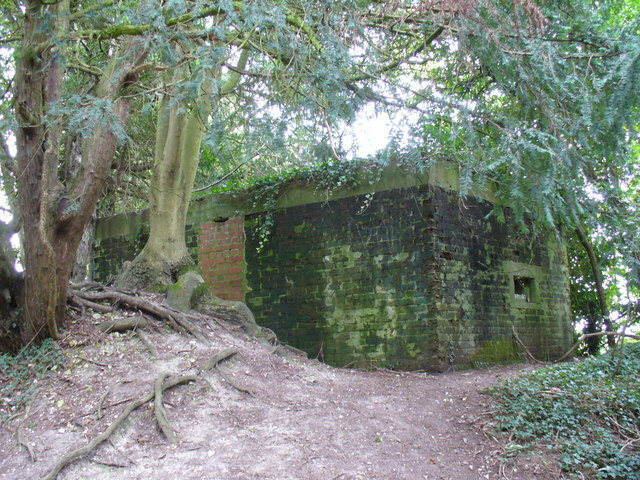 A map of North Downs wartime GHQ Line defence pillboxes, with some design details, is at exploringsurreyspast.org.uk/surrey_pillboxes. 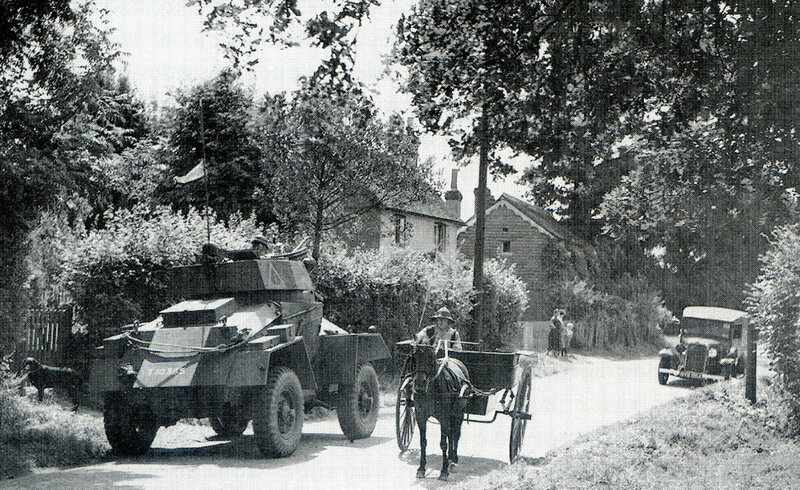 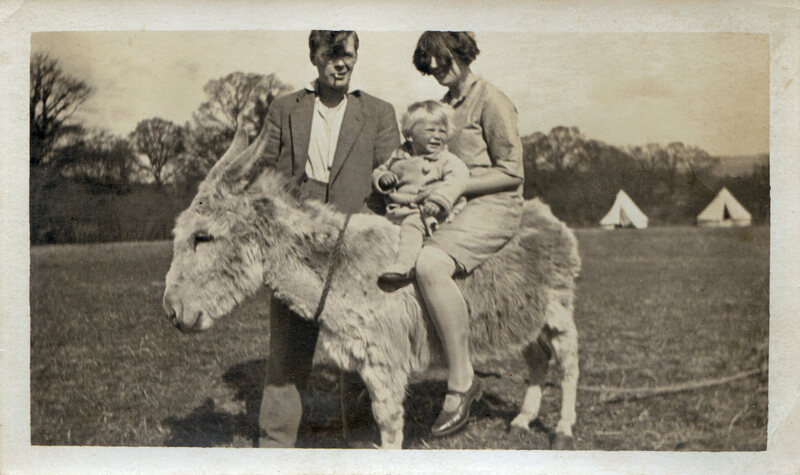 The Mass Observation diary of Helen Lloyd at Weston House describes anti-tank defences... and how her car went into the Tillingbourne. 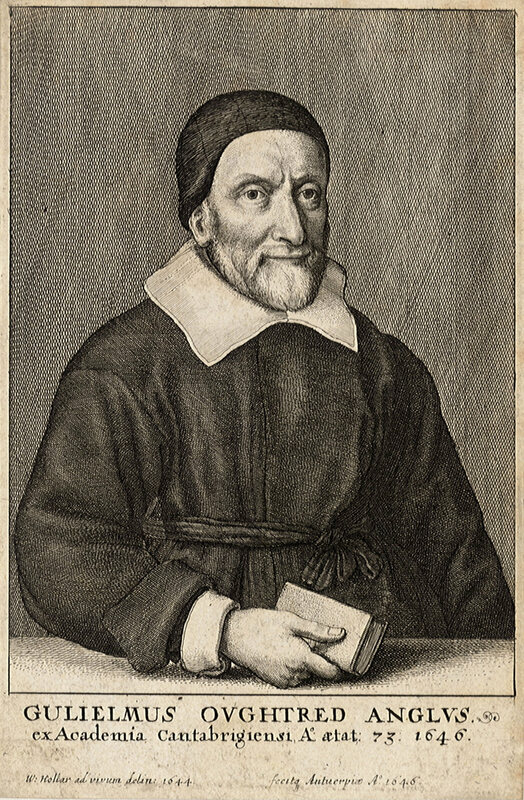 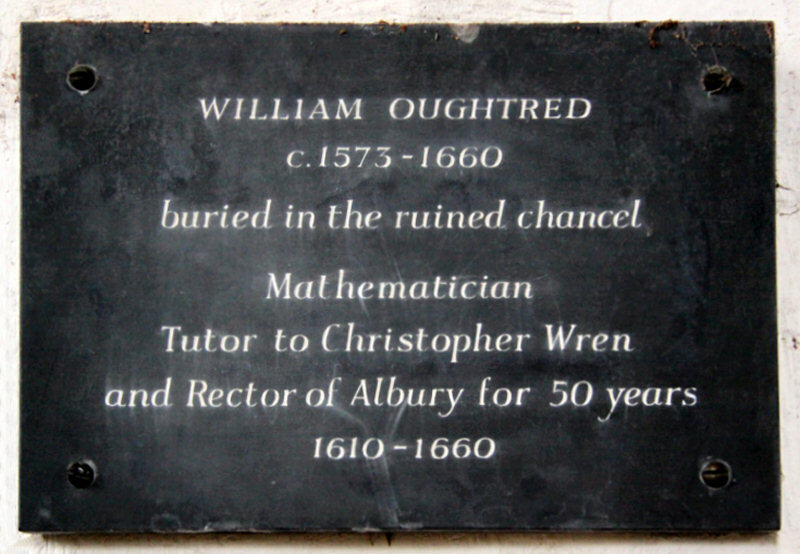 1600s Albury rector William Oughtred, inventor of the slide rule and 'x' for multiplication, has a plaque in the Saxon Church and a biography in Geek Atlas. 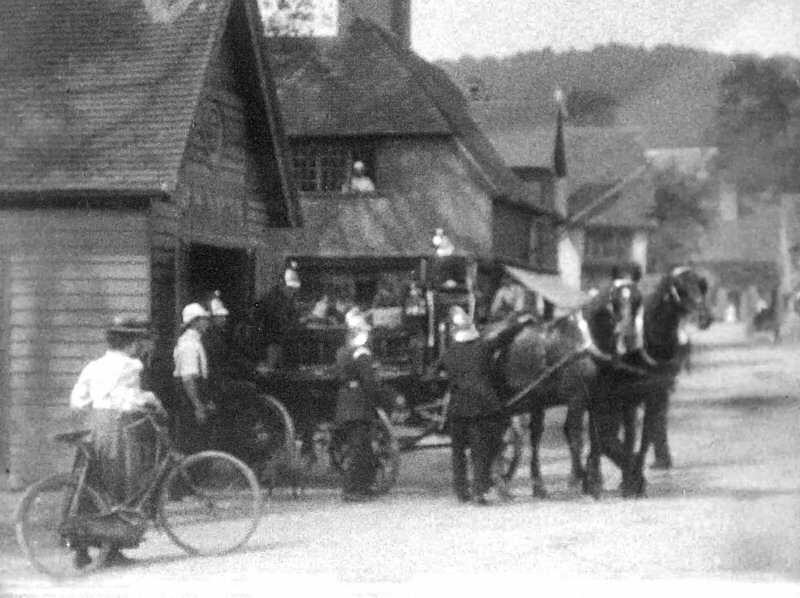 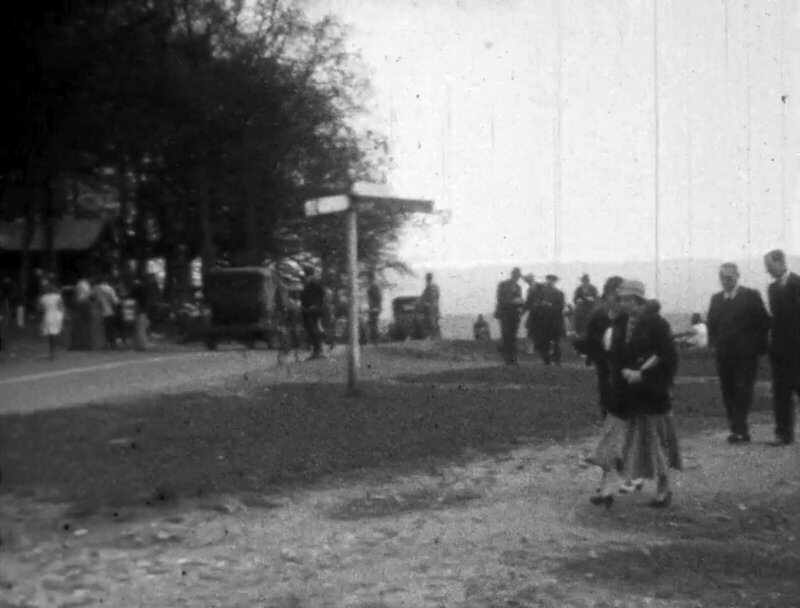 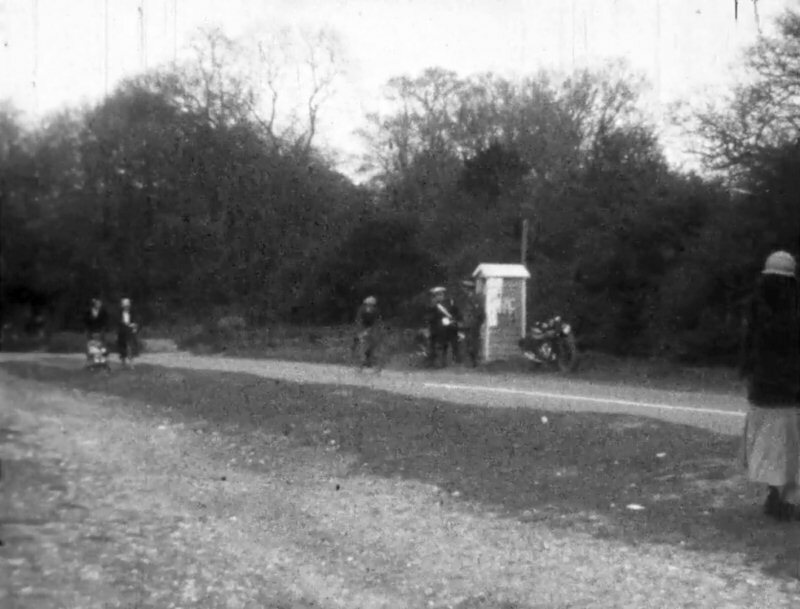 British Film Institute has 1899 footage by Charles Goodwin Norton of Shere and Albury Volunteer Fire Brigade leaving the fire station in Shere on a turn-out: video. 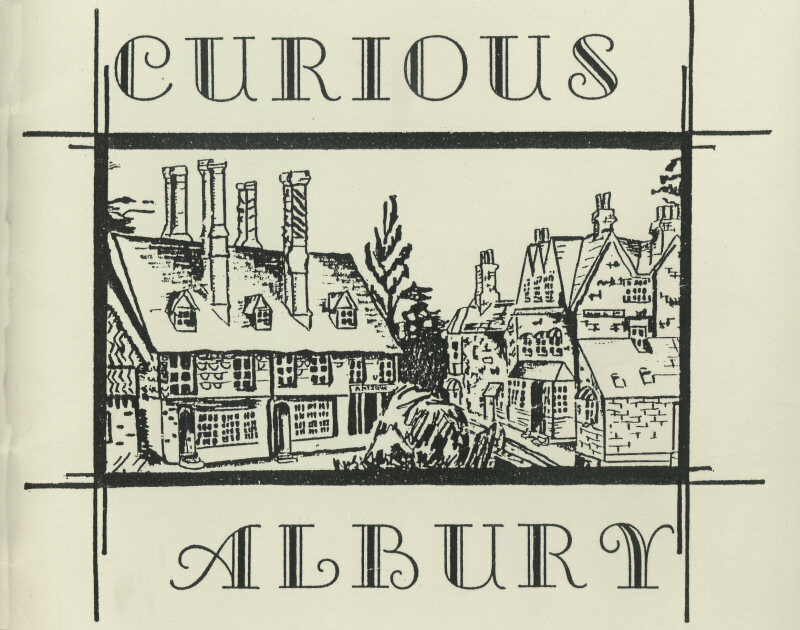 Maps and details of Albury, Weston Street, Brook, Little London and Farley Heath are in the 1980 booklet Curious Albury by Rideout and Brown. 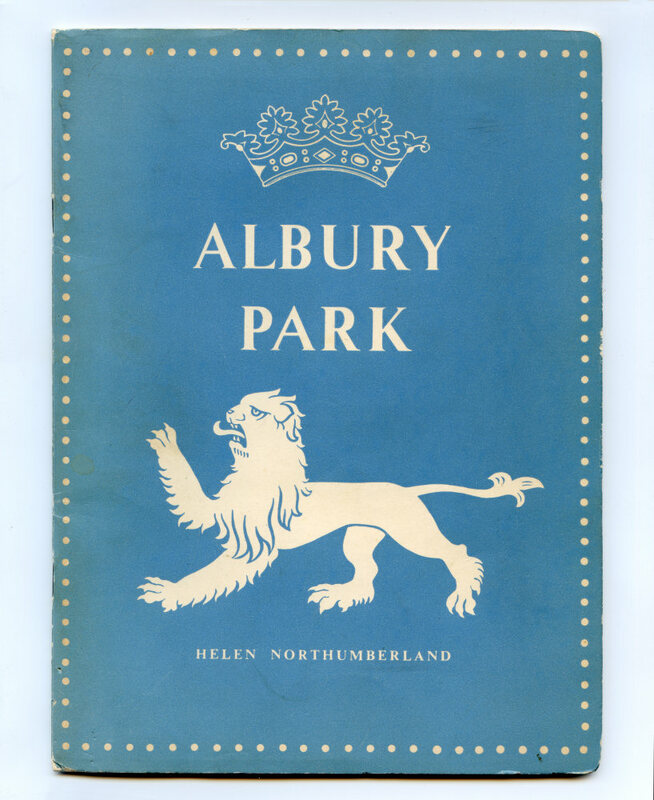 A comprehensive 1951 guide to the Park and 'gardens which, without exception, are the prettiest in England' is Albury Park by Helen Northumberland. 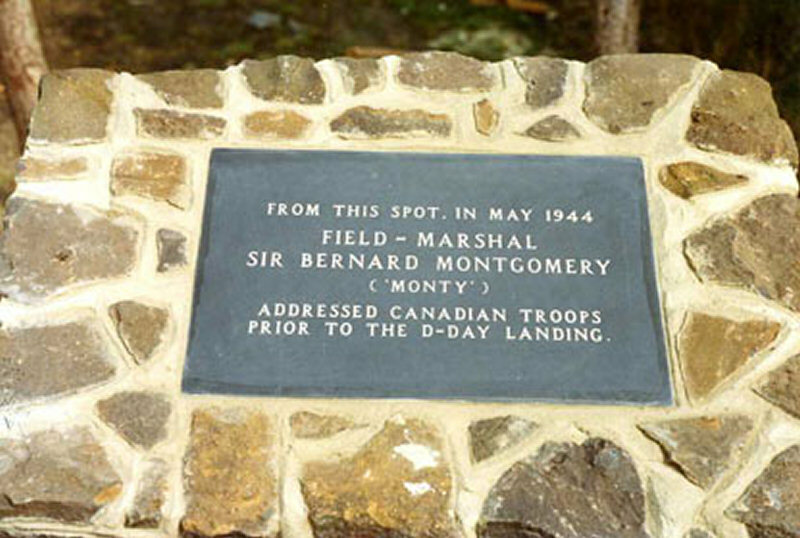 Albury Trust erected Albury Heath's Field Marshal Montgomery Memorial, commemorating the review of Canadian troops in May 1944 prior to D-Day landings: audio. 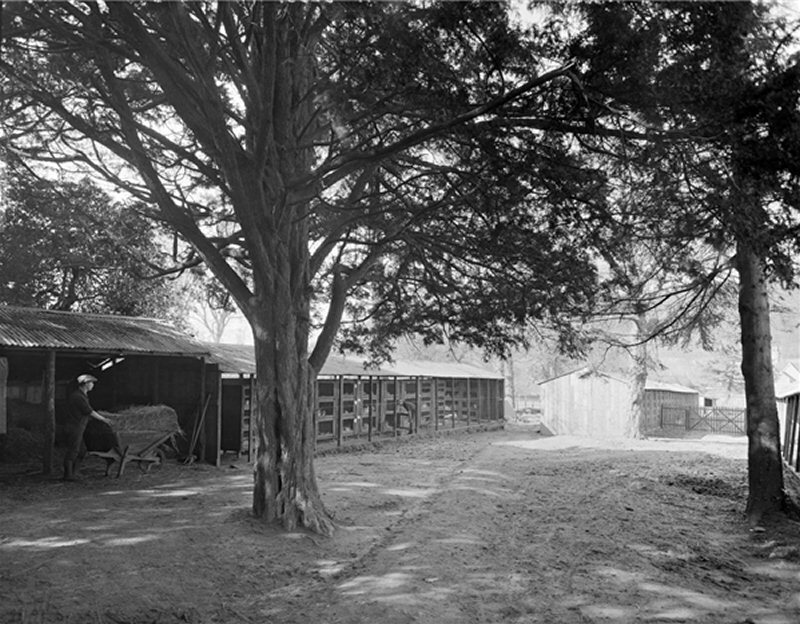 Country Life has old photographs of Albury, including the Chinchilla rabbit farm at Albury Park run by Gavin Maxwell's aunt, in 1927, here. 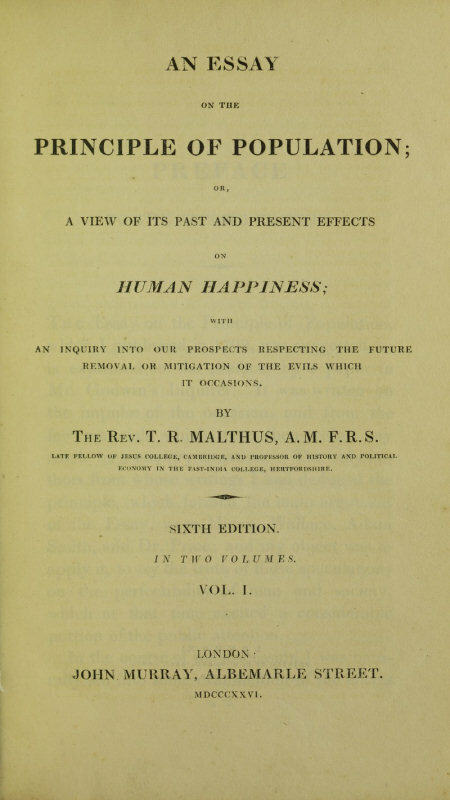 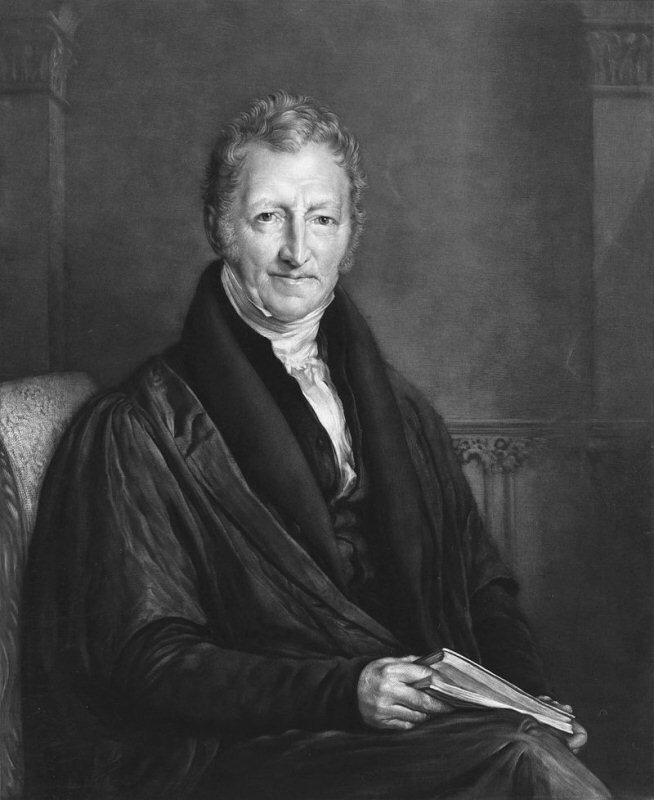 Thomas Malthus, whose Principle of Population inspired Darwin, lived at Dalton Hill. 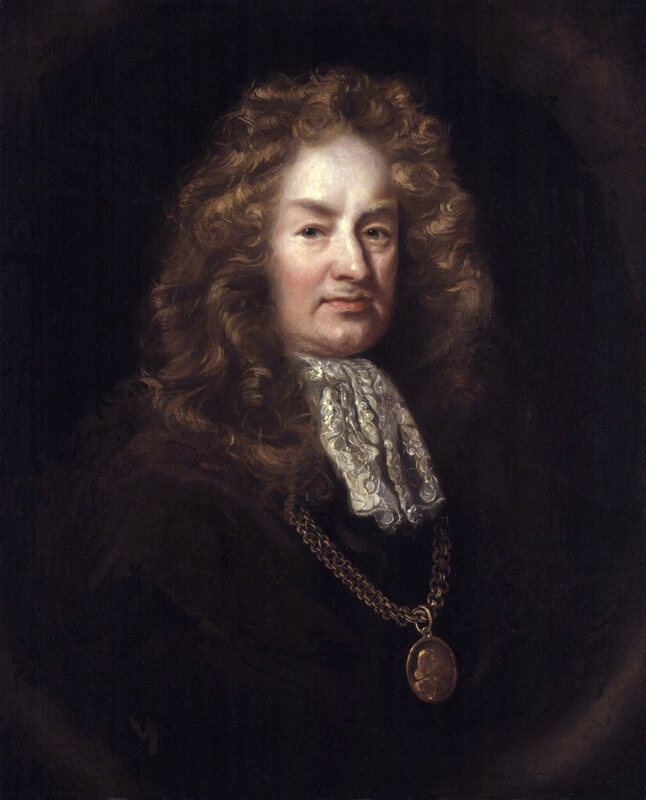 Antiquary Elias Ashmole lived at Weston House. 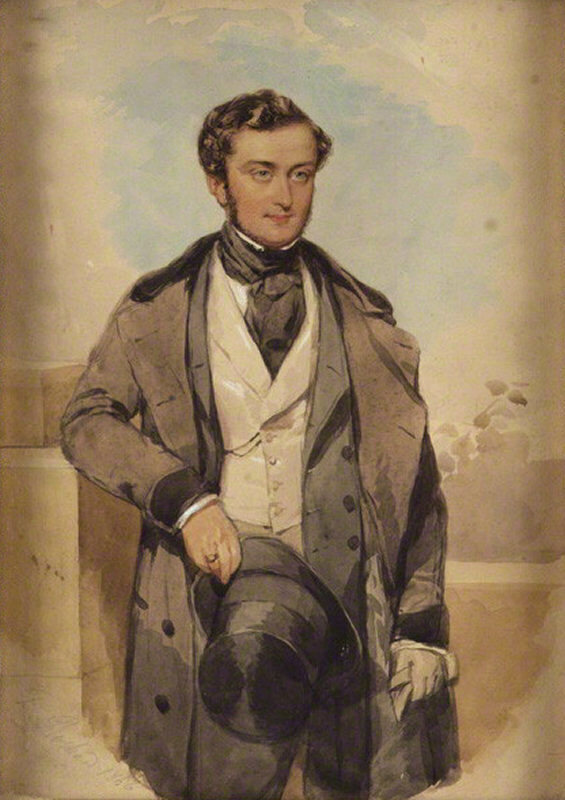 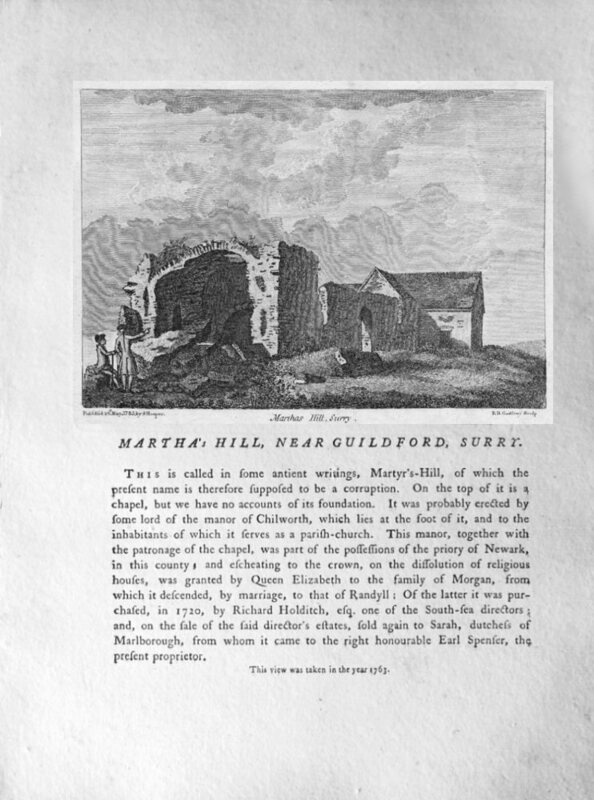 Proverbial Philosophy author Martin Tupper excavated Roman remains and initiated the volunteer Albury Rifle Club in 1848. 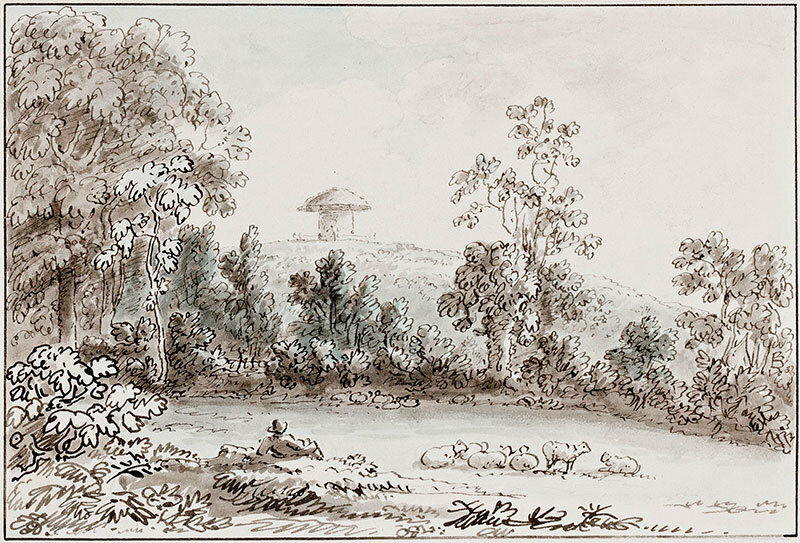 Albury House in 1792 and hilltop hut by 'Man Mushroom' Anthony Devis, an early umbrella user, described in Martin Tupper's autobiography. 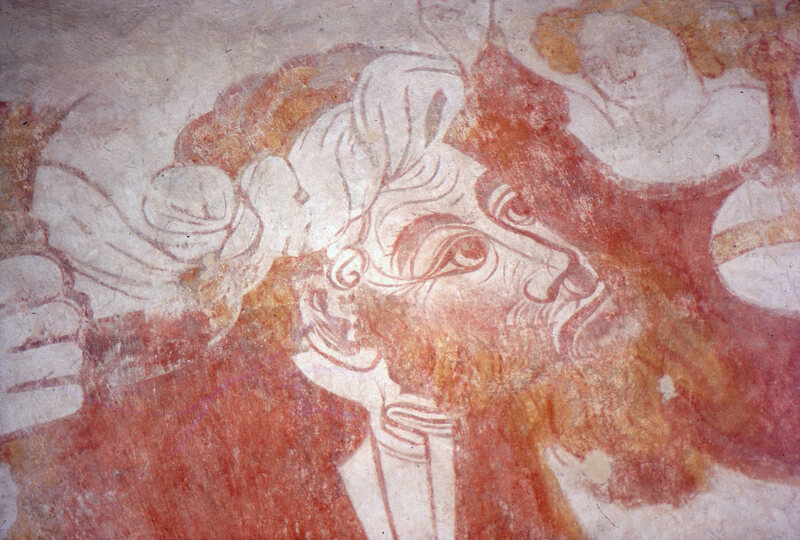 Talk. 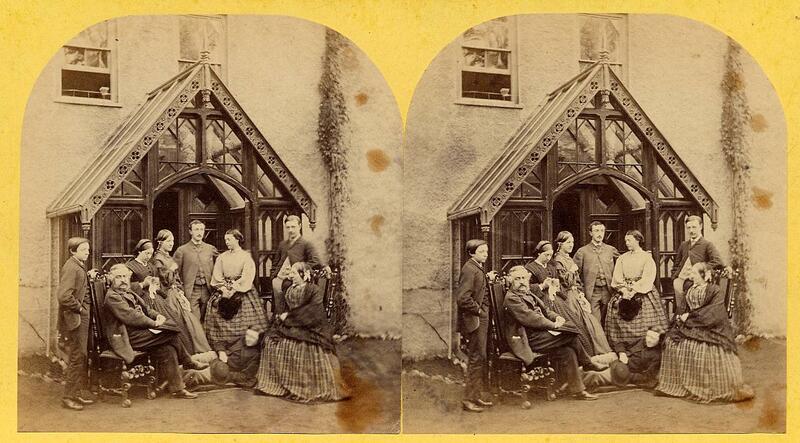 1860s photographer John Chaplin of Leapale Road, Guildford, made stereoscopics and glass plates of Martin Tupper and family at Albury House. 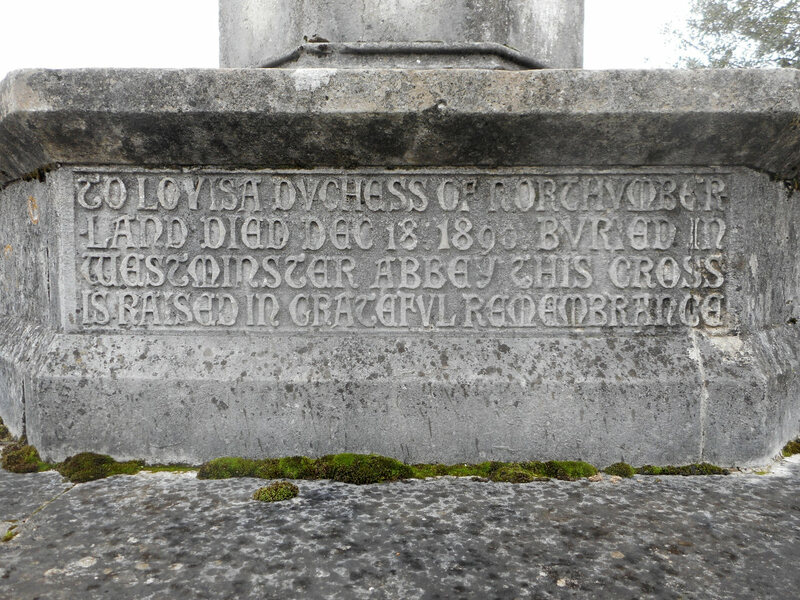 Evelyn Hellicar's memorial cross to Louisa Percy, Duchess of Northumberland and Henry Drummond's daughter, is opposite the church of St Peter and St Paul. 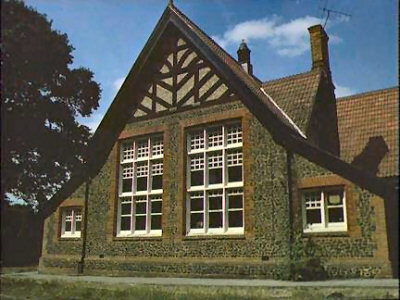 Albury Memorial Library was built after WW2, while church WW1 and WW2 war memorials, lists of names and biographies are at They Gave Their Today. 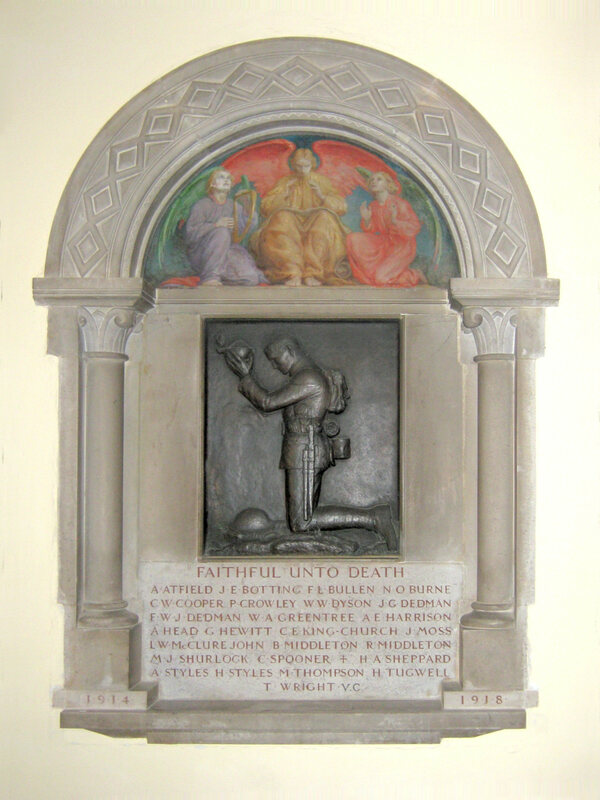 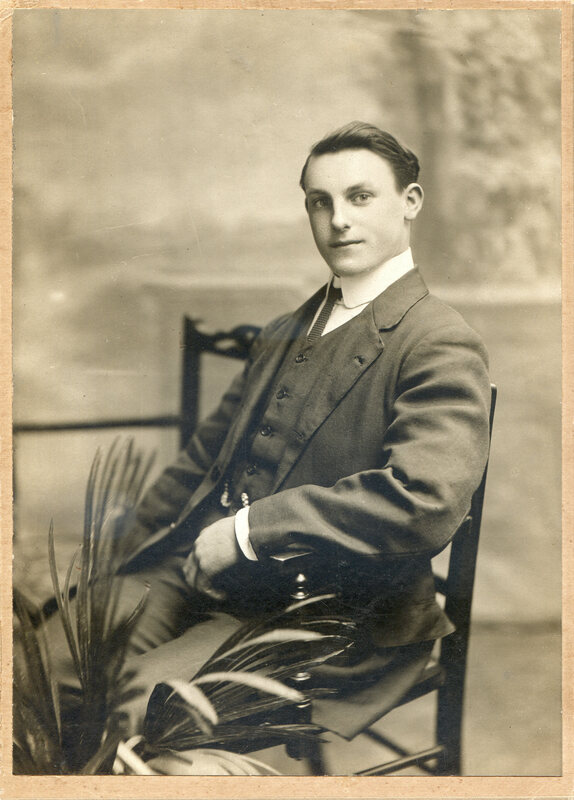 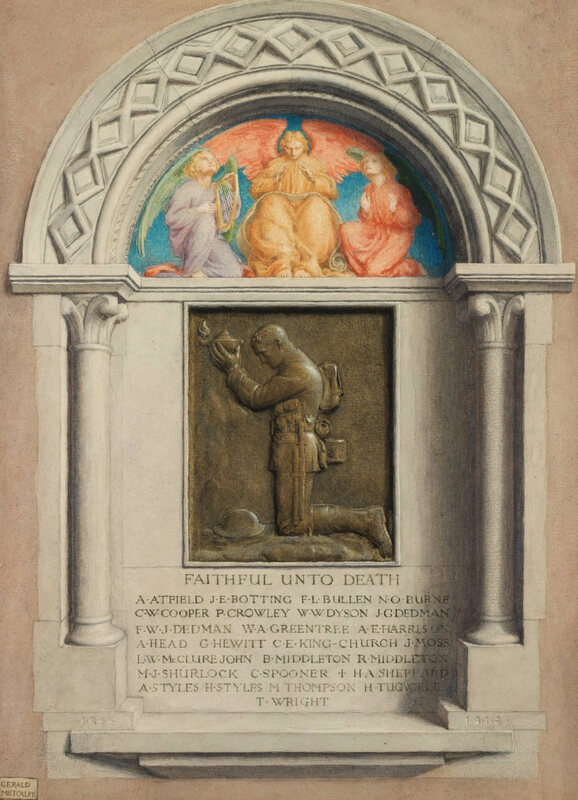 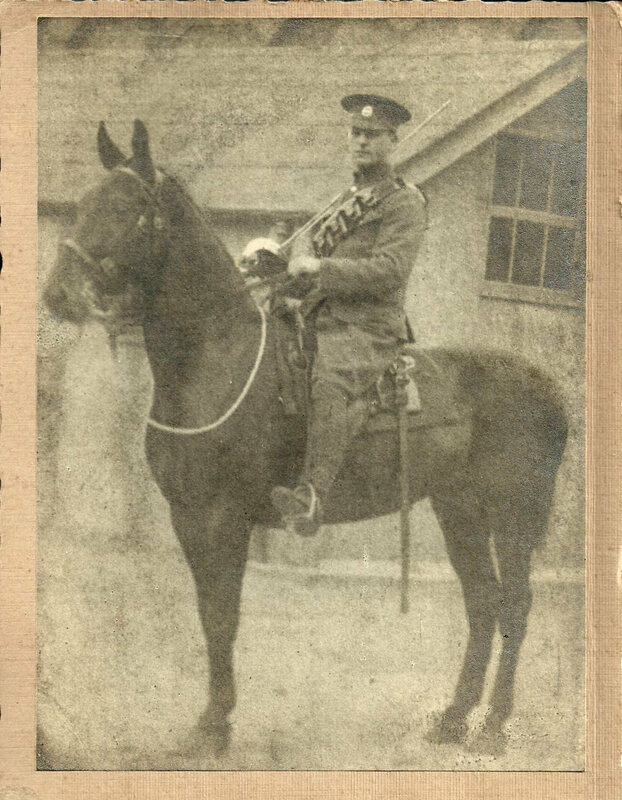 Somme survivor Gilbert Bellinger of Little London and Brook was model for Gerald Metcalfe of Woodside for his watercolour and Albury's First World War memorial. 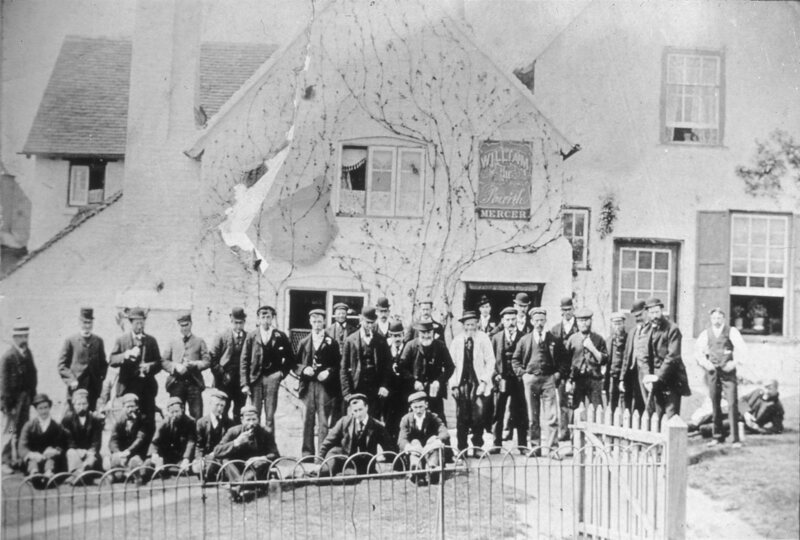 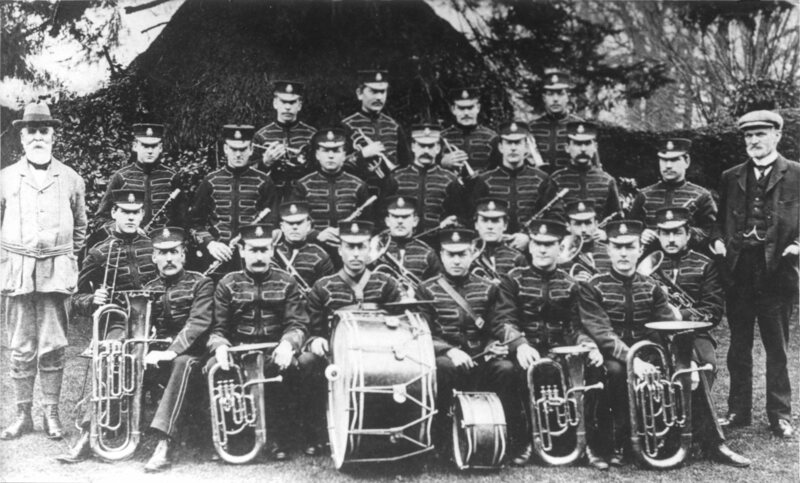 The thriving Albury Brass Band or Silver Band, here in 1907, had over 25 members and was active until the First World War. 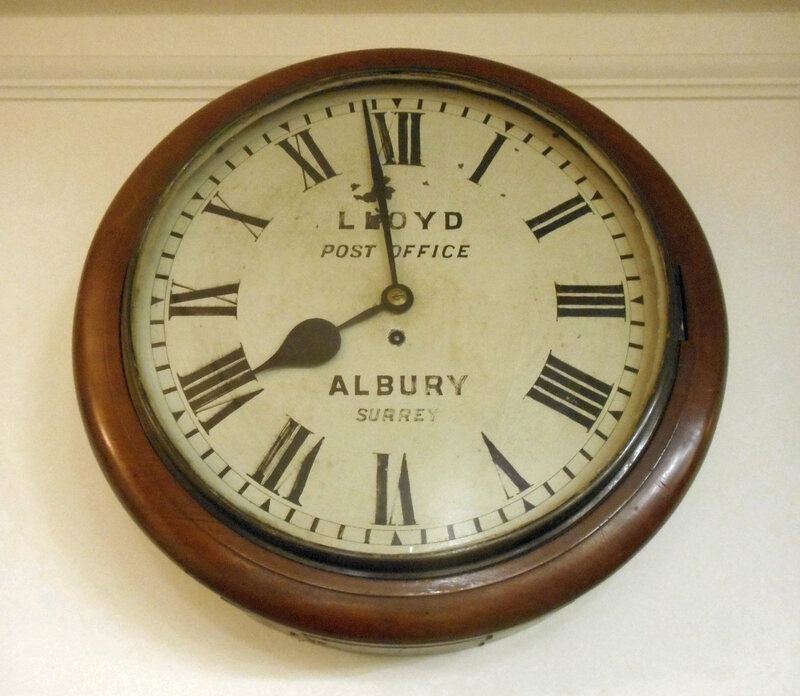 Lloyd's clock from the Albury Old Post Office now displays alongside panels of war dead inside the Village Hall, in The Street. 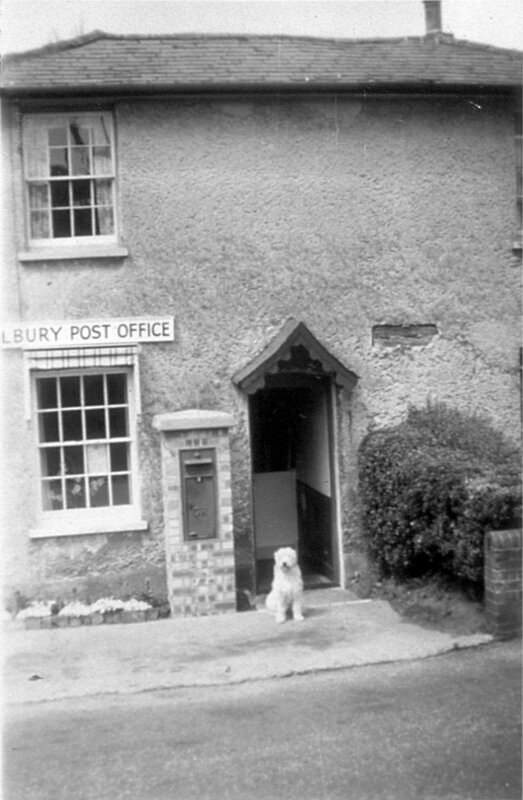 Royal Mail's van was garaged in the Forge and Albury Post Office progressively moved along the Street to Pratt's Stores. 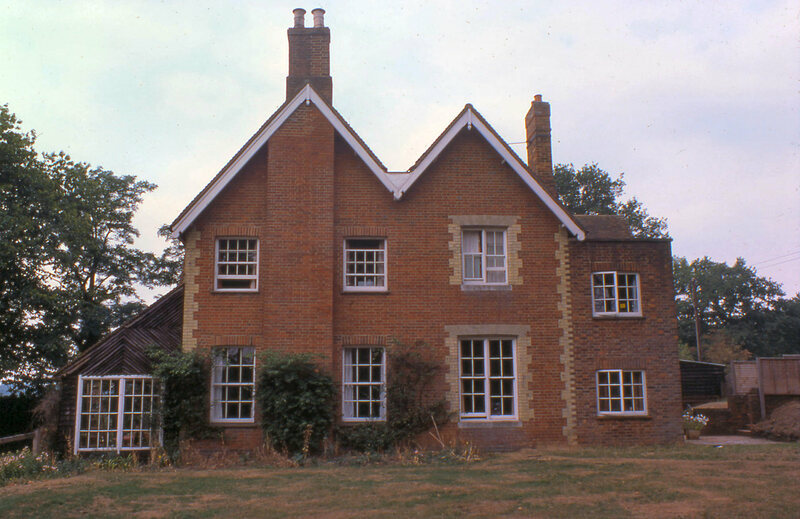 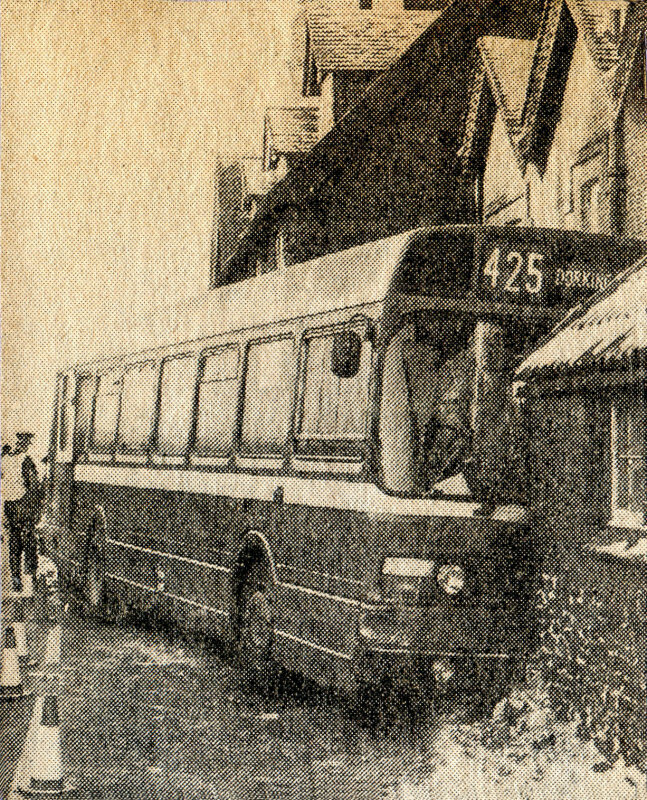 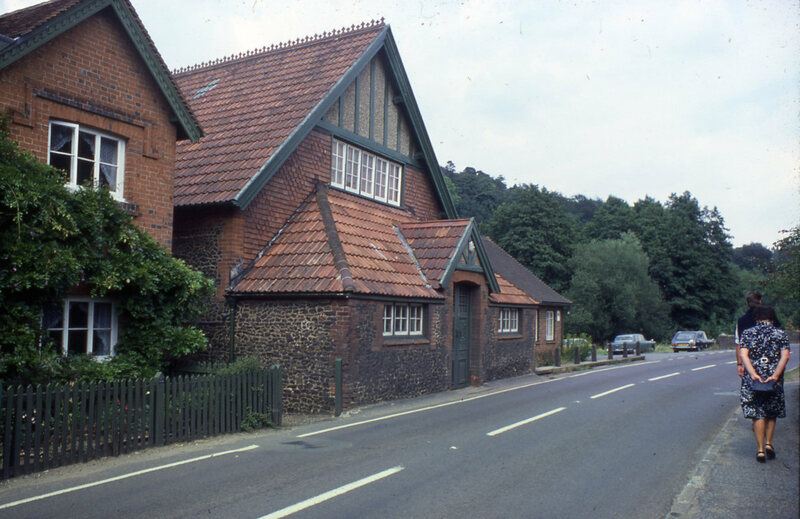 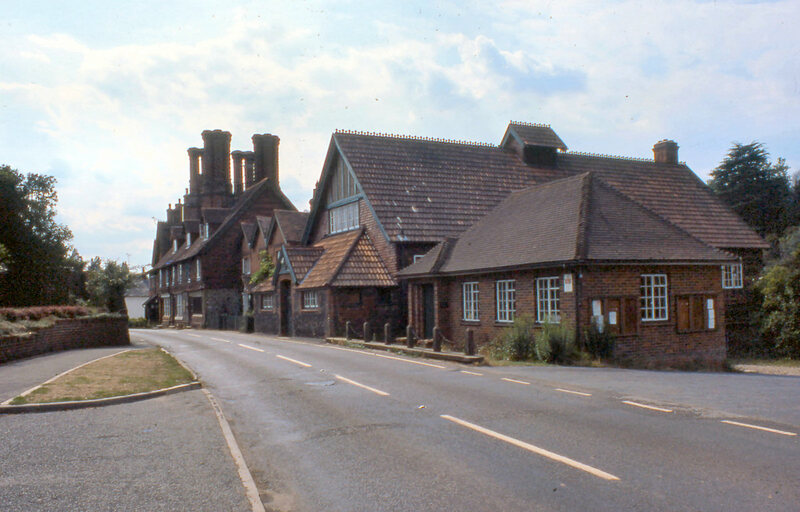 Originally Albury National School, from 1833 to 1894, some improvement works took place after a Dorking-bound bus crashed into the Village Hall in January 1982. 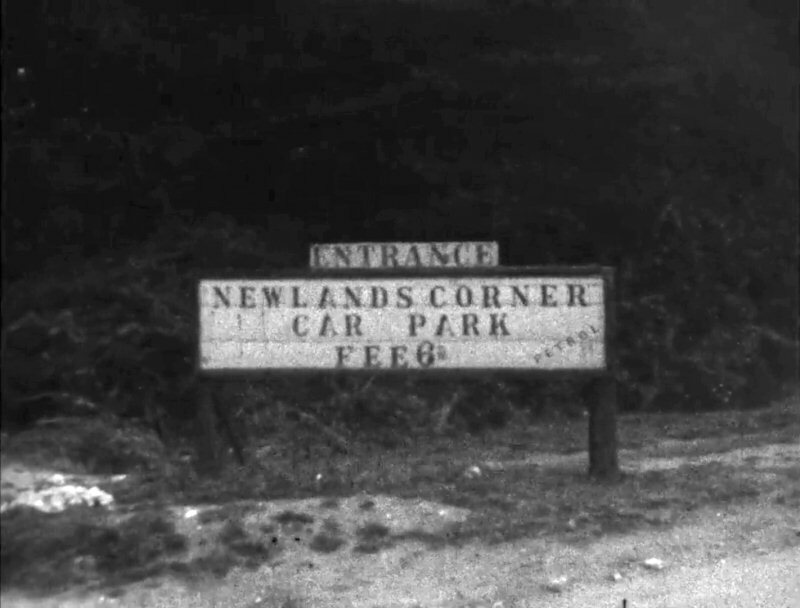 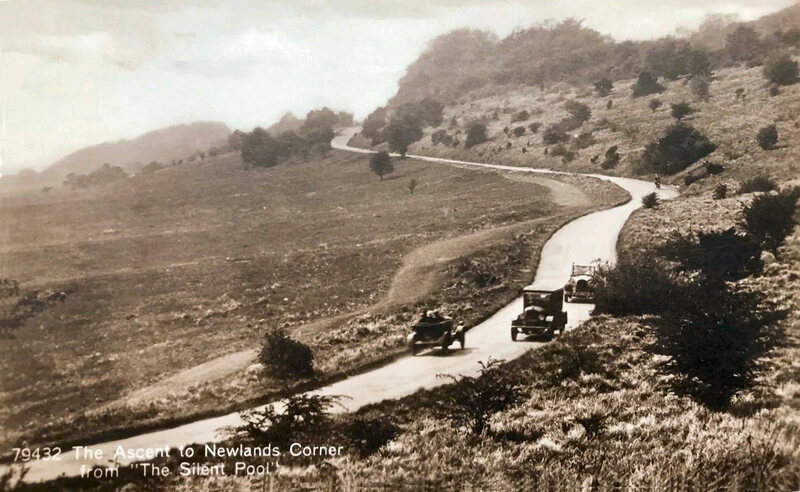 In 1935 Newlands Corner, named Fairyland around its ancient yews, had an RAC box at the top of The Sweeps, tea gardens, 6d car park fee and petrol. 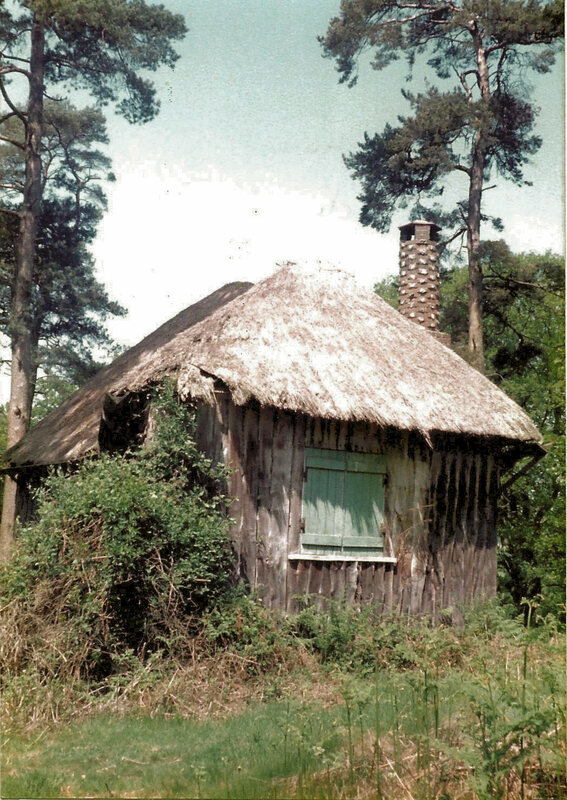 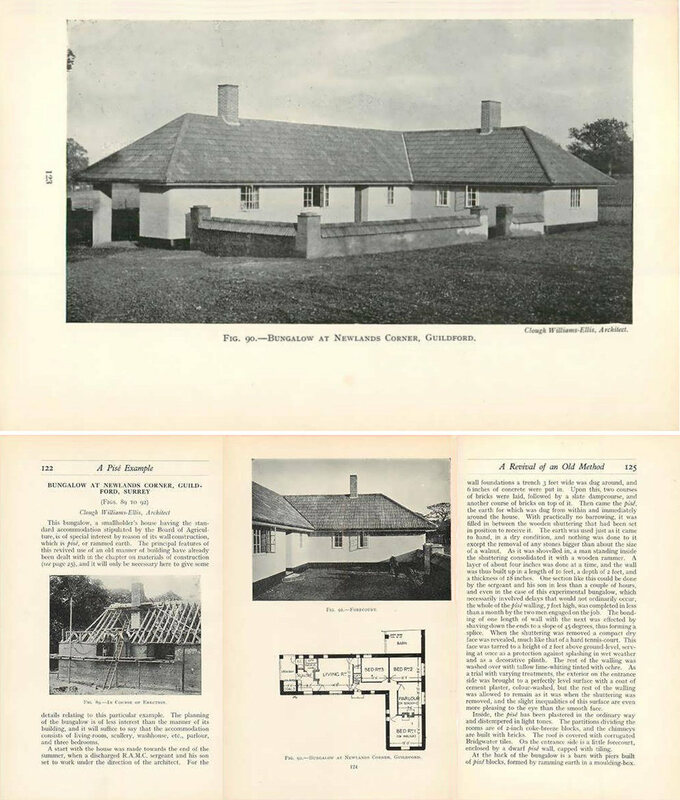 Clough Williams-Ellis designed a pisé bungalow at Newlands Corner, built with rammed earth for £101 in 1919, and Albury Park's Half Moon Pond. 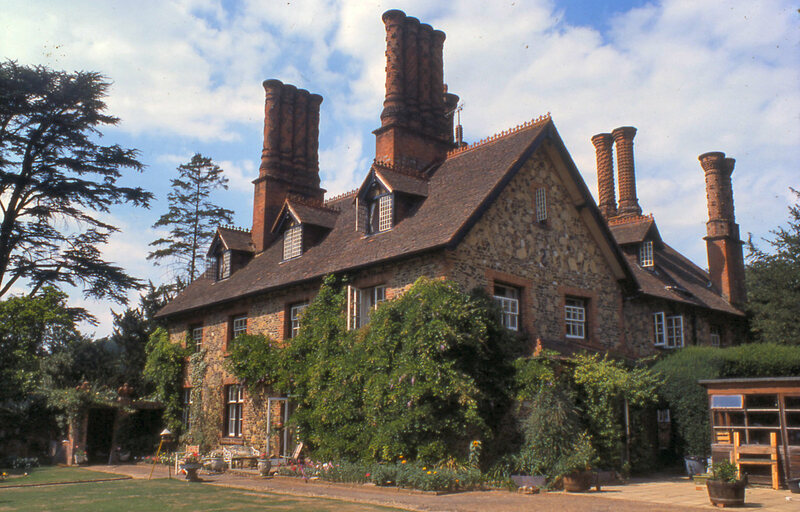 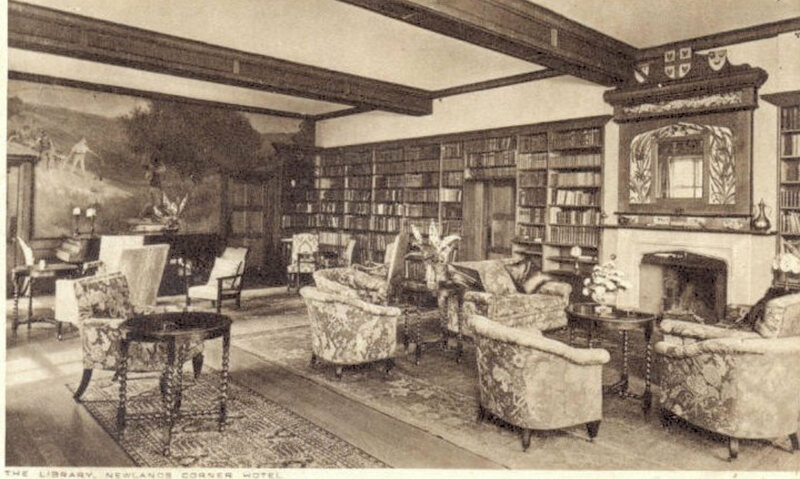 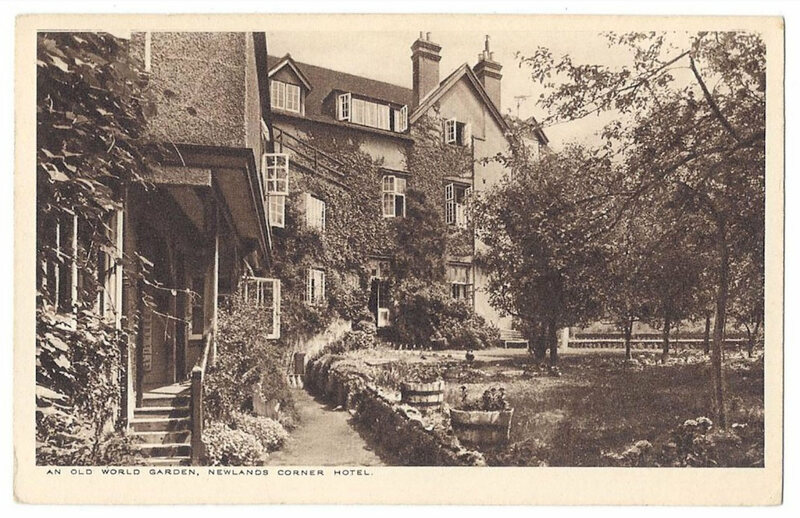 Newlands Corner Hotel, now Manor House Hotel, had an old world garden, library and striking colonnade. 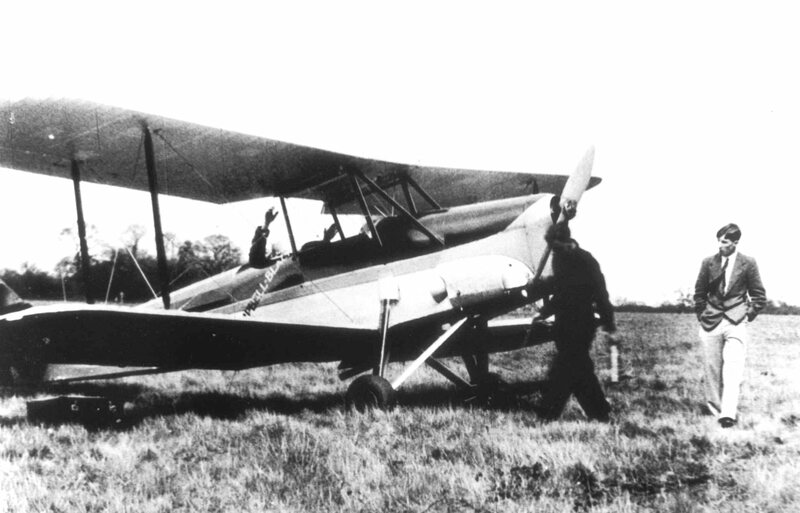 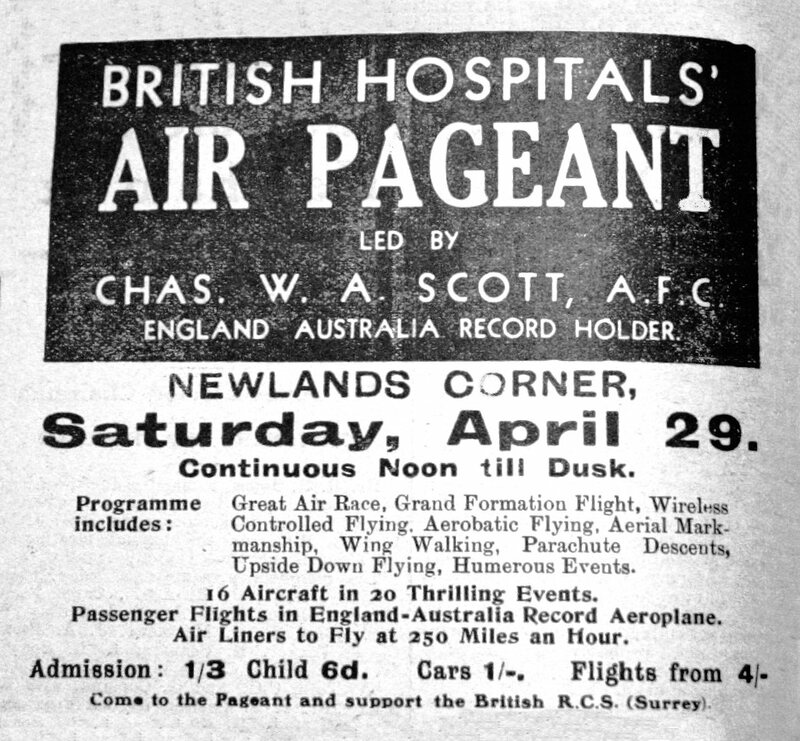 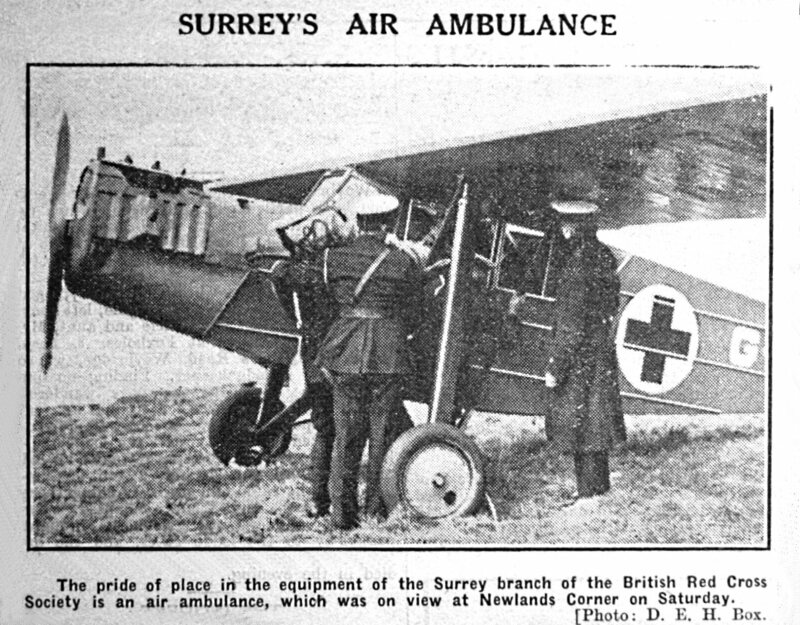 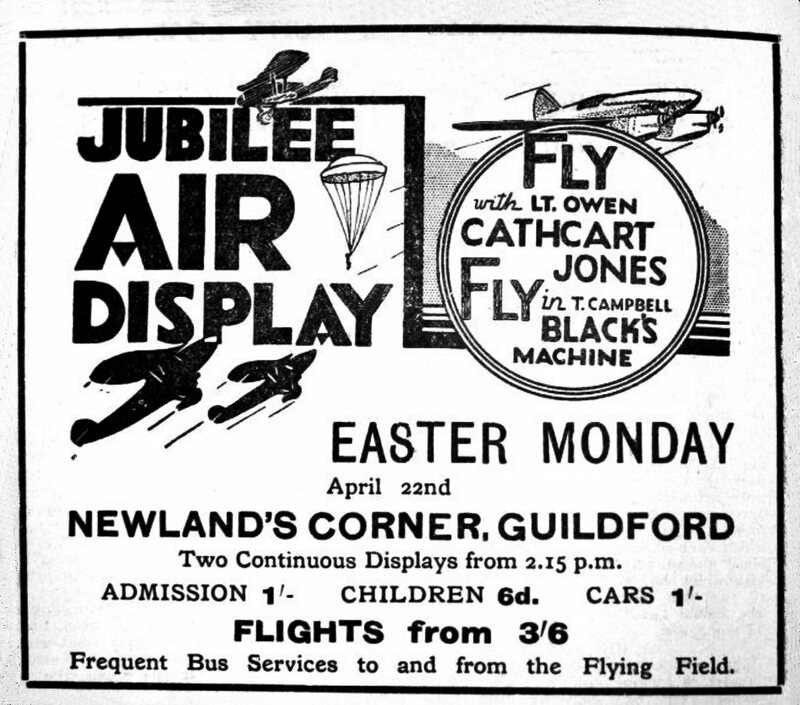 Air displays at Newlands Corner attracted 15,000 in 1933 and 1935 while on White Lane the RAF had Merrow Flying Field during WW2. 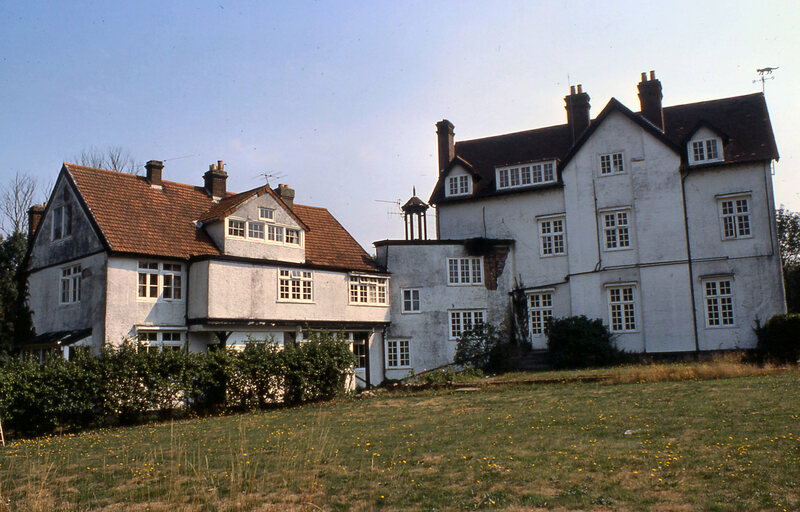 In the 1930s Clough Williams-Ellis did designs at nearby Stapledown, with its Hut studio theatre, where Charles Laughton and Elsa Lanchester lived. 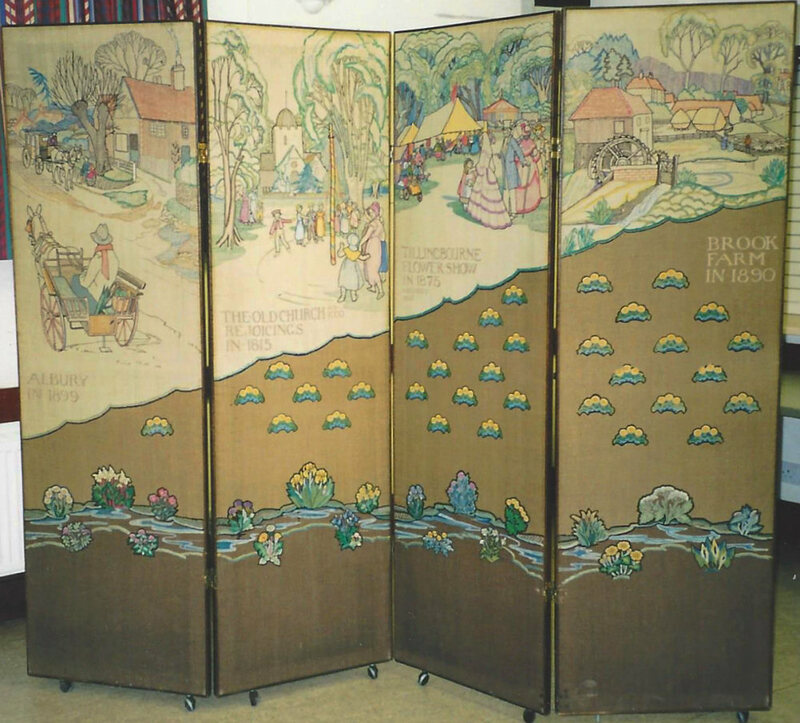 In 1935, 36 Albury WI members embroidered a screen depicting a cab, governess cart, Tillingbourne Flower Show and Brook Farm in 1890 with an undershot waterwheel. 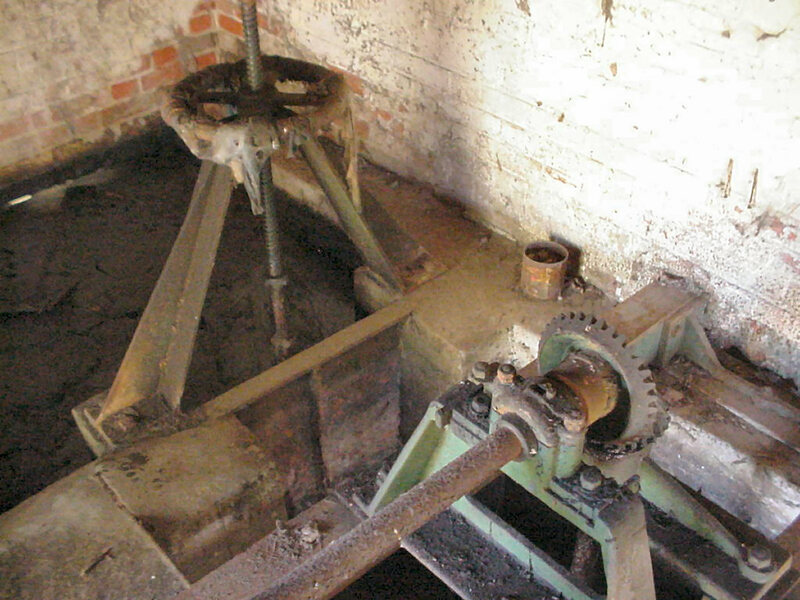 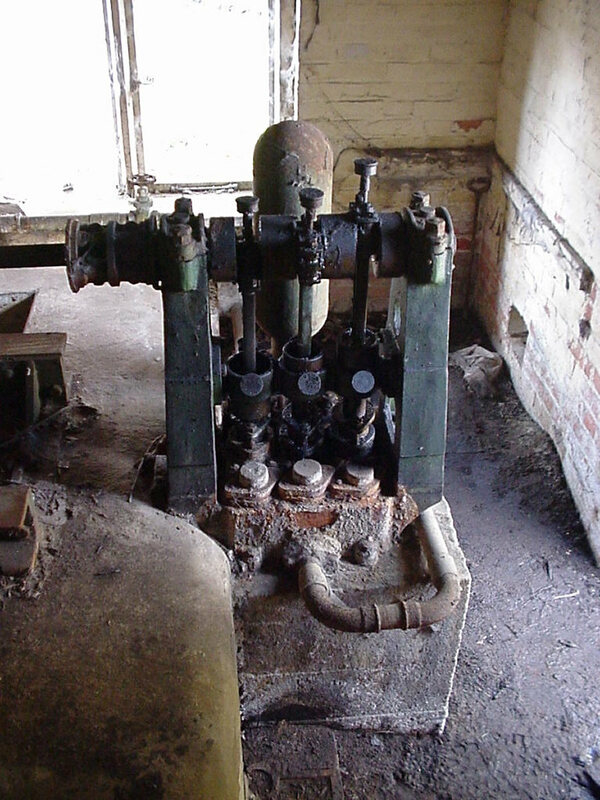 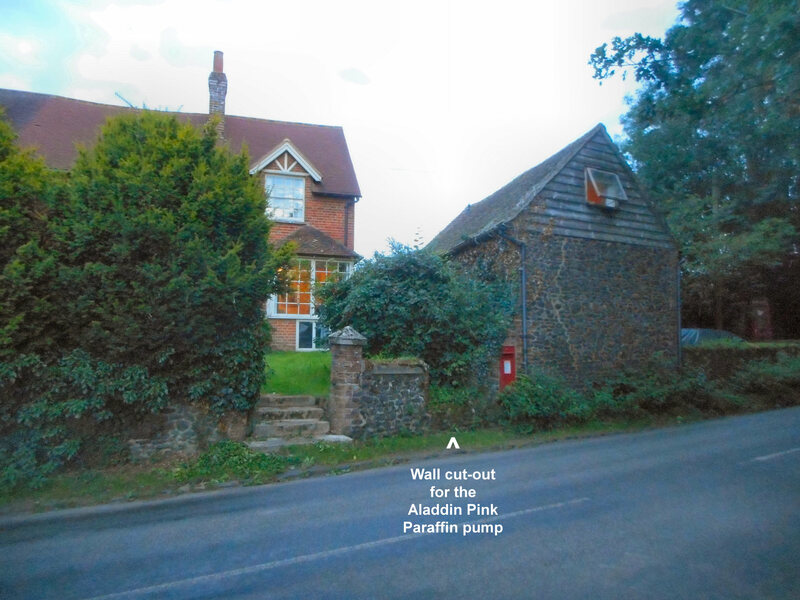 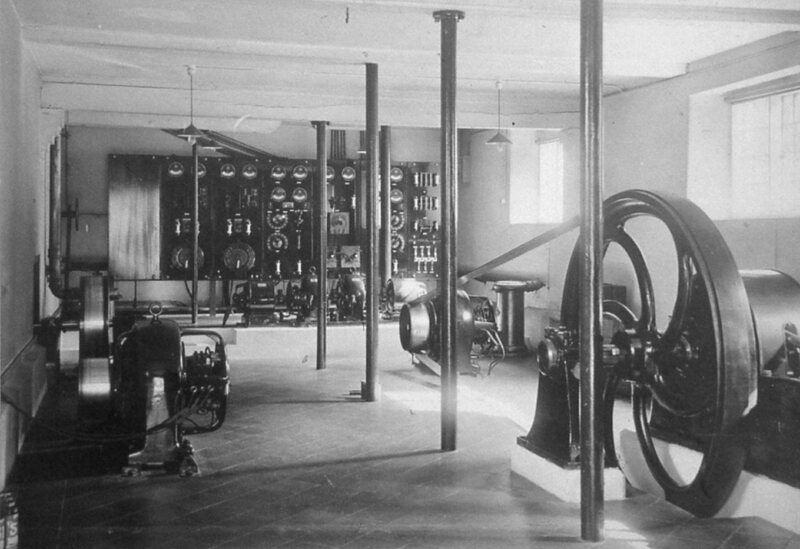 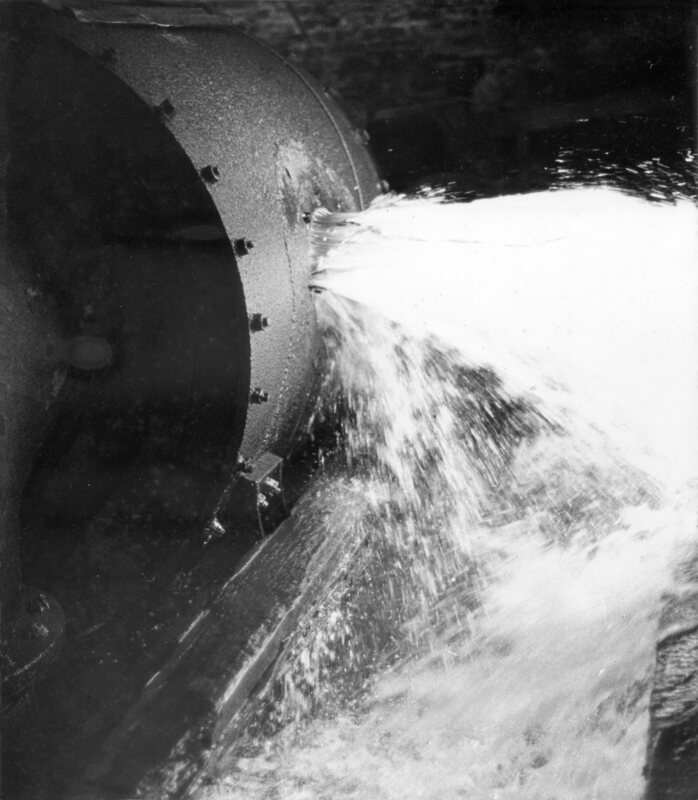 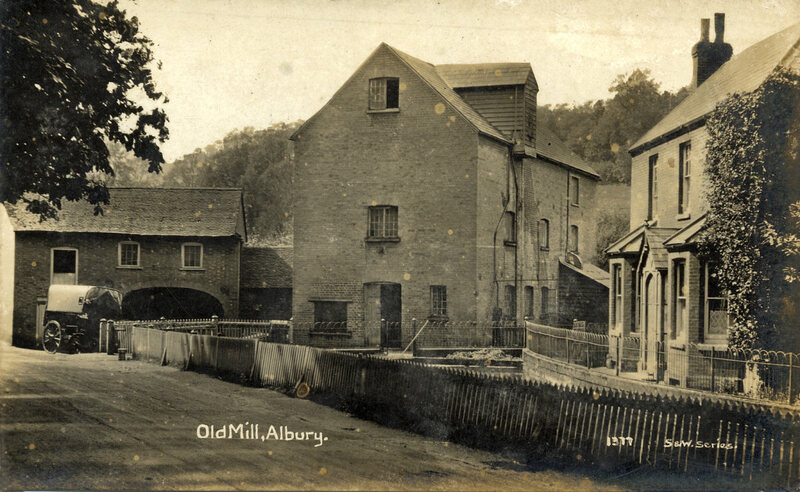 The estate generated electricity at Albury Old Mill, using the miller's old turbine and the flow of the Tillingbourne, described by Alf Howick: audio 040. 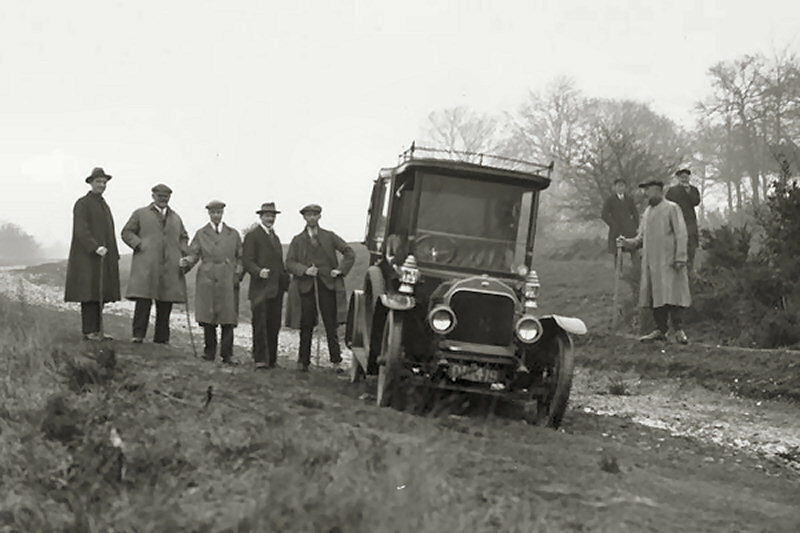 The Mill was dredged in 1926 as police and volunteers sought Agatha Christie after her car was abandoned by Water Lane chalk pit. 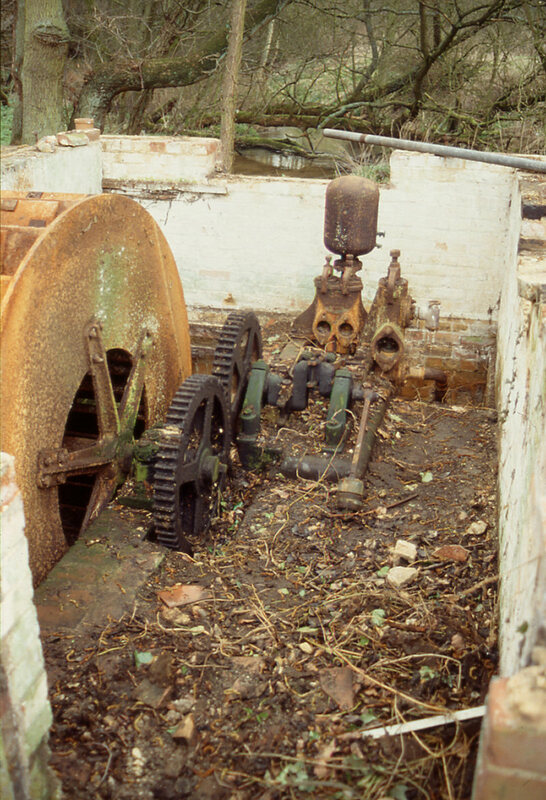 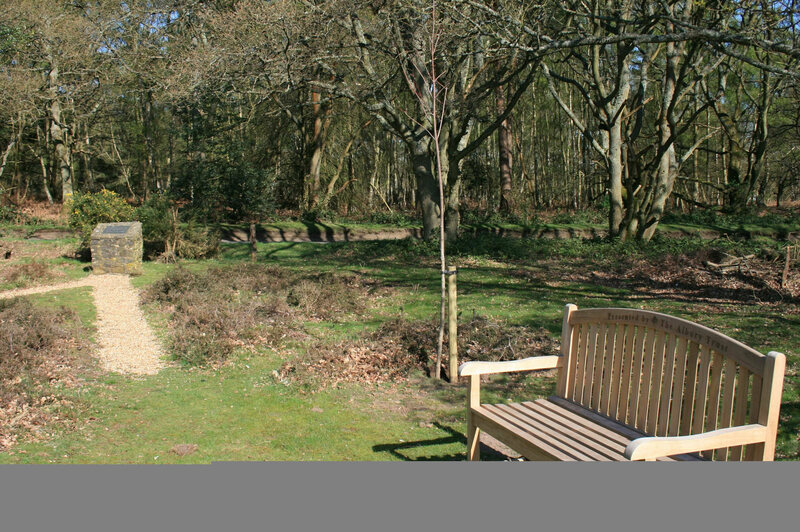 SIHG won 2007's Margery Award researching Vale End pumping station's unusual Poncelet waterwheel which filled a reservoir up Albury Warren. 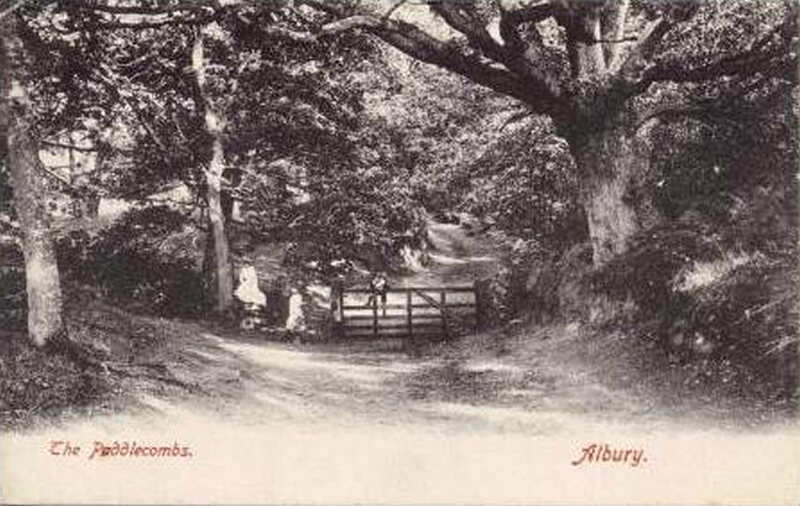 Albury boasts a unique word: The Paddlecombs is the area rising from the village and once the path to school, at the summit of the Warren. 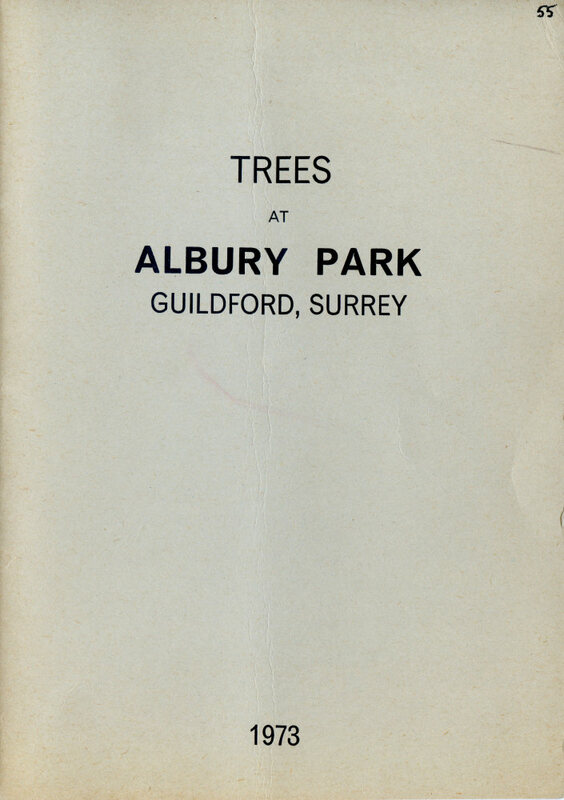 Booklets list Trees at Albury Park, with an 1880 water turbine, mills and waterways in Home Farm Buildings and The Tillingbourne River Story. 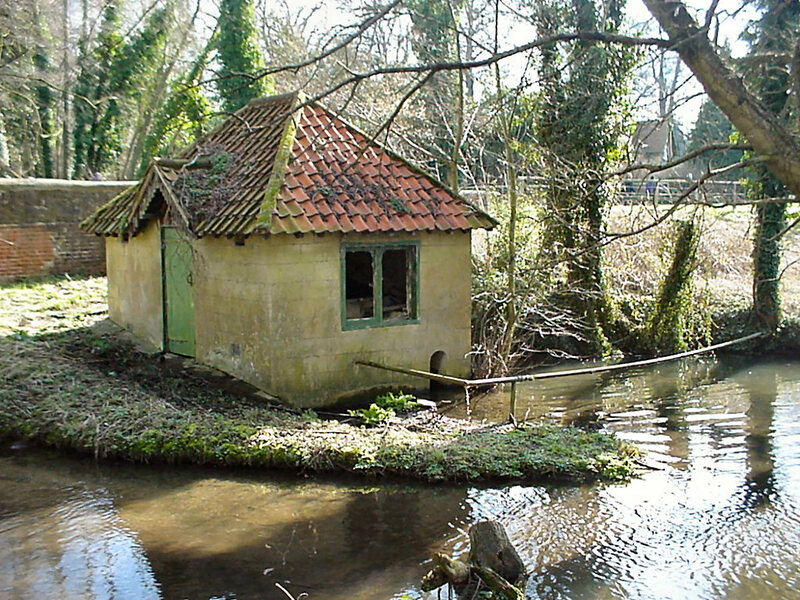 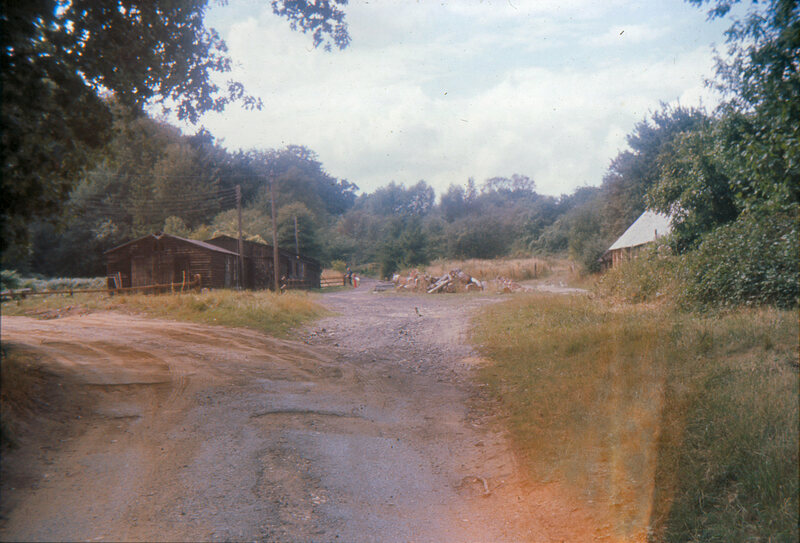 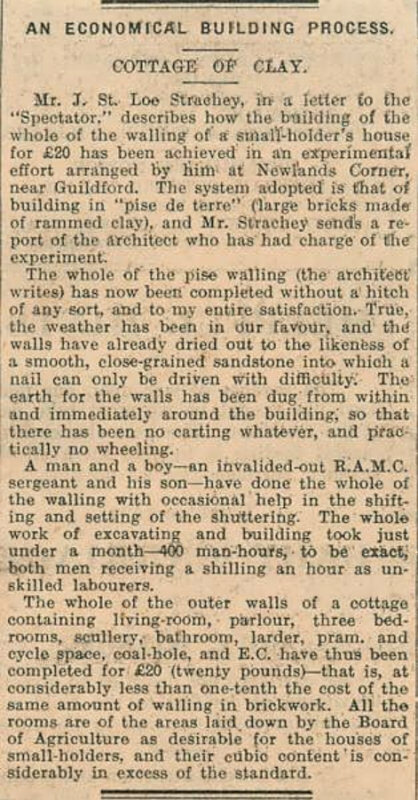 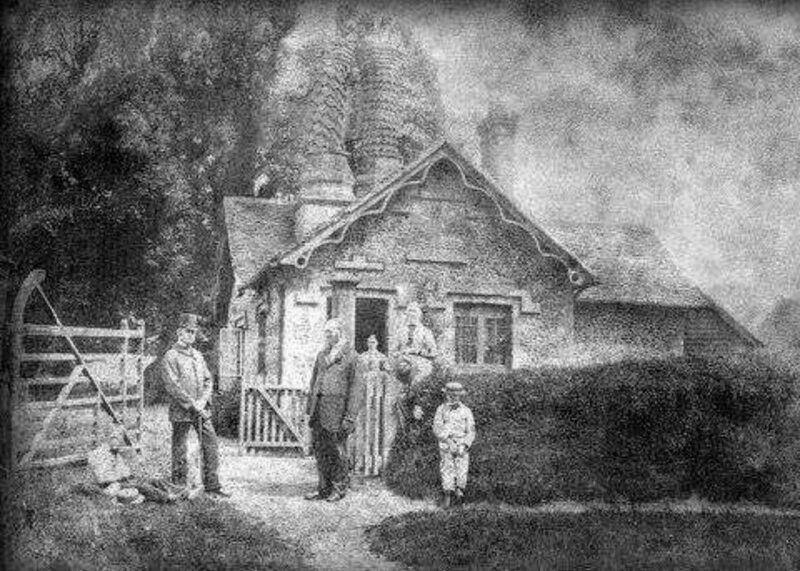 A brickworks and cottage for the worker attending the firing kiln existed beside Weston Wood and the A25. 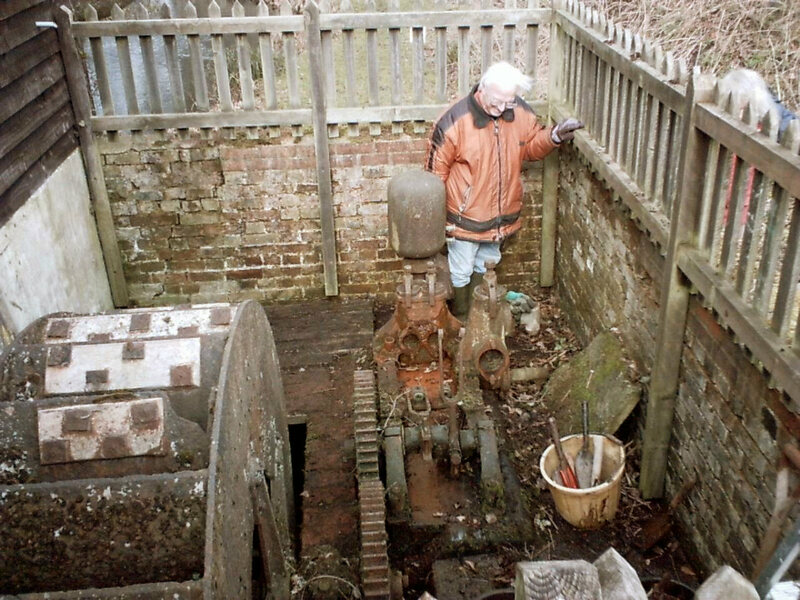 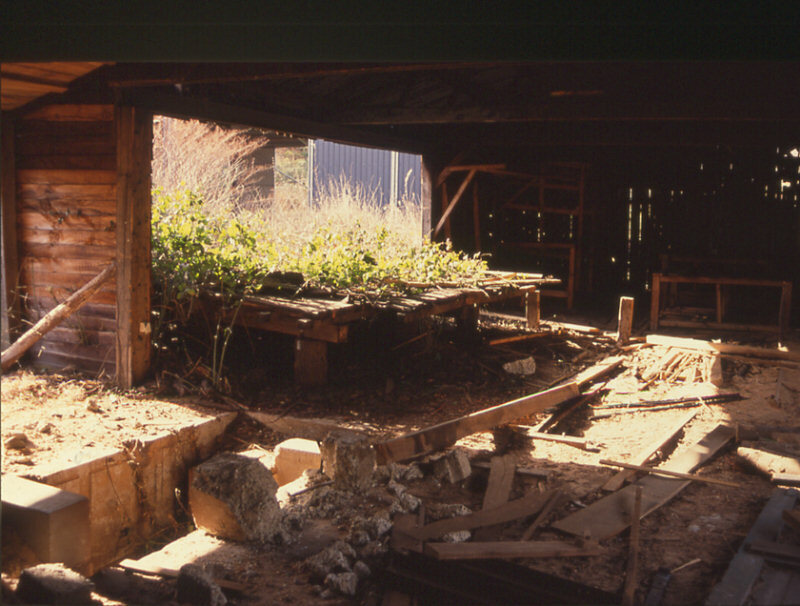 Until 1988 there was a sawmill by Albury Brick Field, shown with steam power for the machines and later, abandoned. 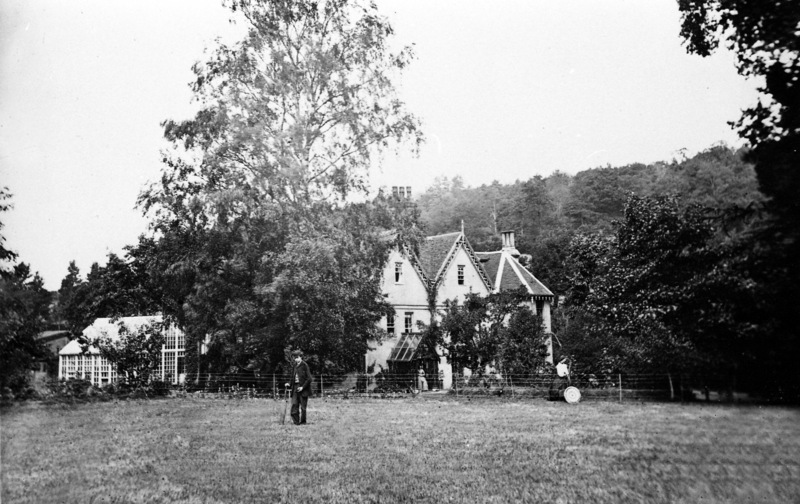 Albury Police House, now Wood Lodge, was on Sherbourne. 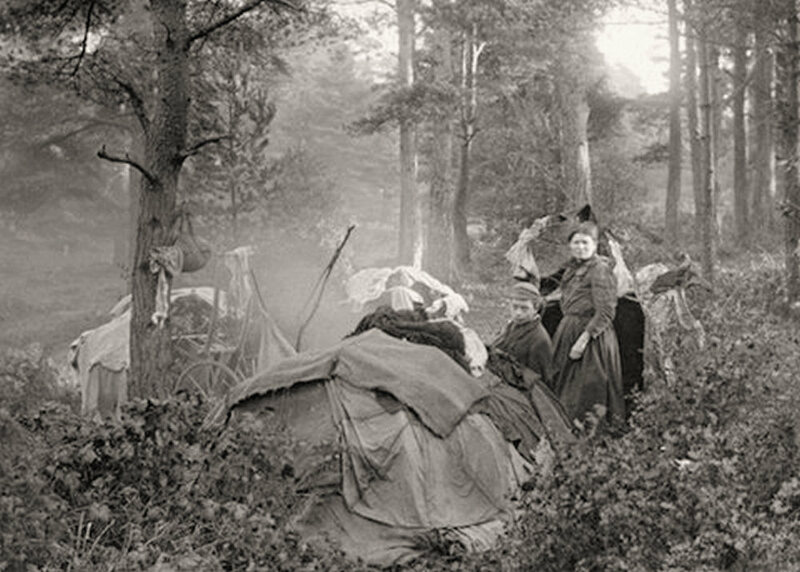 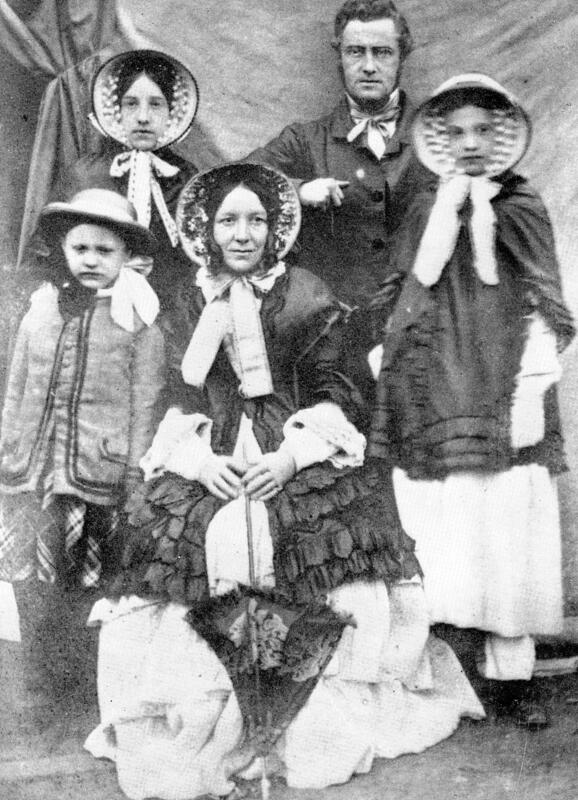 Inspector Robert Parker and family were photographed there in 1867. 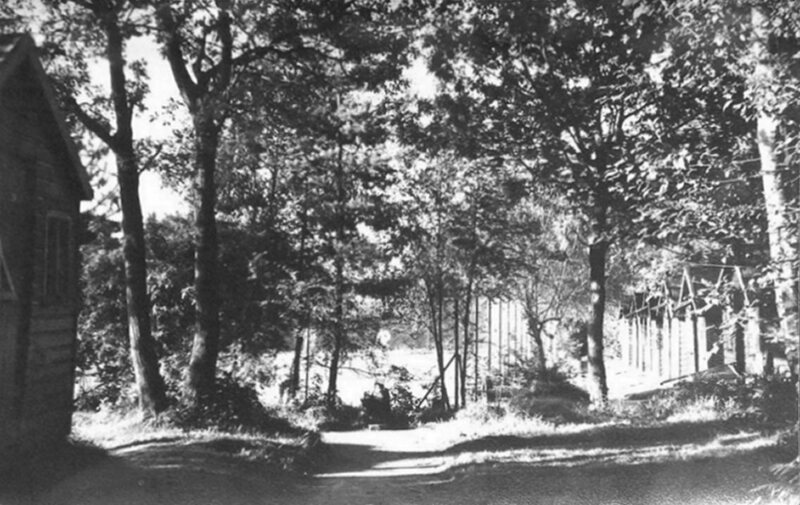 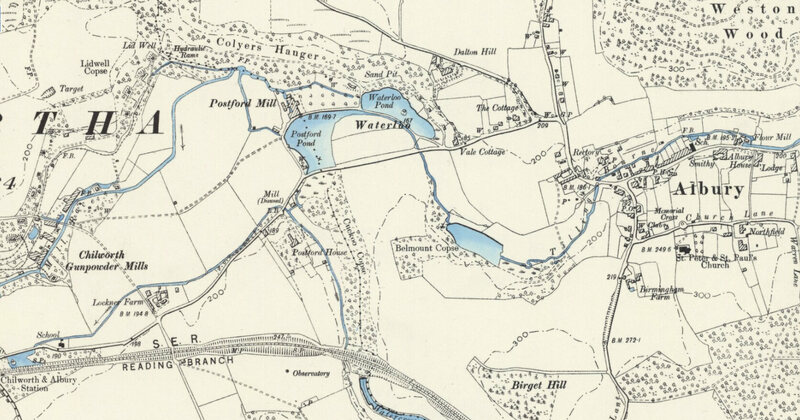 A Boat House and the greater part of Postford Pond were lost when new Chilworth Road bypassed Mill Lane in the 1880s. 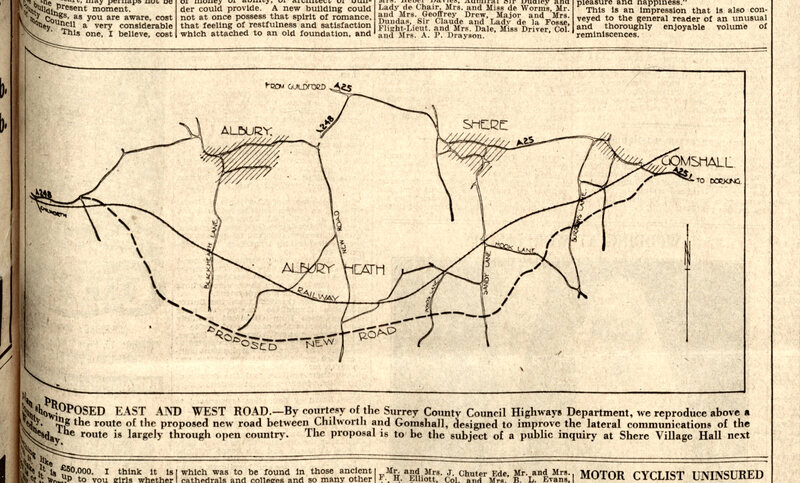 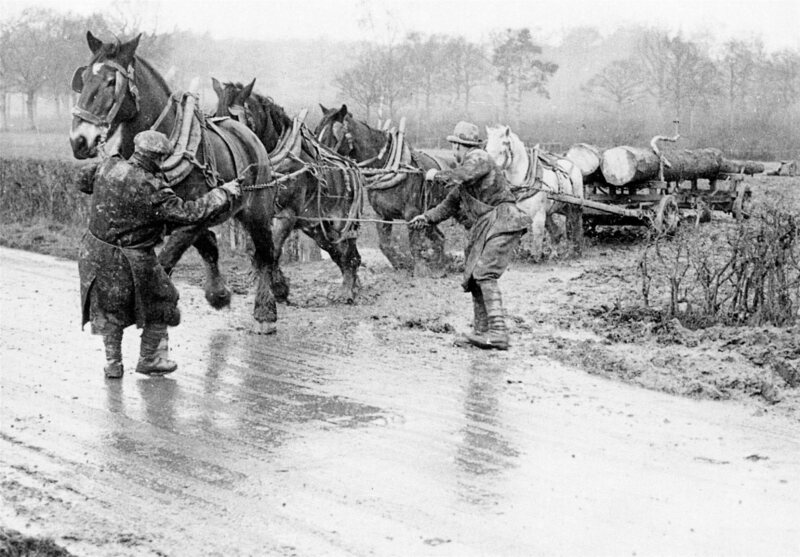 War stopped a 1939 Chilworth to Gomshall and Shere bypass road passing through 'open country' of Blackheath, Farley Heath, Brook, Shere Heath and Burrows Lea. 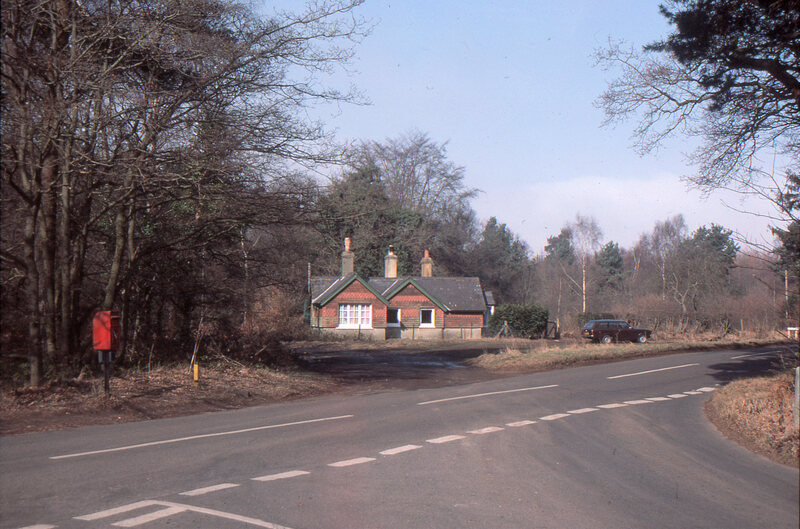 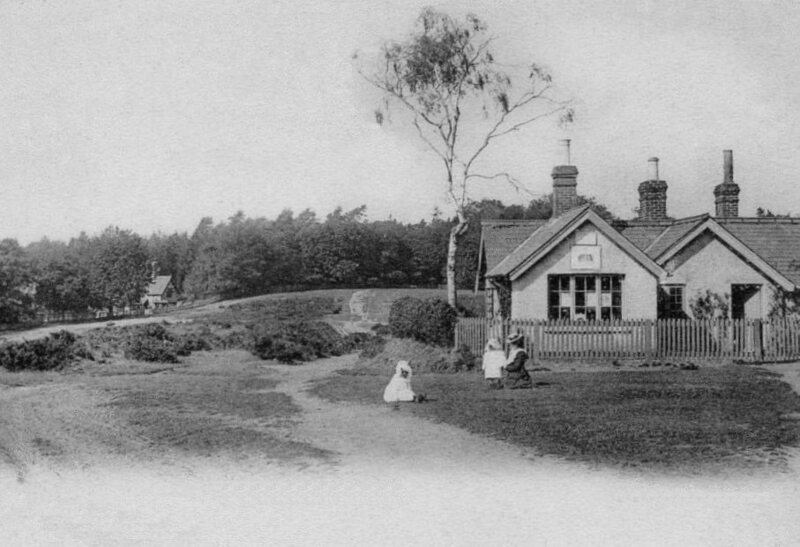 Albury Heath had its own post office at Park Corner, the junction of Sandy Lane, Park Lane and New Road. 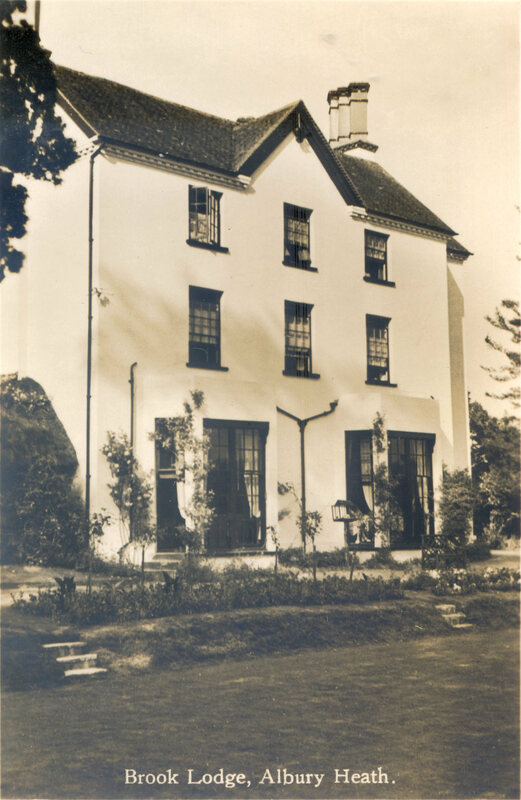 Near Little London School, Albury Workhouse (now Heath Lodge) in Park Road, with attached brewhouse, was built in 1732 for 12 paupers and closed in 1836 with an auction. 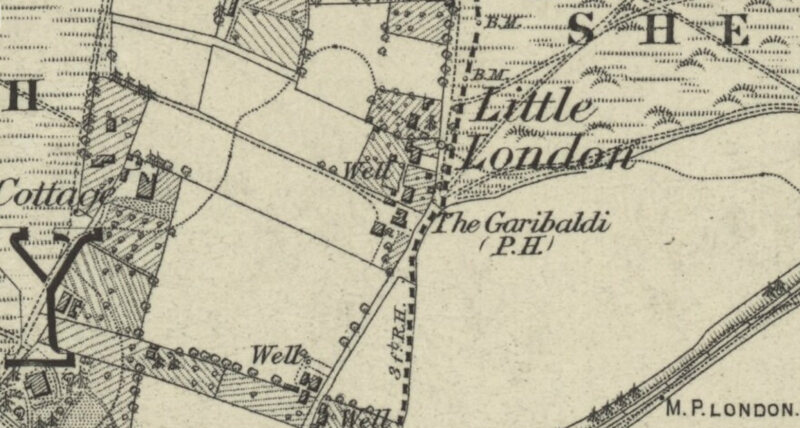 Little London's William IVth was The Garibaldi till c1875, after the Italian patriot given Freedom of the City of London in 1864. 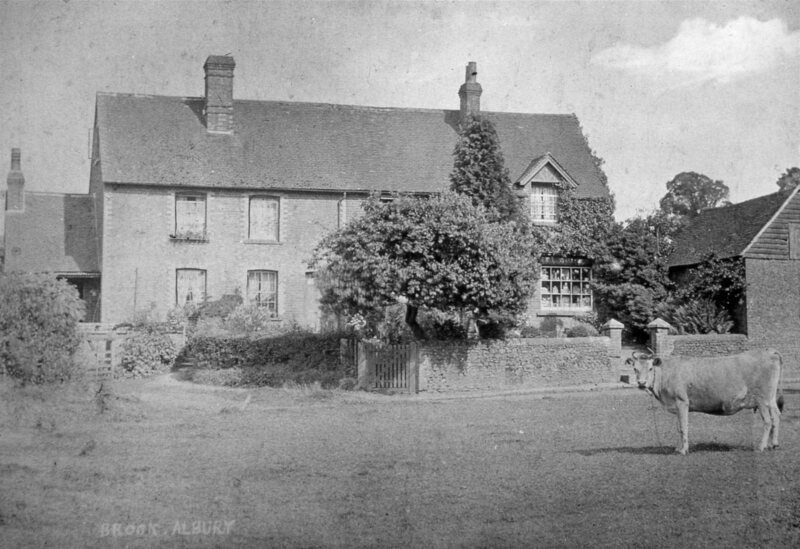 The 1867 inquest into death by lightning strike of a farm worker and two horses at Dilton Farm, Farley Green, was held at the Garibaldi Inn. 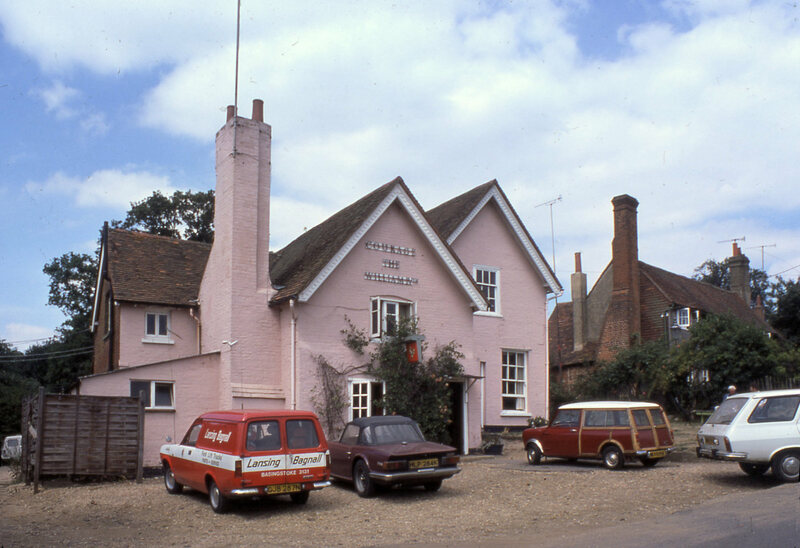 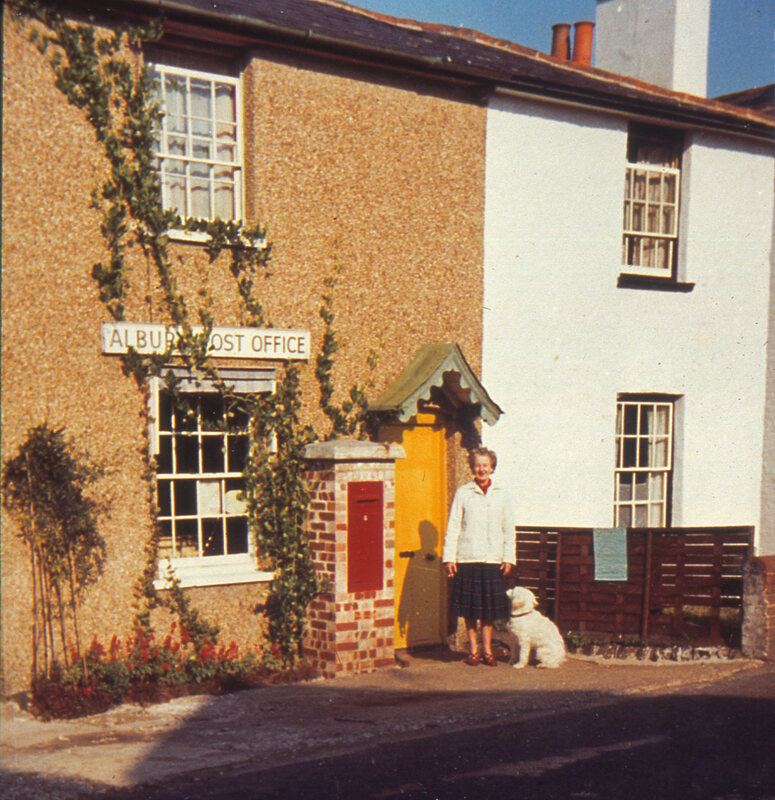 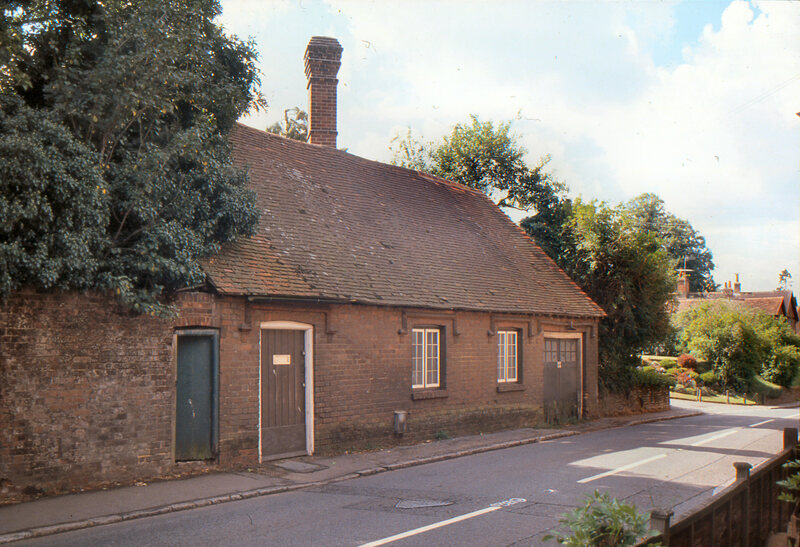 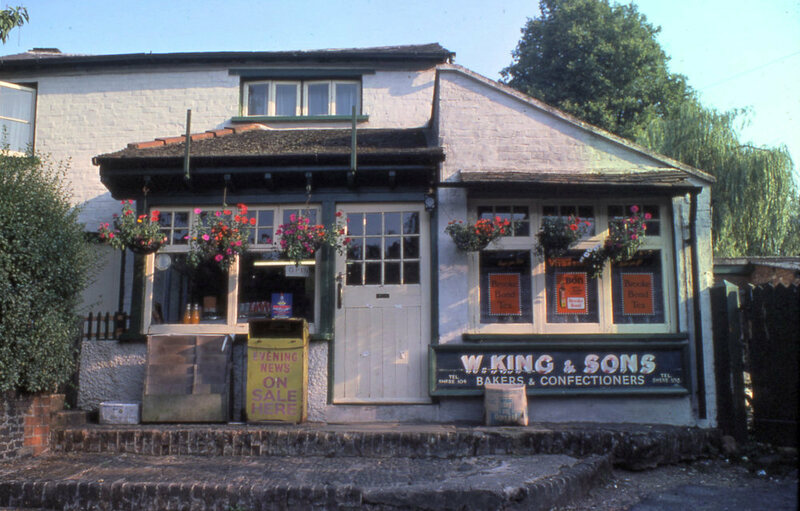 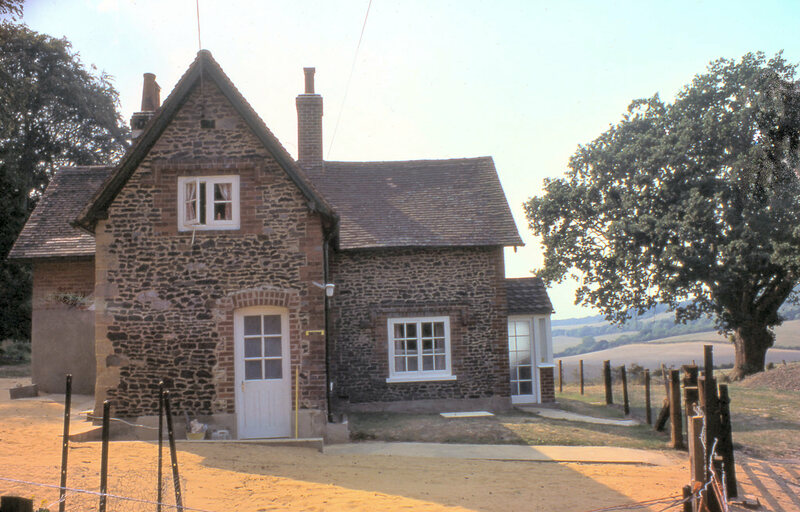 Holt's Store and post office on Brook Hill, between Farley Green and Albury, delivered milk, had an Aladdin Pink Paraffin pump and operated until the late 1970s. 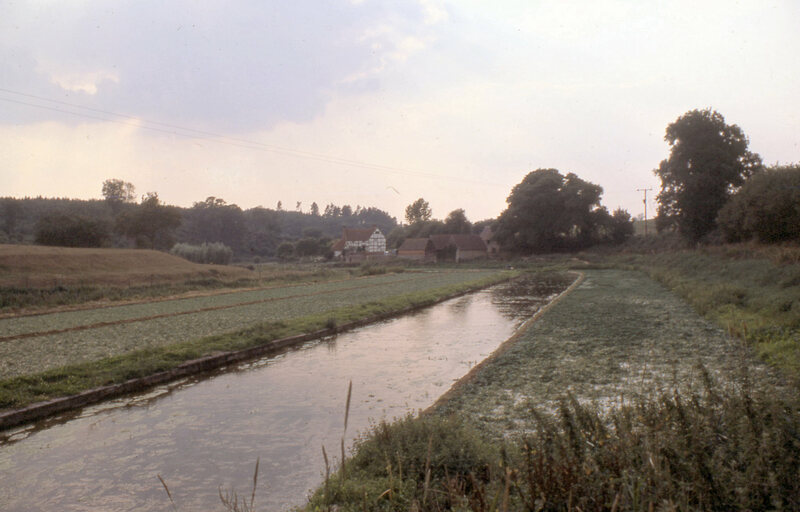 From 1854, watercress beds, including Postford and these at Ford Farm, grew 400 tons a year along Law Brook and the Tillingbourne; more. 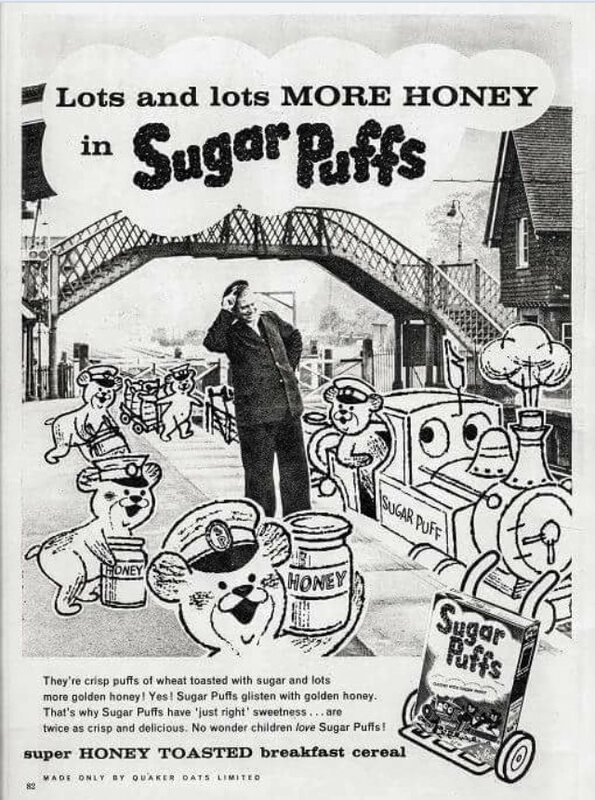 Chilworth and Albury Station with porter signalman Henry Dowling featured in this 1950s Sugar Puffs advertisement. 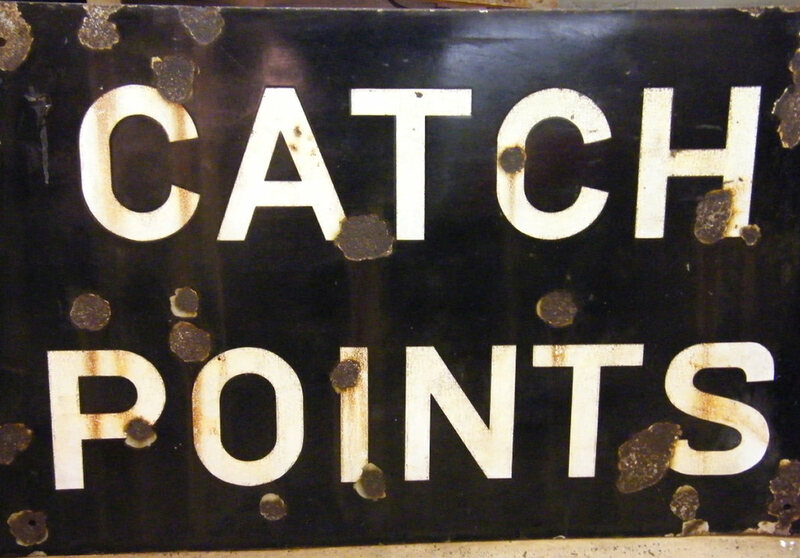 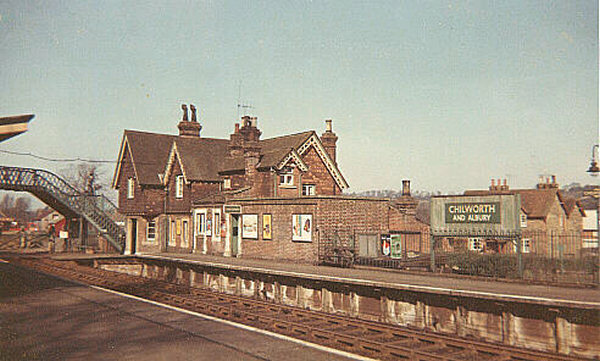 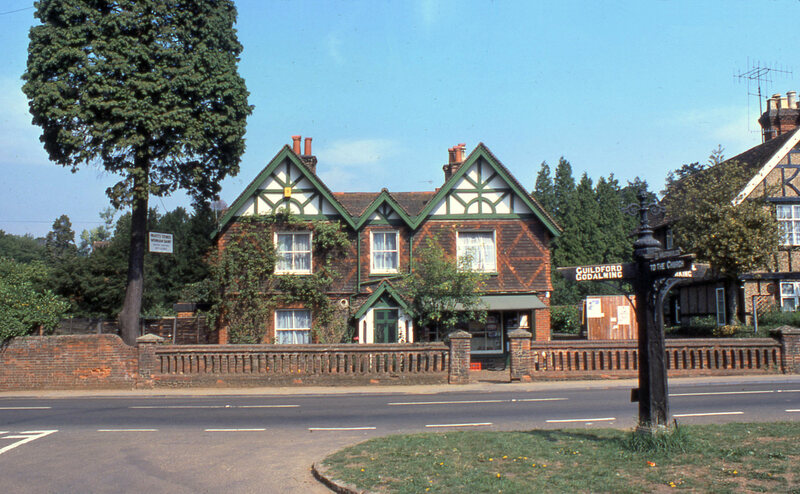 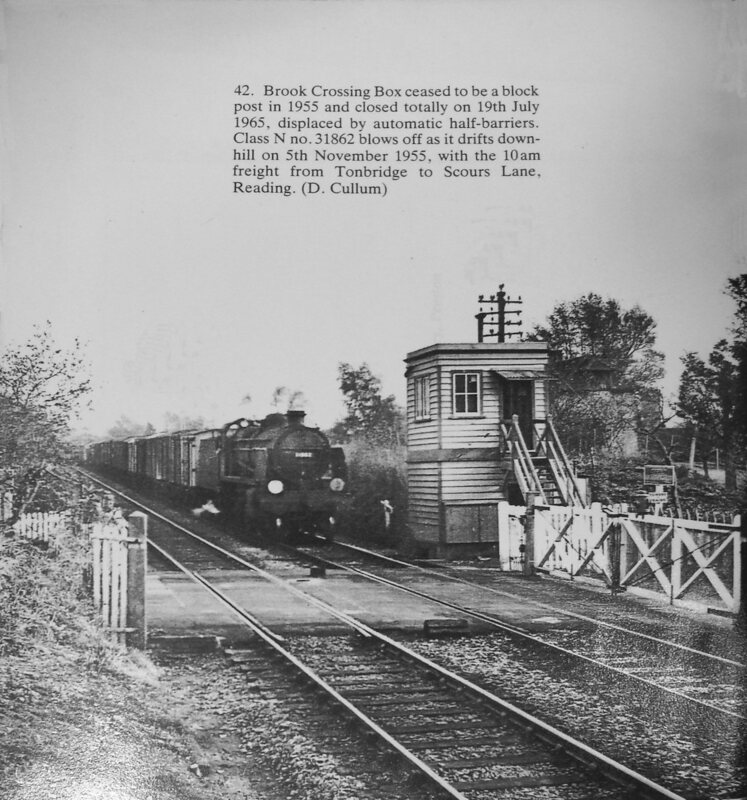 Brook Crossing had catch points and a wooden Box while South Eastern Railway operated Chilworth and Albury Station. 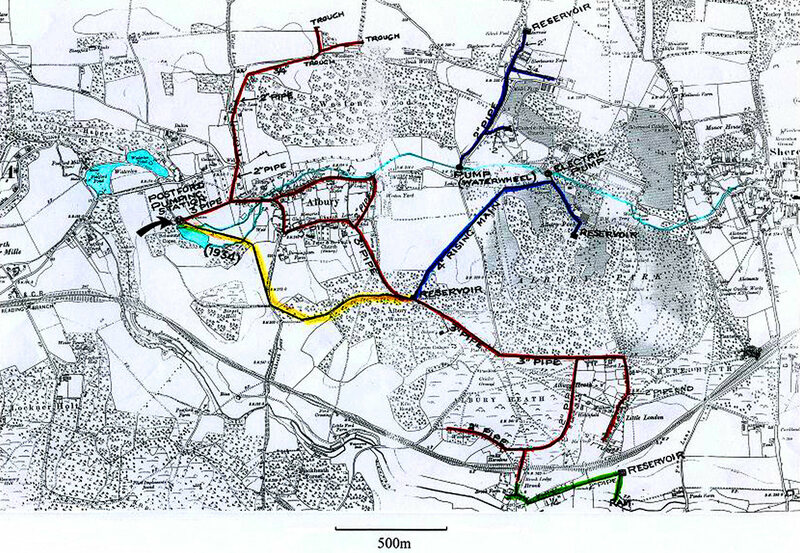 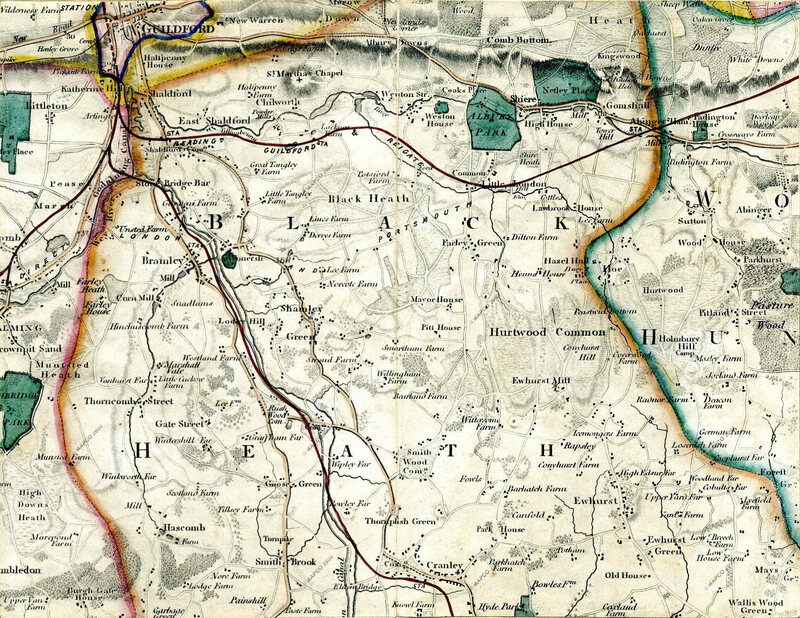 A Portsmouth extension to the Guildford and Reigate Railway was mooted in the mid 1800s, running from Little London, across Brook Hill and through Blackheath. 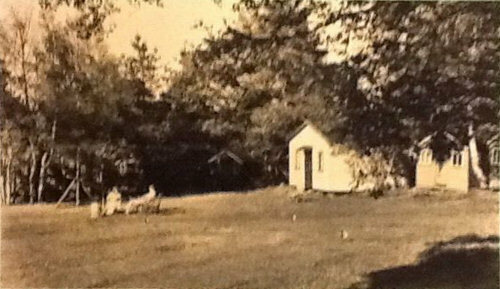 Jesse's Seat, a topiary pheasant at Lockner, marks the 1892 death of guard Henry Wicks. 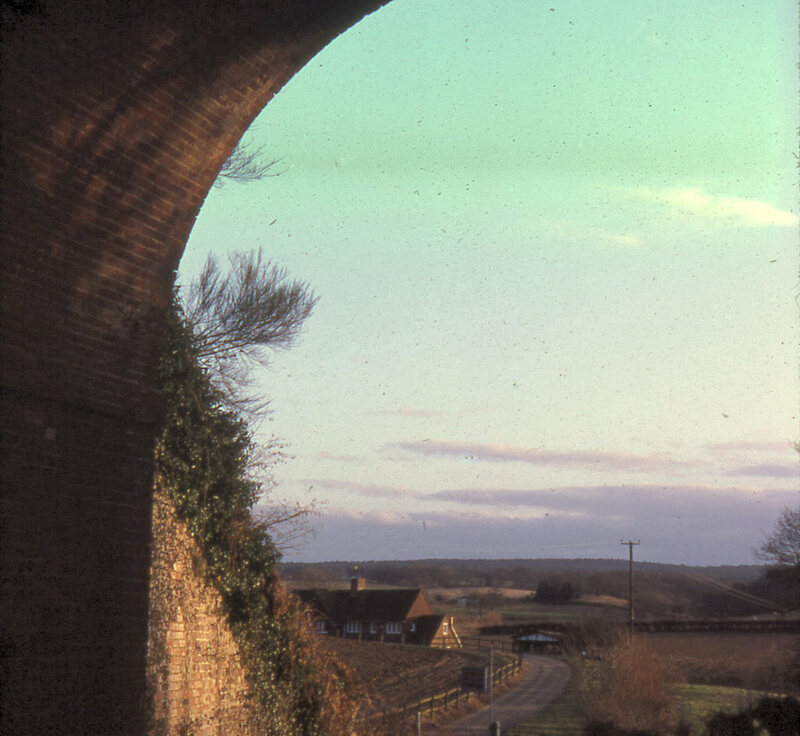 North Downs Line history by Alan Edwards is here. 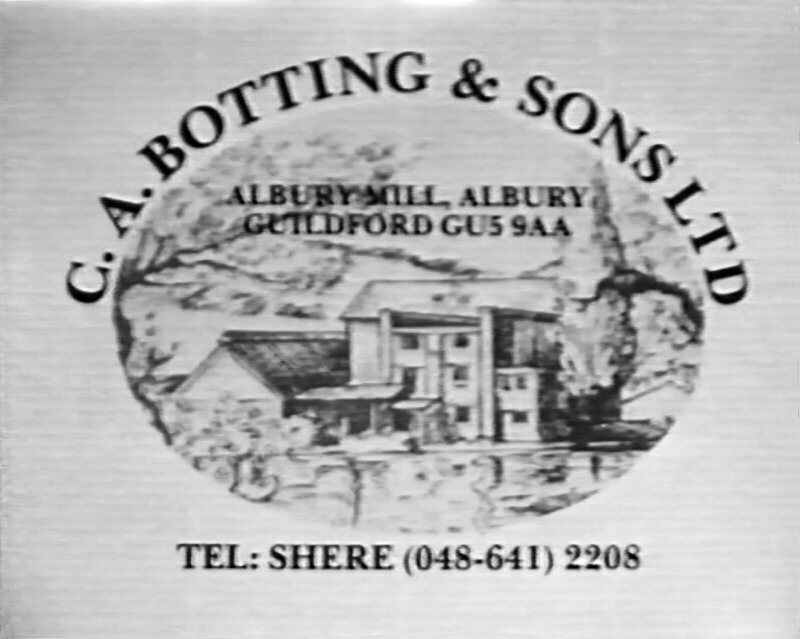 Bottings Flour Mill in Mill Lane, 1911-1990, is described in Milling in Albury and also appears in videos VTS 01 1, VTS 01 2 and audio 082. 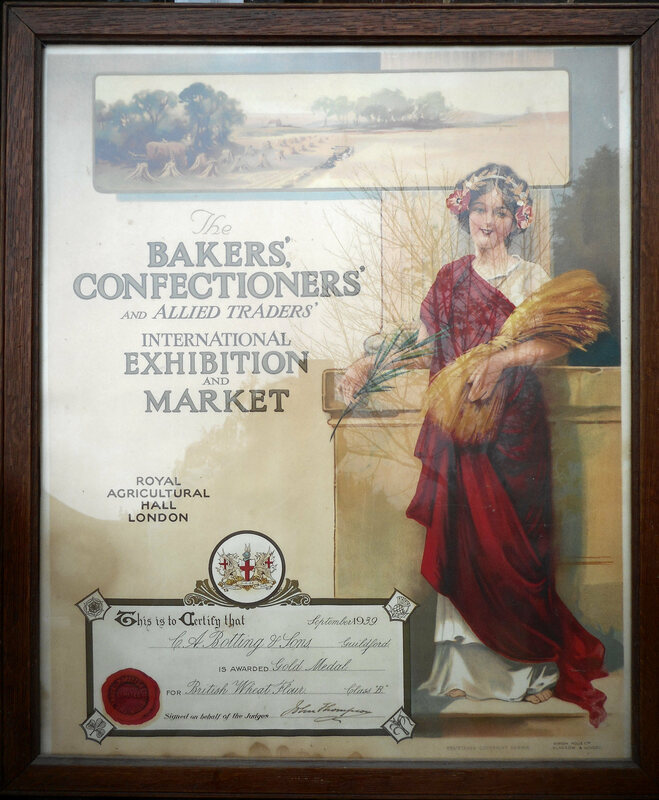 C A Botting and Sons had a large turbine, a Dennis lorry and won wheat flour awards at the Bakers', Confectioners' and Allied Traders' International Exhibition. 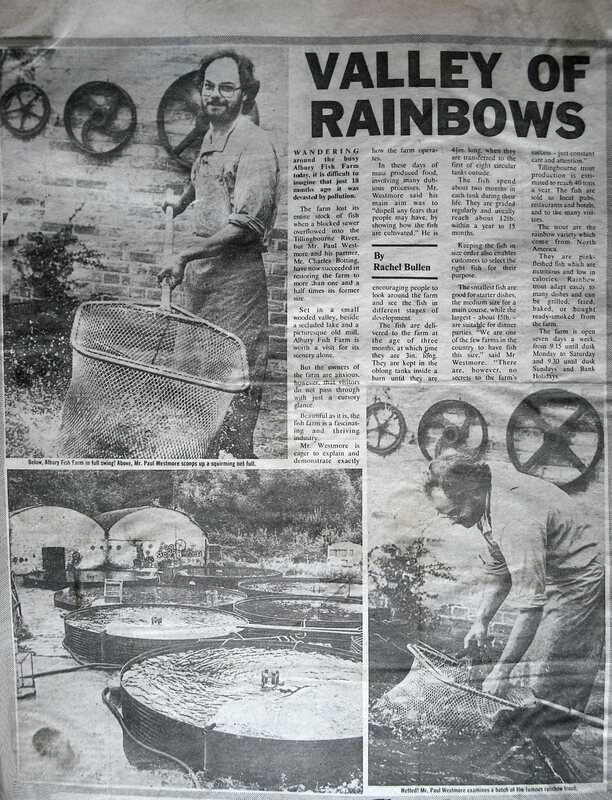 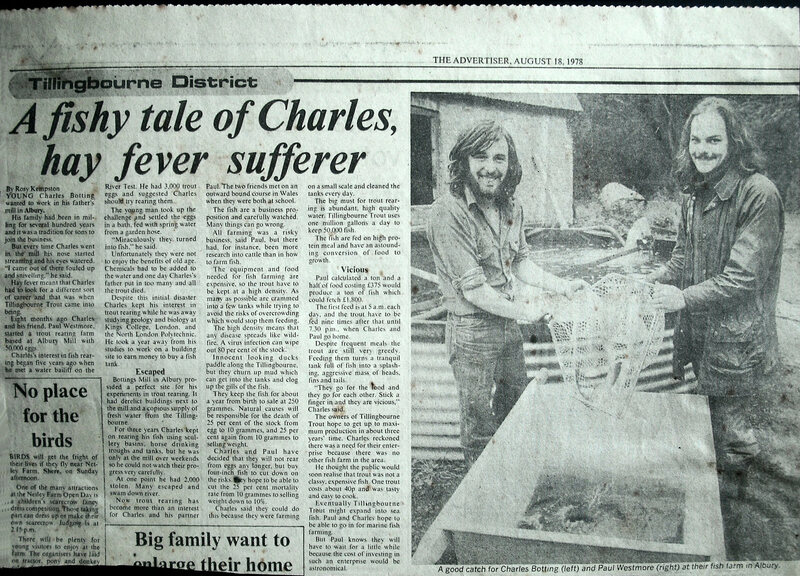 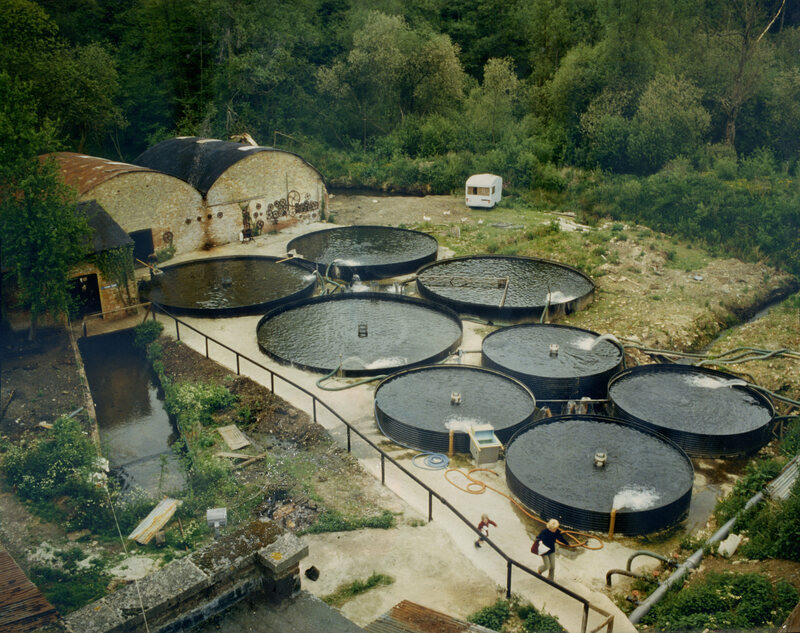 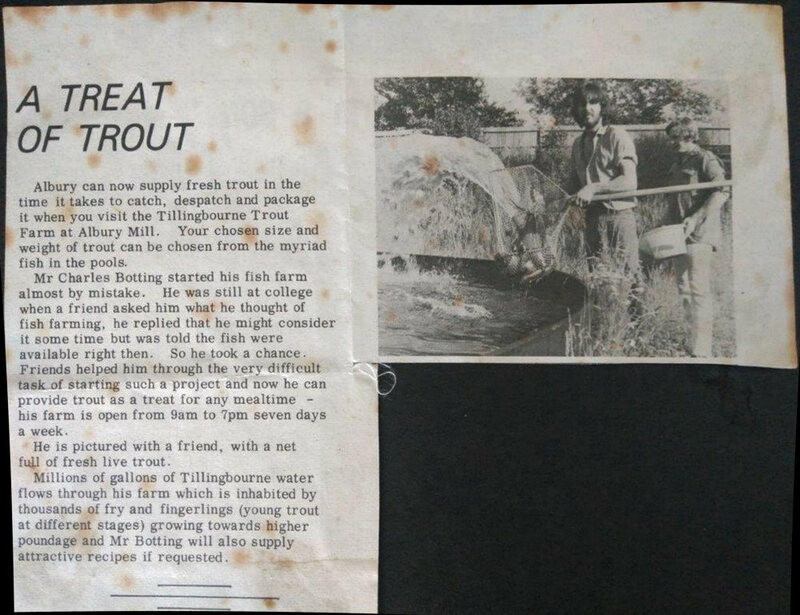 Using the flowing river water and with eight large tanks, Tillingbourne Trout Farm was beside Bottings Mill, 1977-1990. 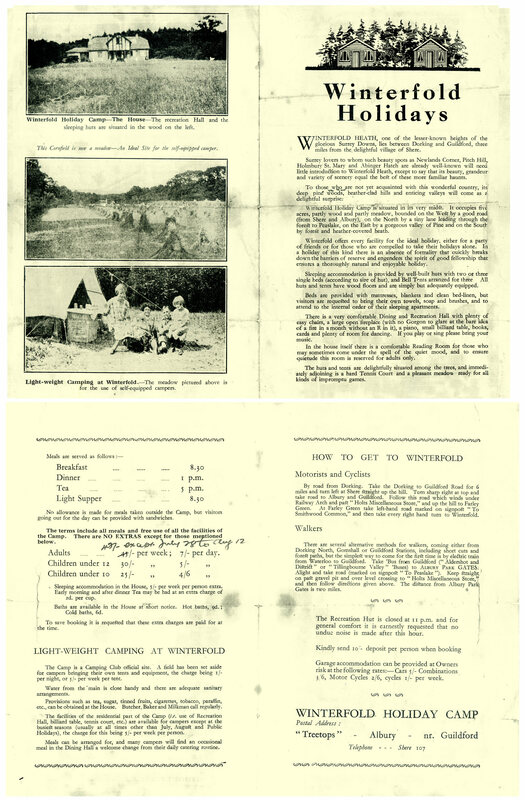 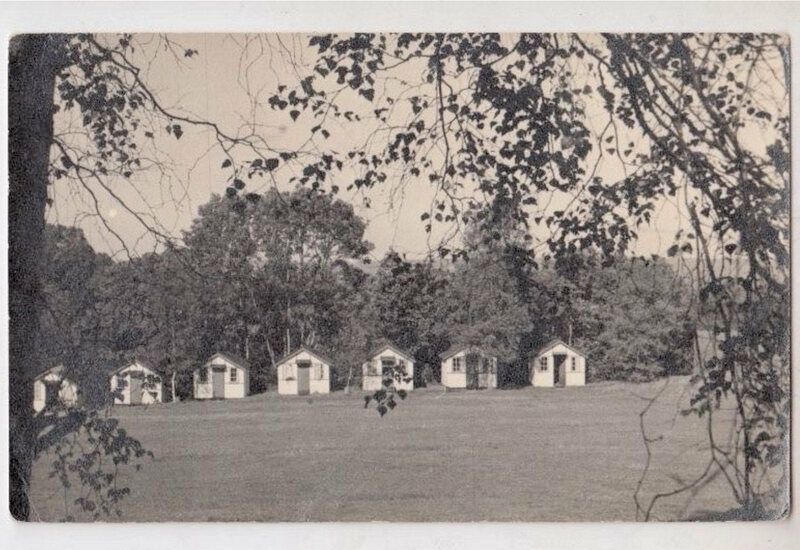 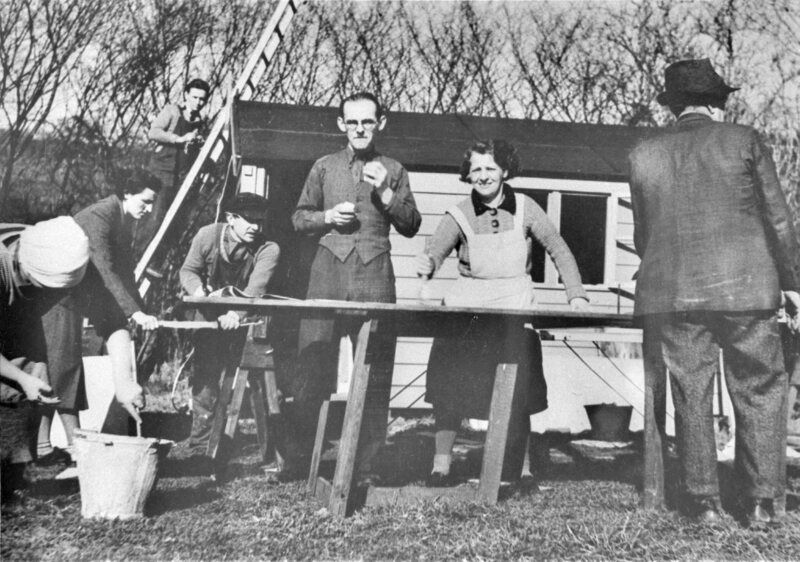 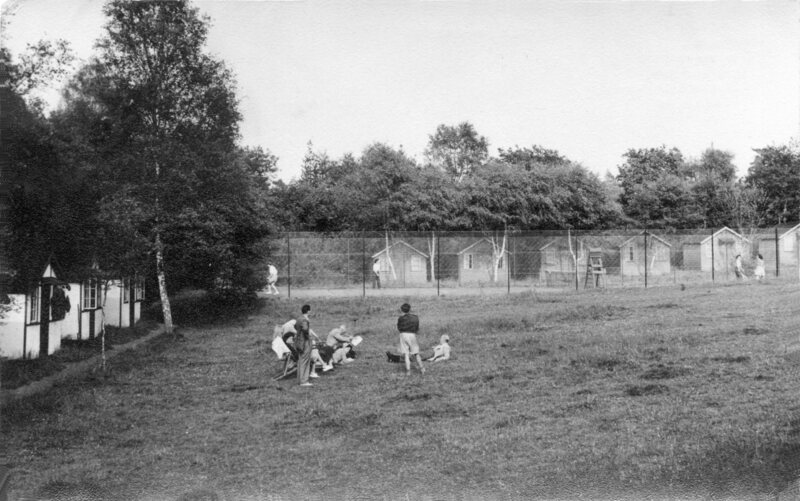 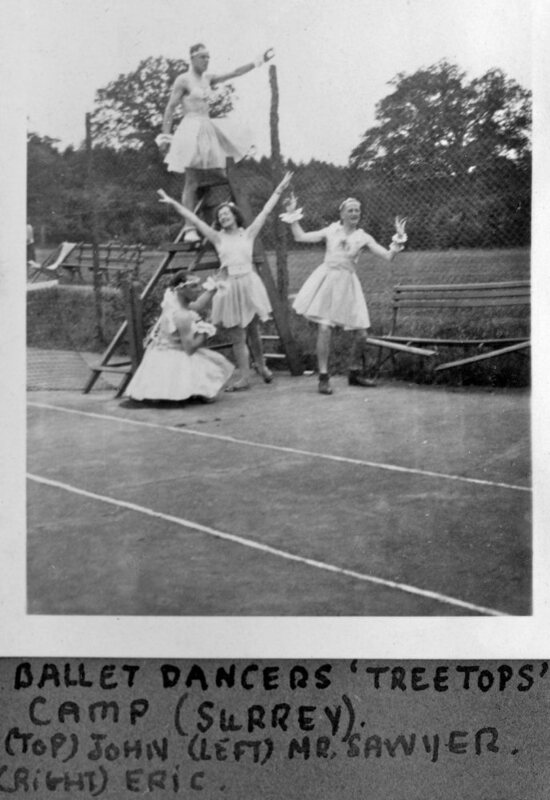 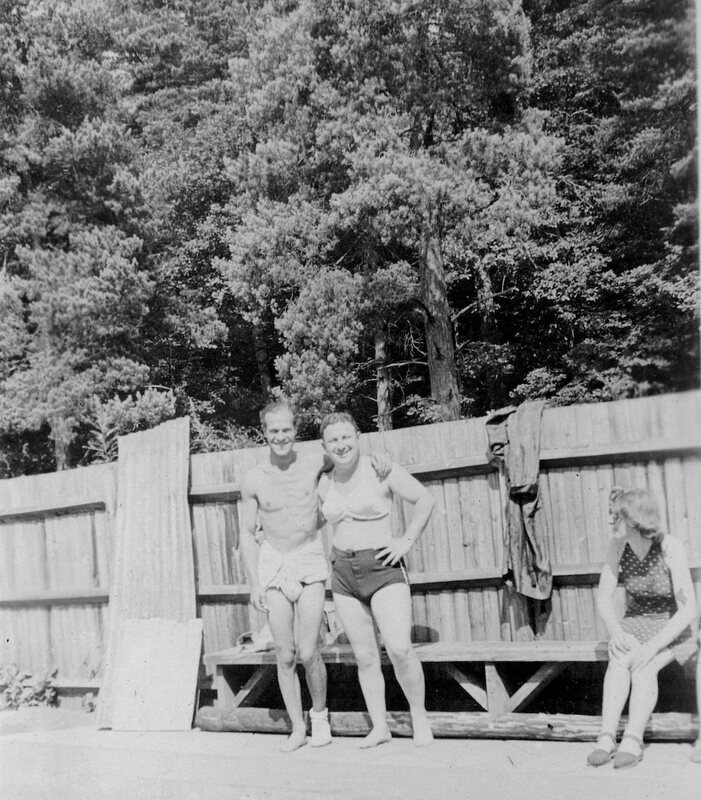 From 1925 with bell tents, Farley Green's first holiday camp, Treetops, had 30 cabins, woodland swimming pool and a tennis court. 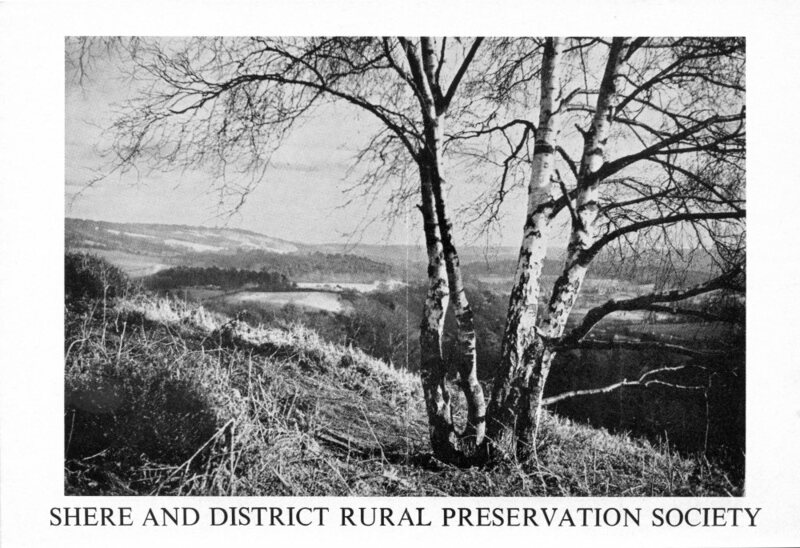 In 1938, supported by Rev. 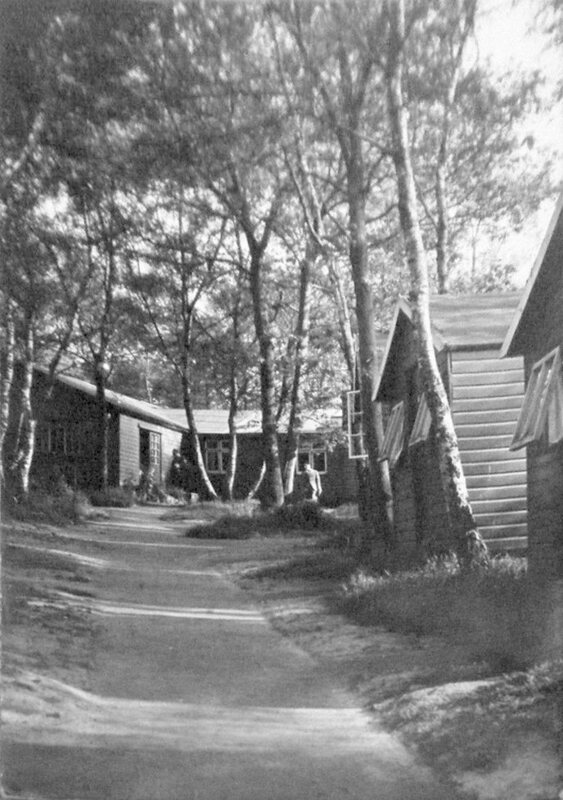 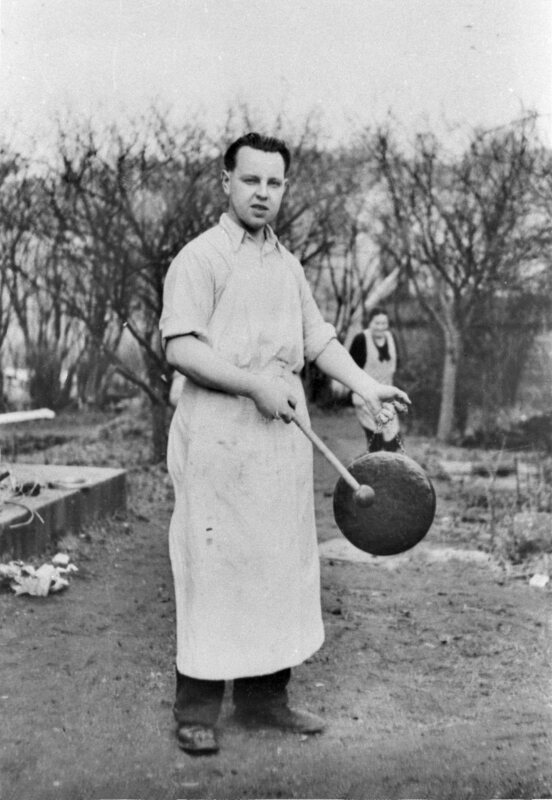 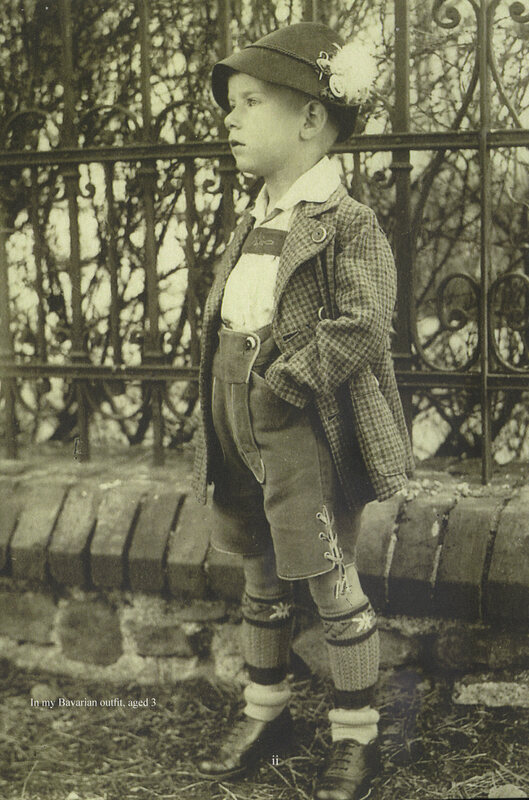 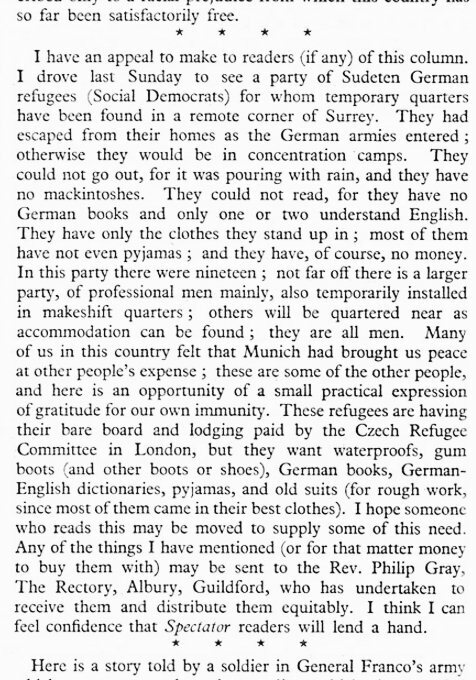 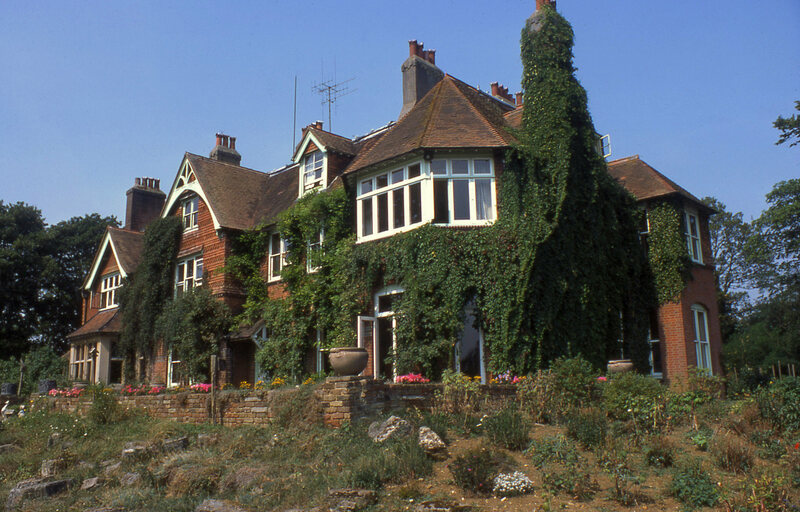 Philip Gray, over 100 Sudeten Czech refugees from the Nazi takeover built chalets at Surrey Hills and had a school at Brook Lodge: audio 105. 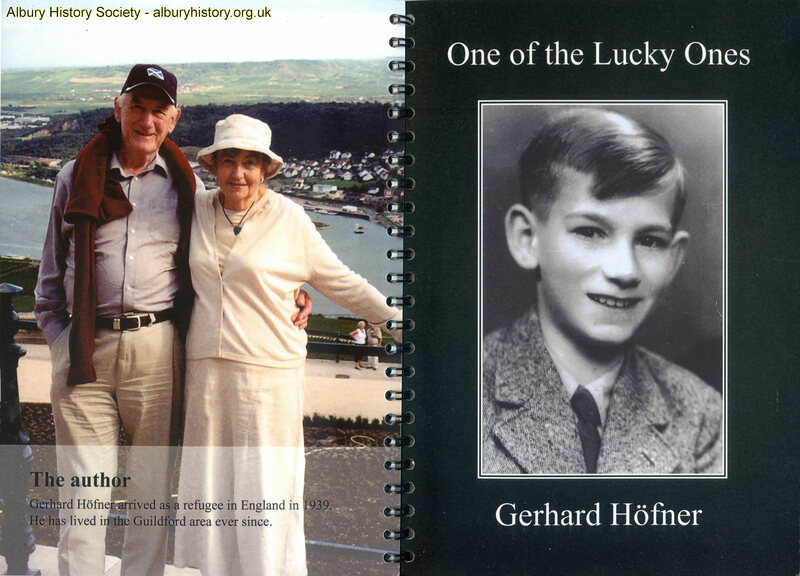 Refugee Gerhard Höfner published his account of coming to Albury, the Red Falcon Scouts and Brook Lodge School in One of the Lucky Ones. 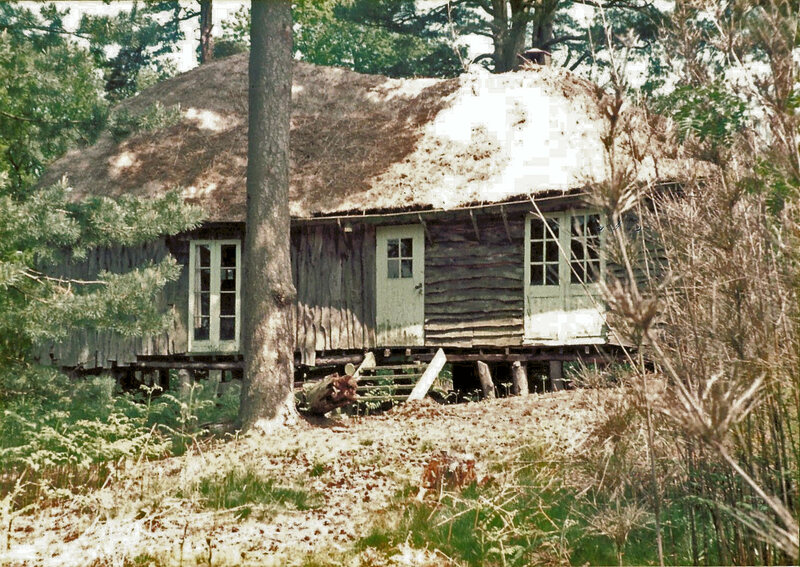 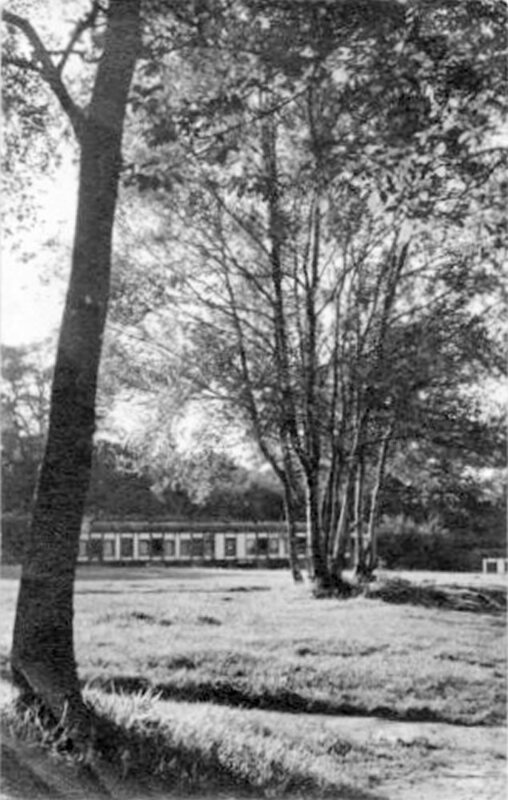 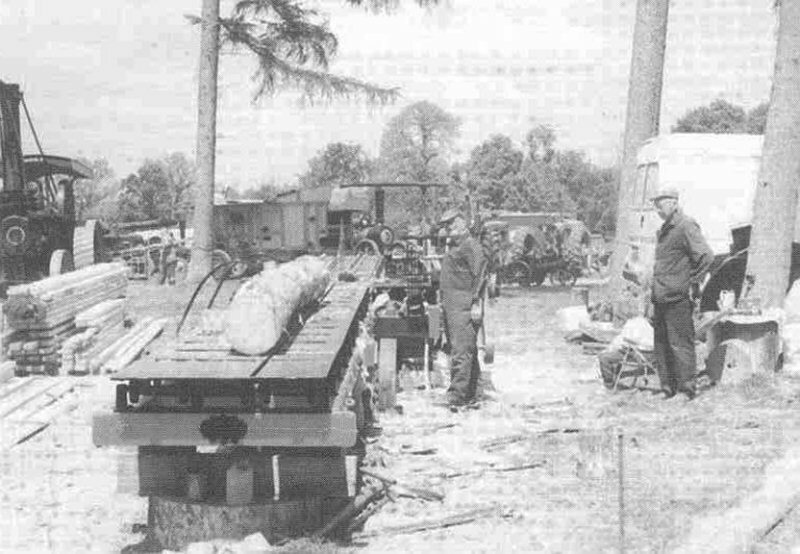 With croquet and golf greens, chalets at Treetops were supplemented by retired railway carriages for wartime accomodation. 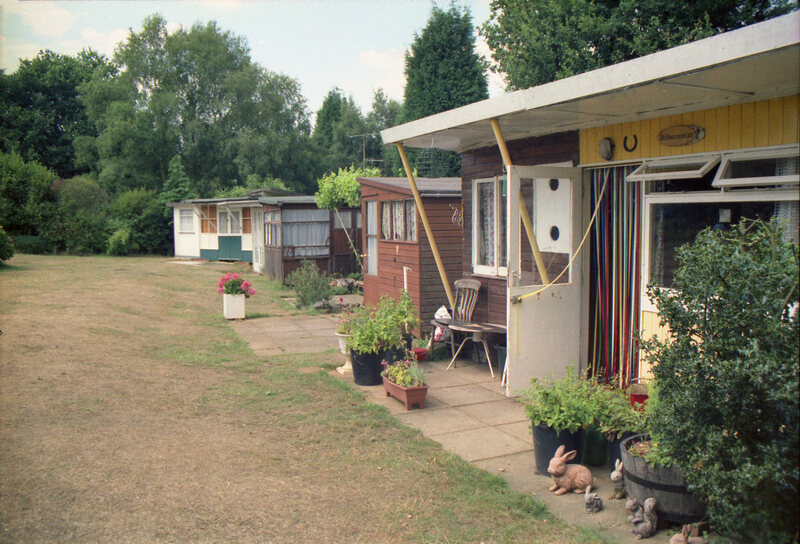 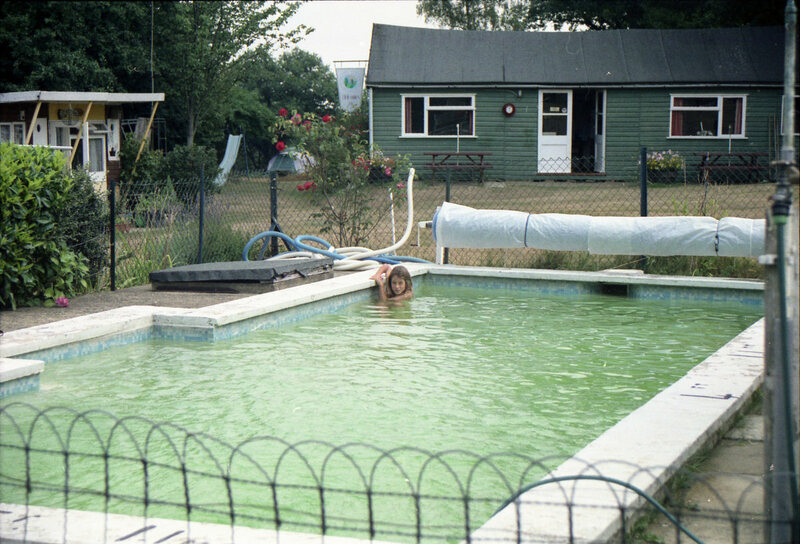 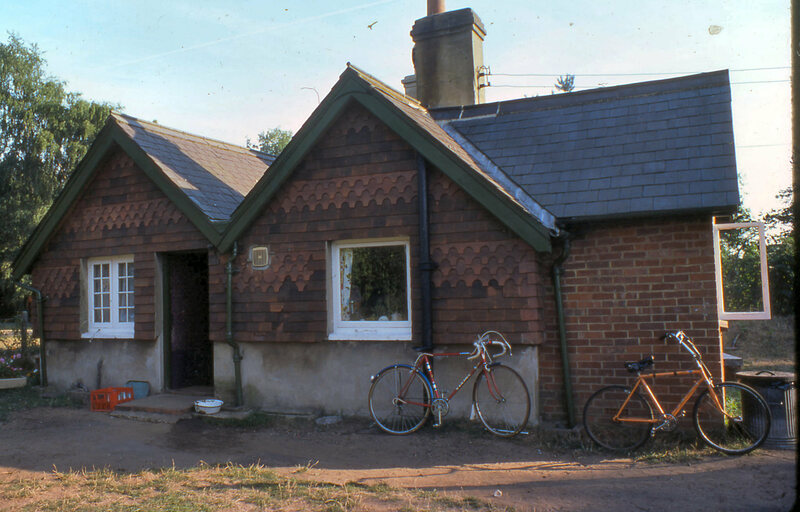 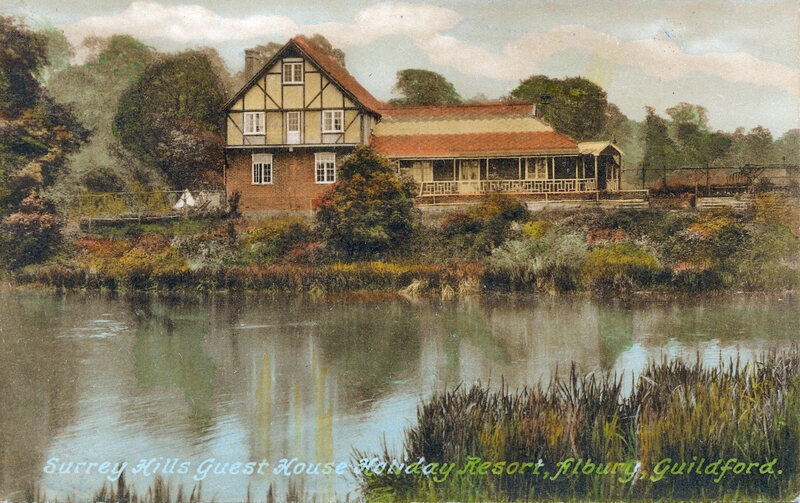 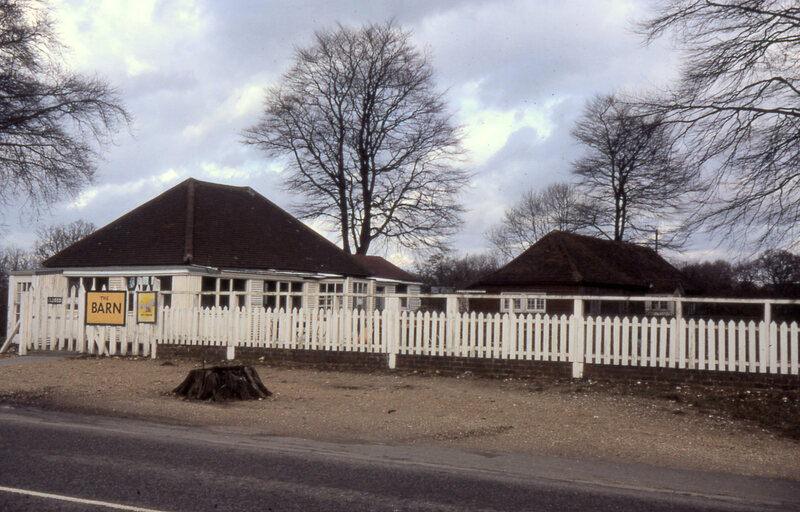 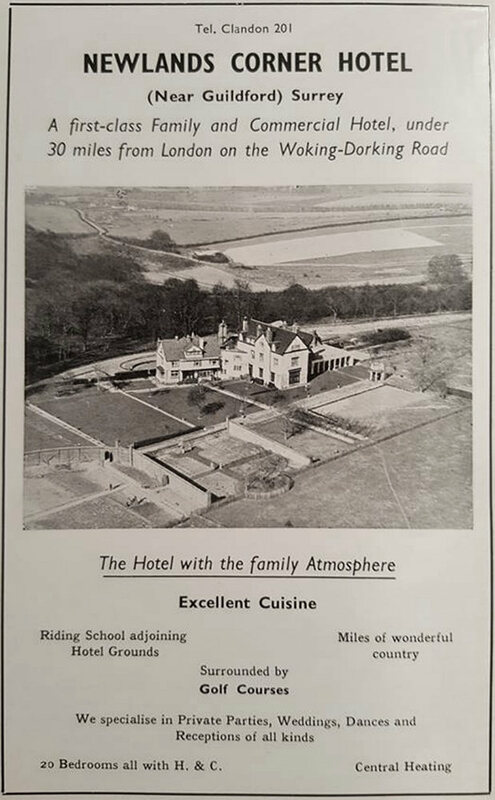 From 1941 to 2011 the naturist Surrey Downs Sun Club had a clubhouse, swimming pool and chalets at Edgeley Egg Farm/Edgeley Park in Farley Green. 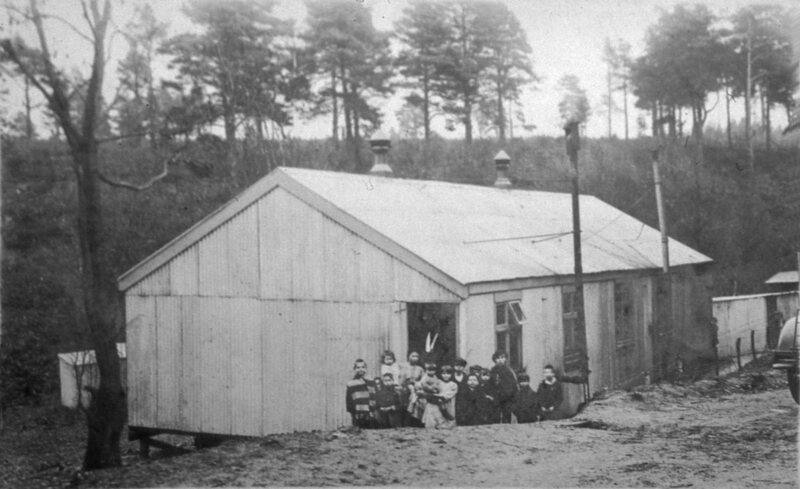 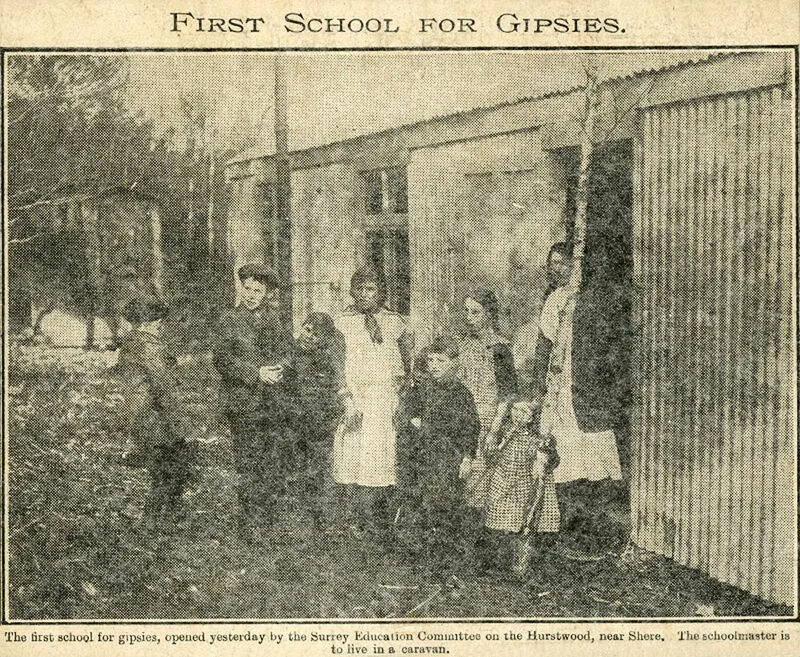 The first in the country, Hurtwood Gypsy School, 1926-1934, served families living in a camp around Wicket's Well. 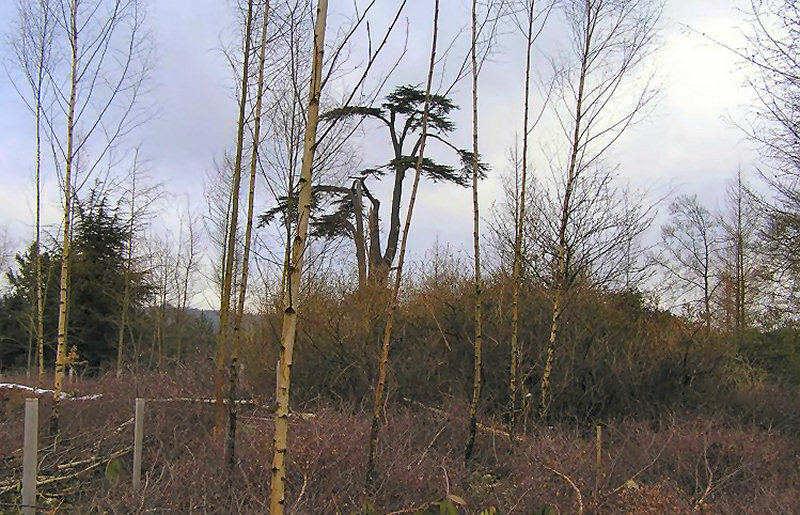 About The Hurtwood of 1991 documents 1970s stories of the Surrey Puma, spotted a dozen times by the ranger, Bob Ware. 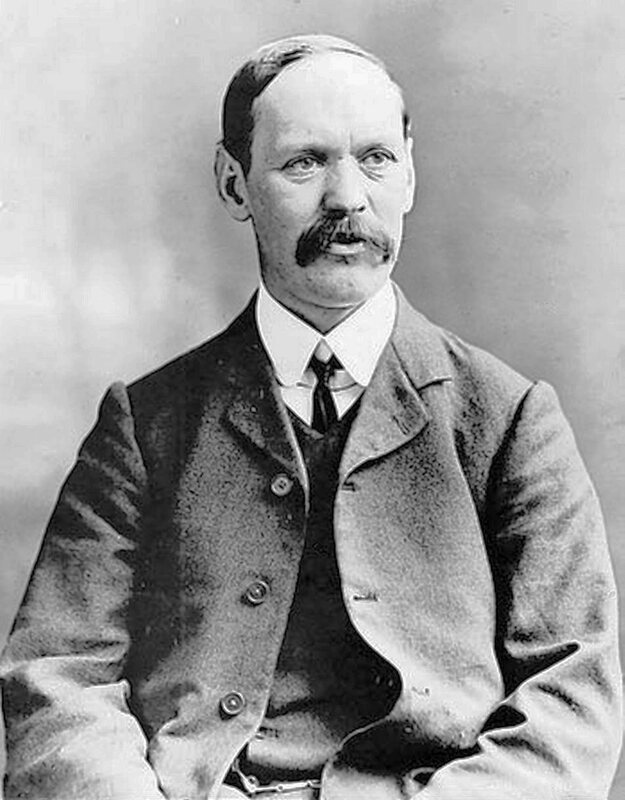 Albury's Dr Maurice Burton remained unconvinced. 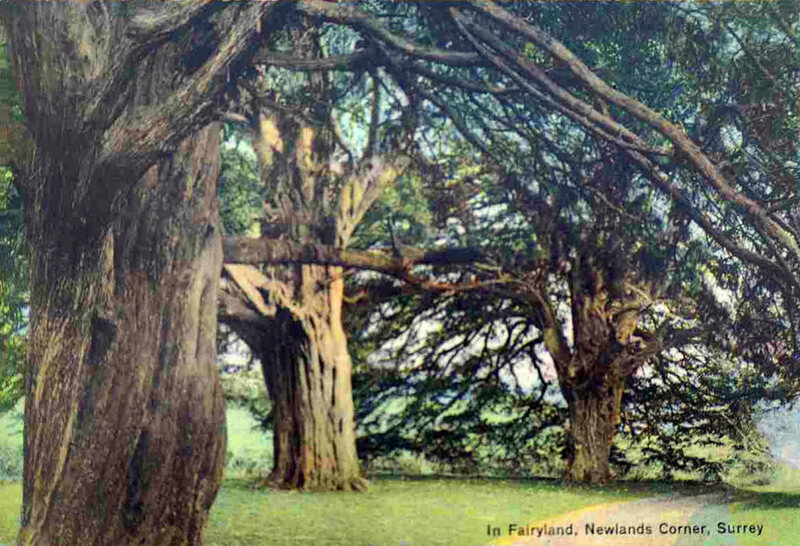 Albury Estate workers covered St Martha's Church with fir tree camouflage during the First World War to stop its use as a landmark by Zeppelins. 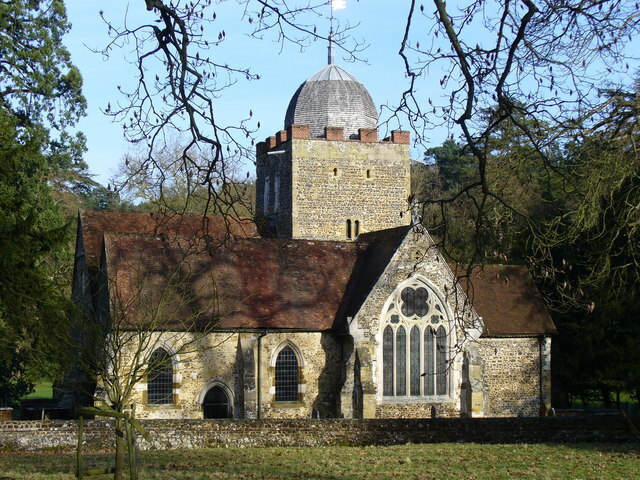 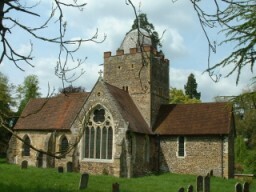 Long a ruin after a 1745 gunpowder explosion, St Martha's, on Martyr's Hill, was once owned by Newark Priory. 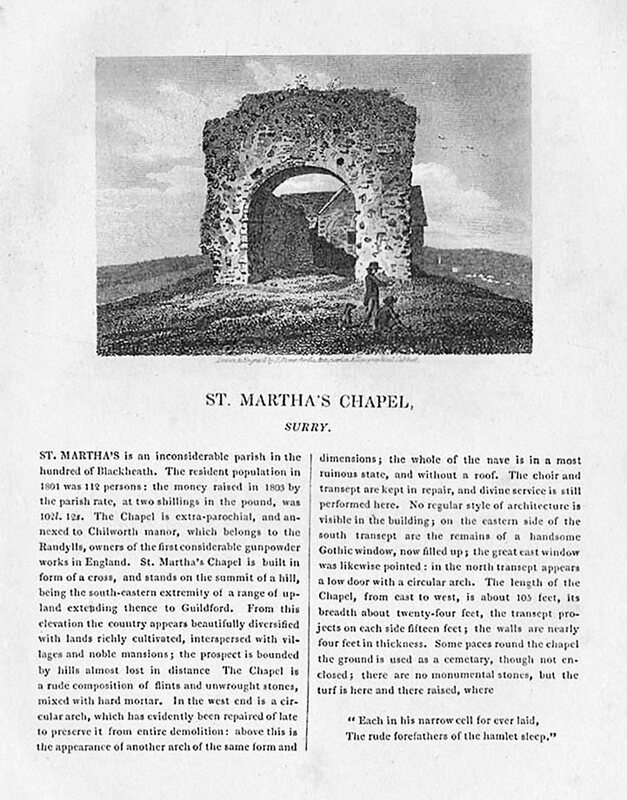 Histories here and here..
St Martin's, Blackheath, by Charles Townsend has unique Anna Lea Merritt murals, described by Olive Maggs, and a window to asbestos maker John Bell of Lockner. 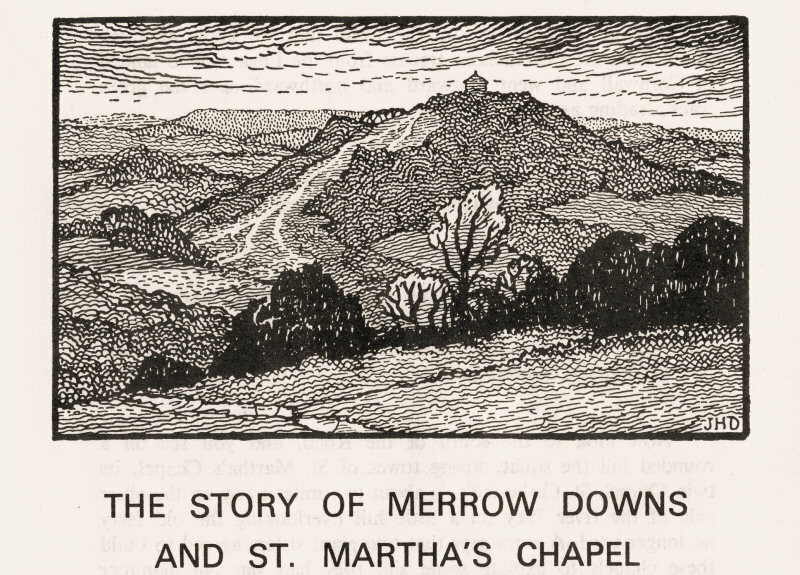 From 1931, Shere and District Rural Preservation Society published leaflets: Farley Heath & Roman Temple; Merrow Downs & St Martha's Chapel; Stephen Langton & Silent Pool. 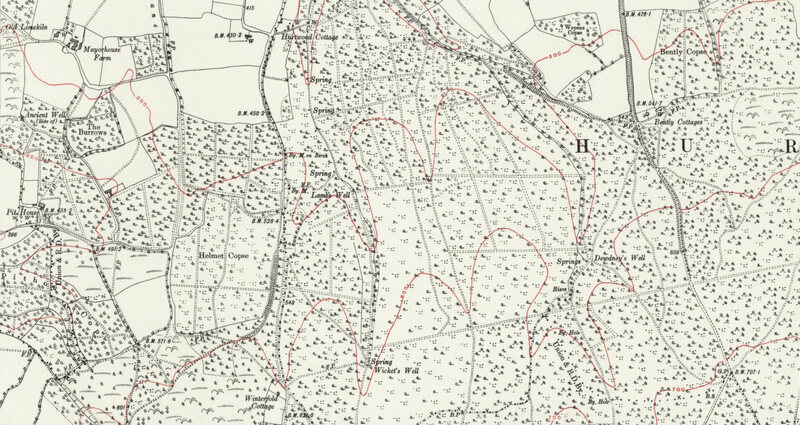 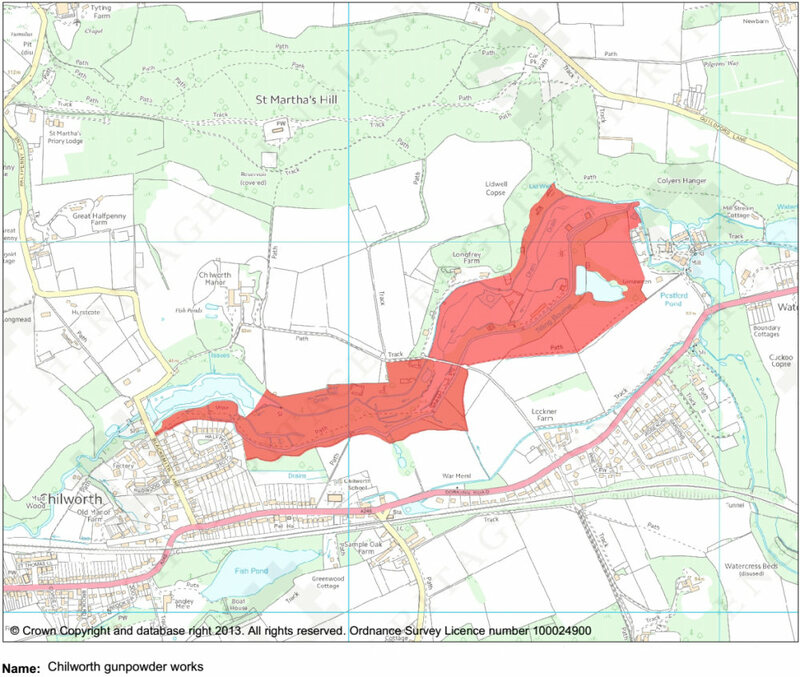 Cartographer John Flower of Farley Green created his first illustrated map of The Tillingbourne Valley in 1986, PDF, followed by the 1993 edition. 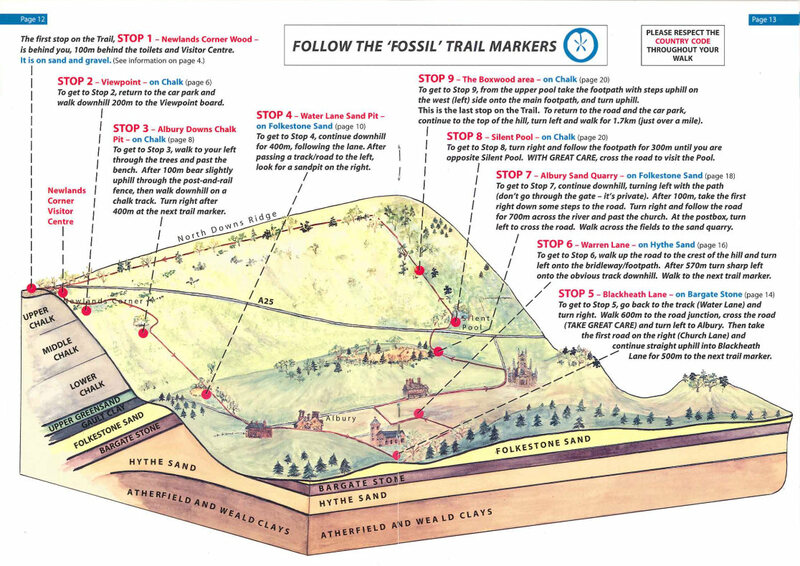 Along the Pilgrims' Way Illustrated Map - Winchester, Alton, Farnham, Guildford, Reigate, Maidstone, Canterbury was created by John Flower in 1998, here. 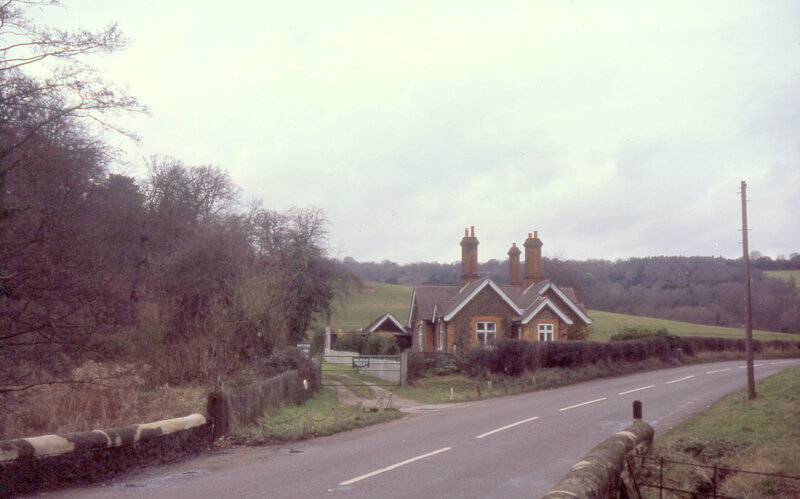 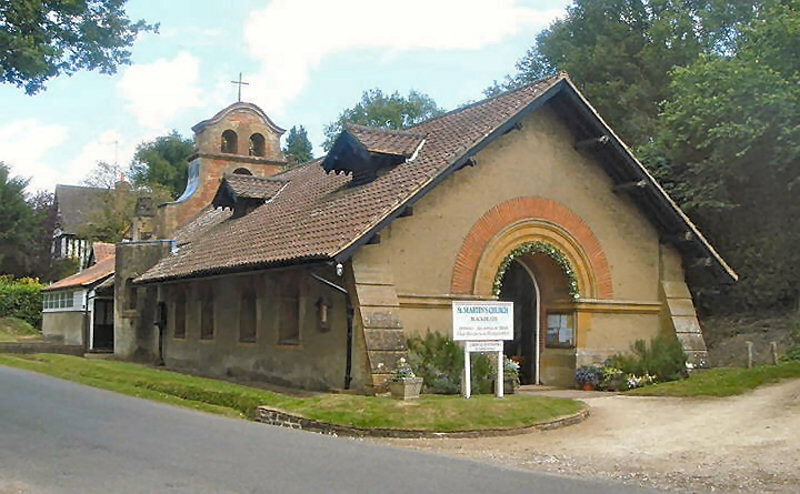 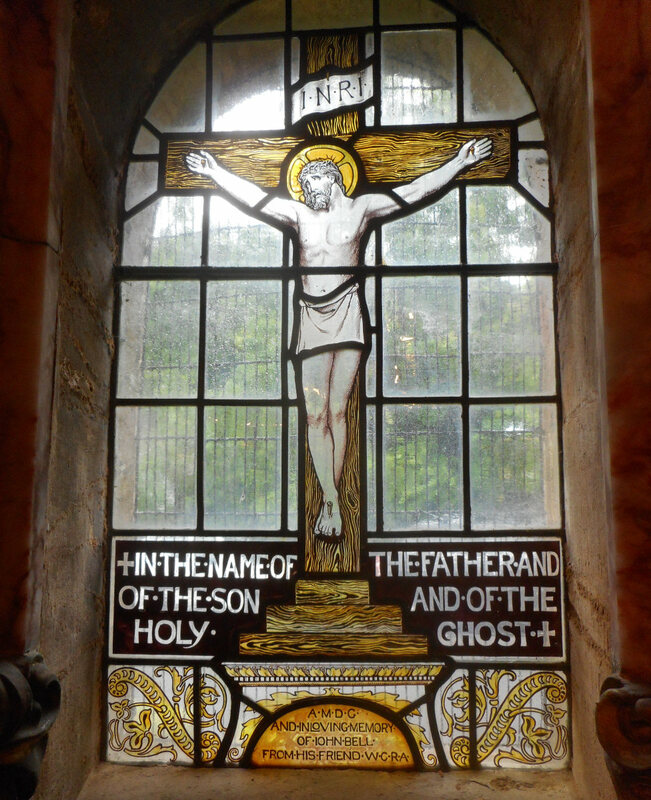 Newdigate Burne, Angel-in-Charge at Albury Catholic Apostolic Church, wrote in 1897 parish magazines of road changes and the coming of railways, here. 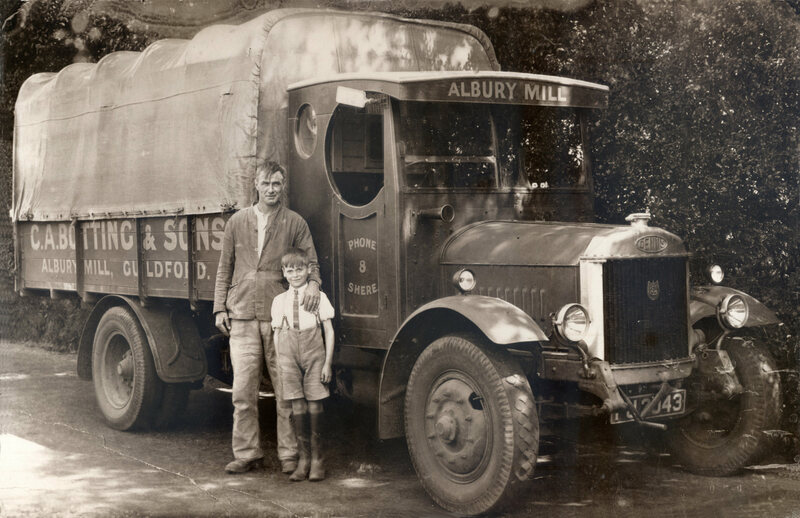 The 2011 four page Social History of the Parish of Albury over the past 40 years, by Albury History Society, is here. 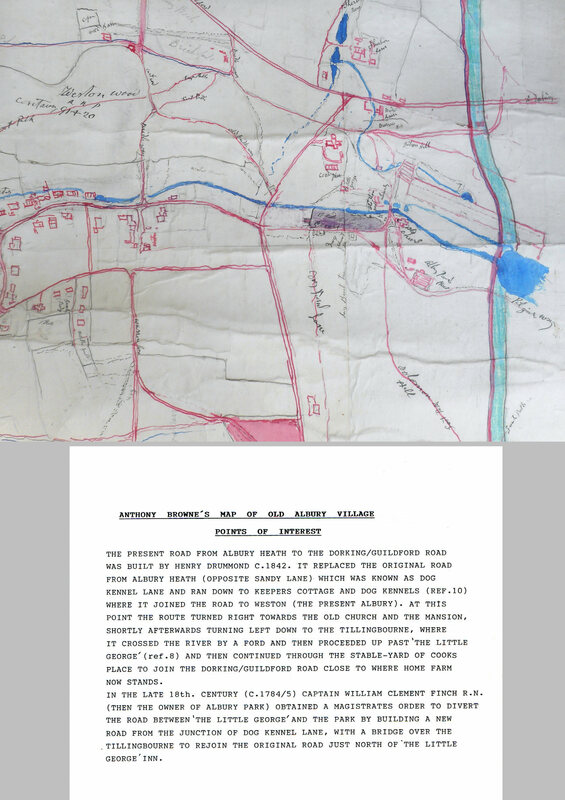 1939 census pages covering every property in Brook, Farley Green and Albury are all collected together here with an index here. 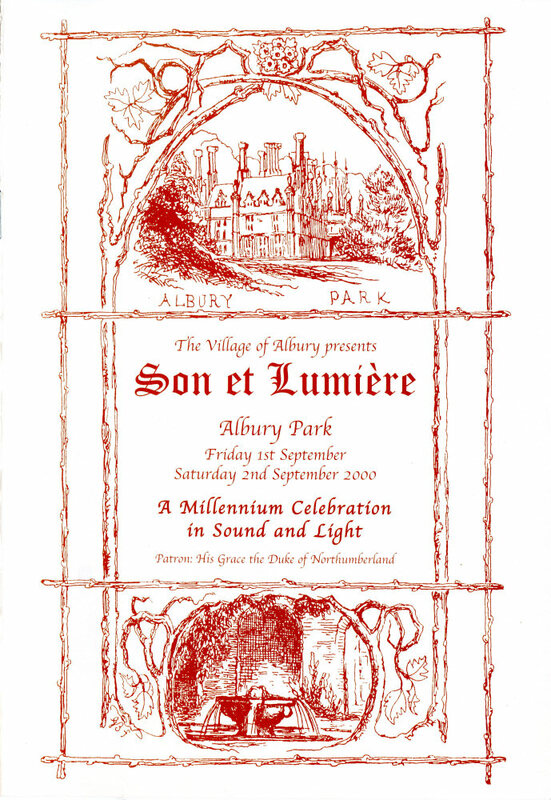 A Millennium Celebration, one thousand years in the life of Albury Son et Lumière was staged on the lawns of Albury Park Mansion in 2000. 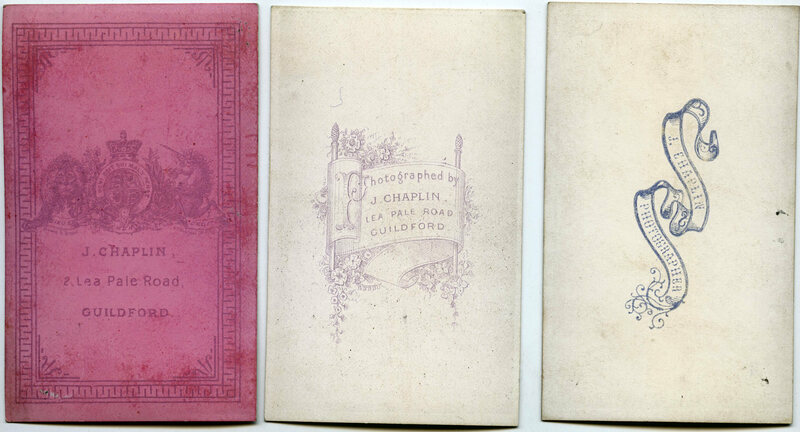 Script. 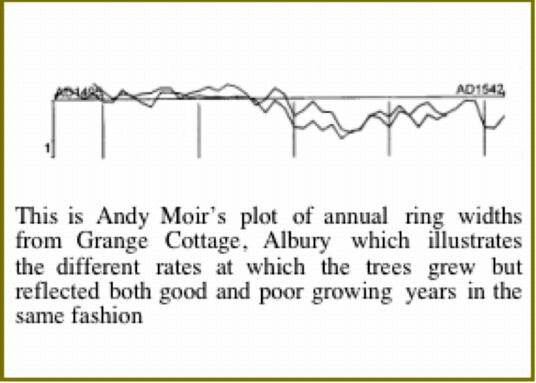 Tree ring dendrochronology helps Domestic Buildings Research Group give building dates for Albury, Brook and Farley Green. 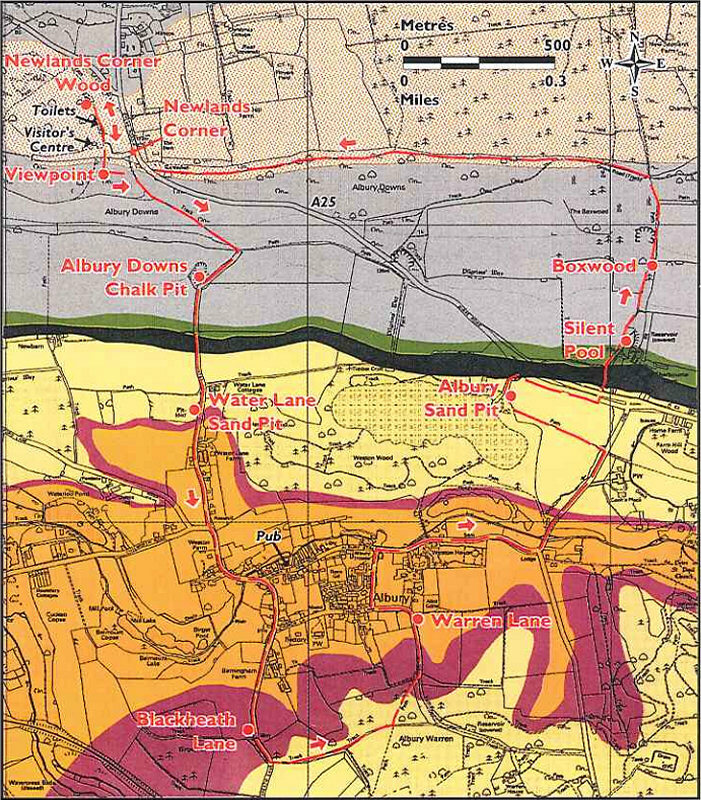 The Albury Conservation Area map and illustrated brochure produced by Guildford Borough Council in 1989 is here. 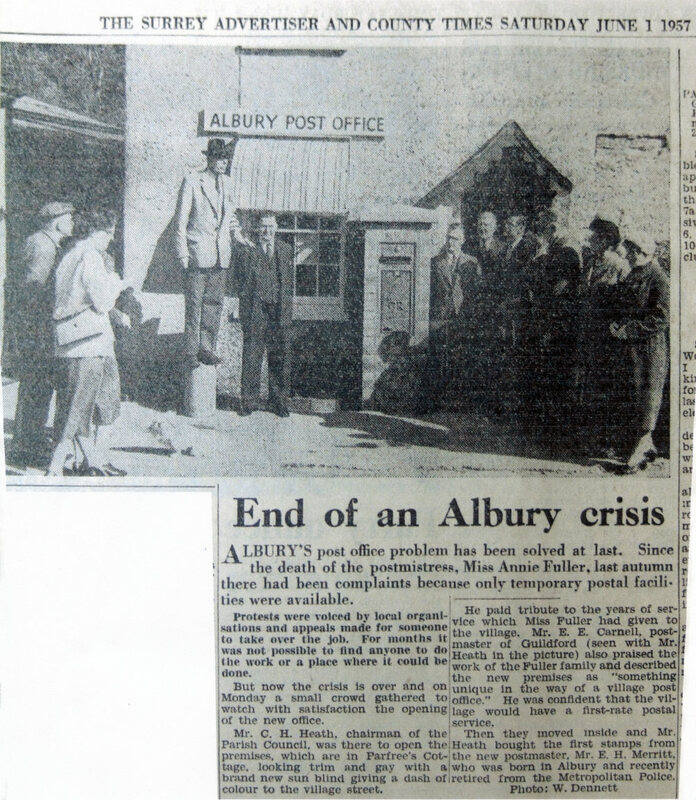 Albury Parish Council has a brief history of Albury here. 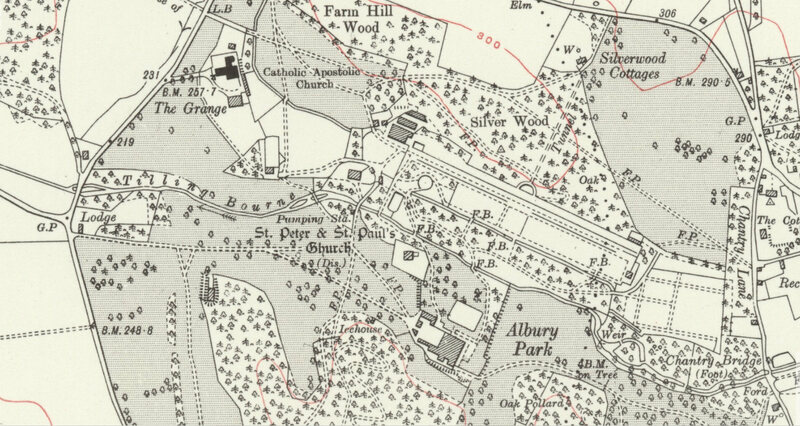 Albury St Peter And St Paul Parish Records, 1559-1981, are here. 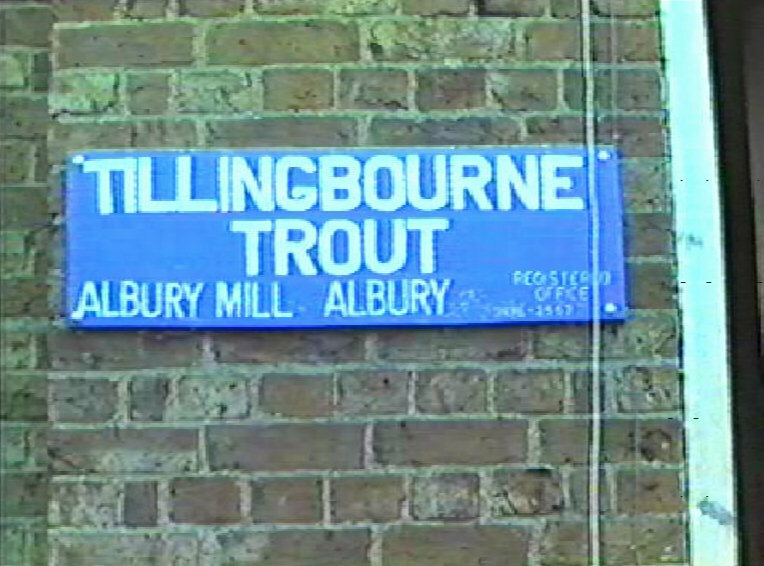 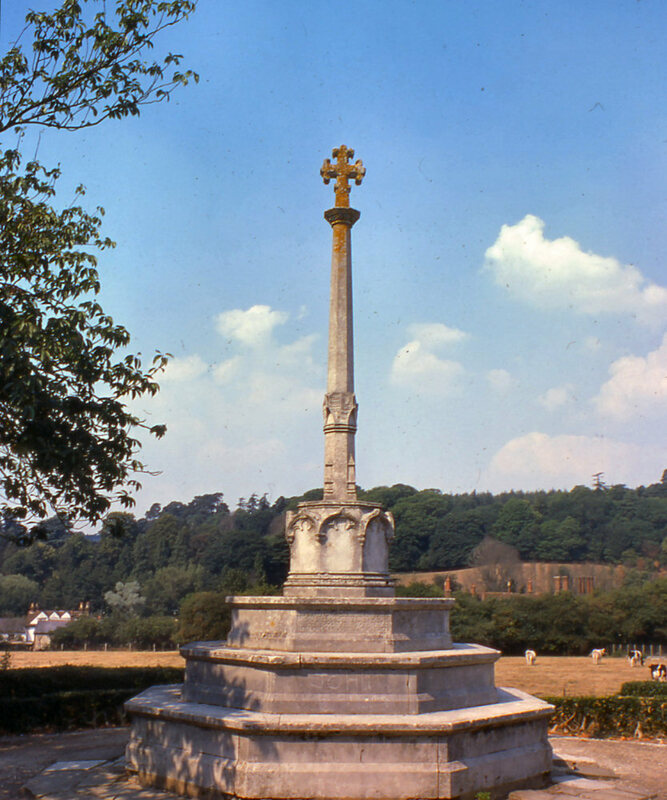 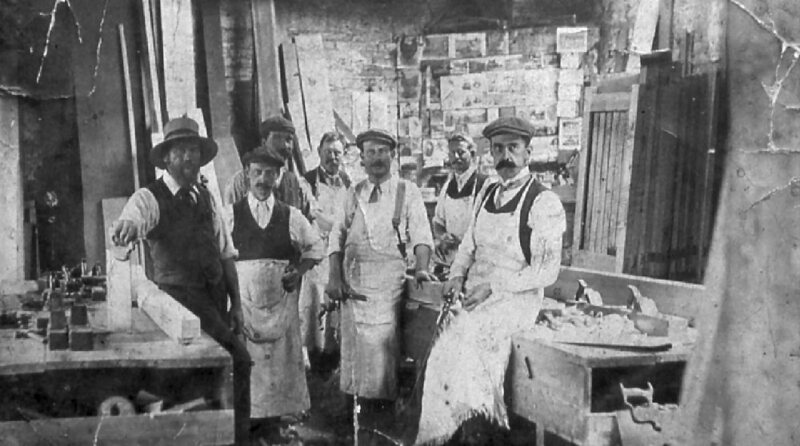 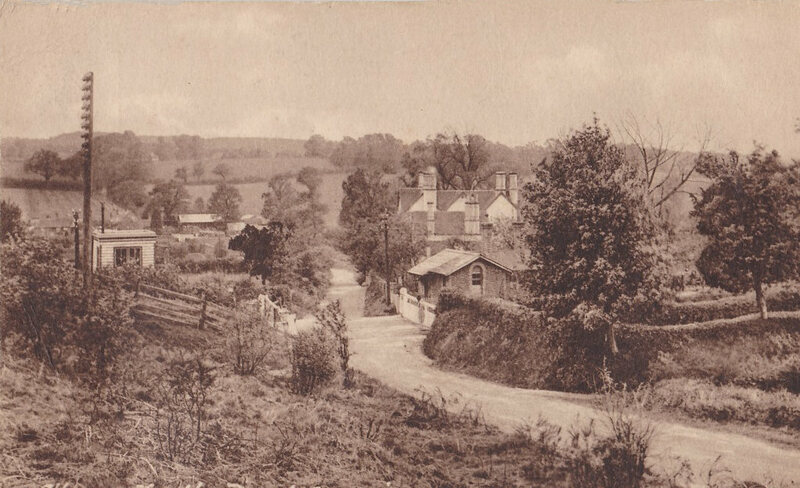 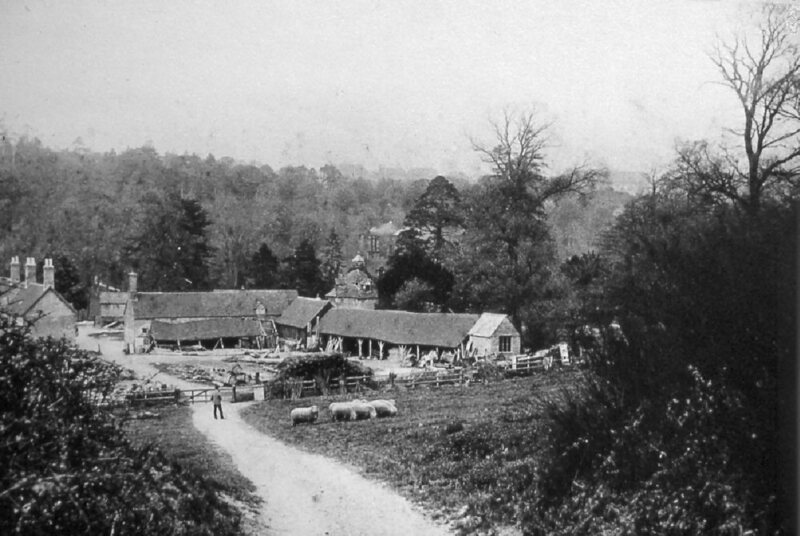 Albury is included in Tales & Trails of the Tillingbourne Valley HLF Project, researching a unique industrial past which stamped its character on communities. 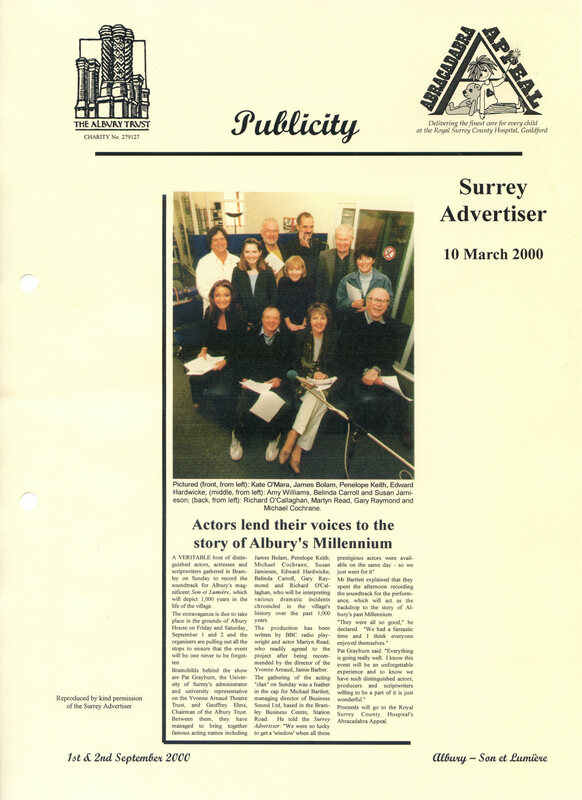 Over the years Albury History Society has built up an extensive archive of historical material going back to the 16th Century, which is housed at the Surrey History Centre in Woking. 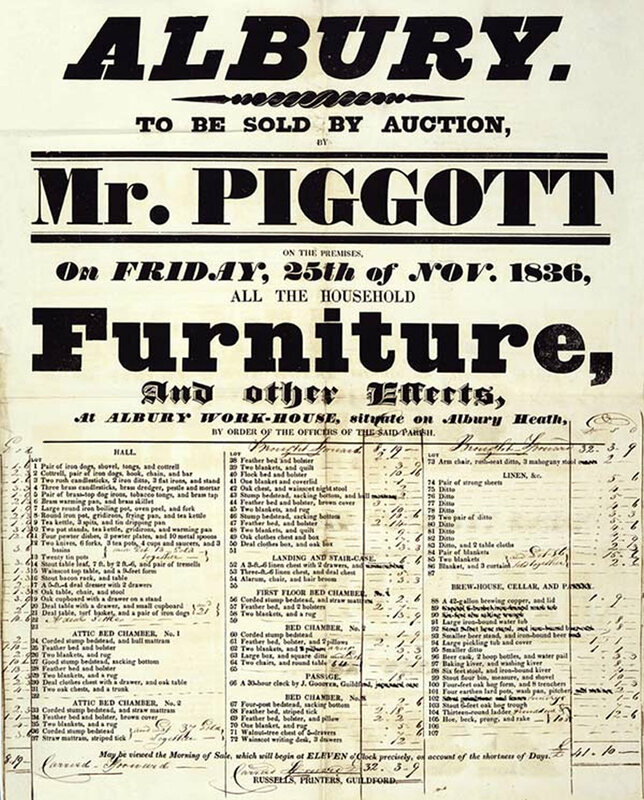 These records have been catalogued, 8261 and 8261ADD, and are available to visitors for research or general interest. 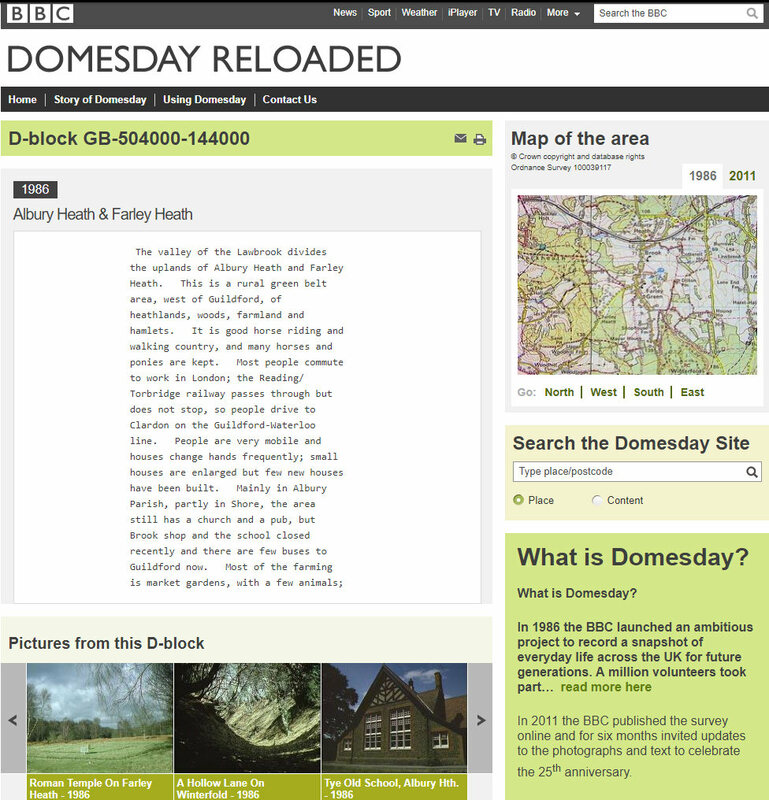 Their National Archives record is here: discovery.nationalarchives.gov.uk/details/c/F216050. 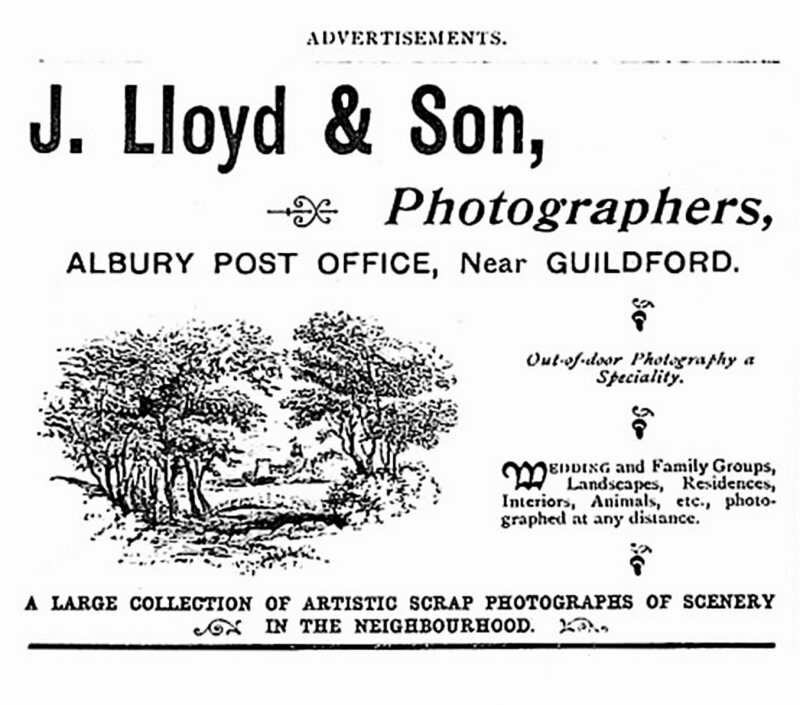 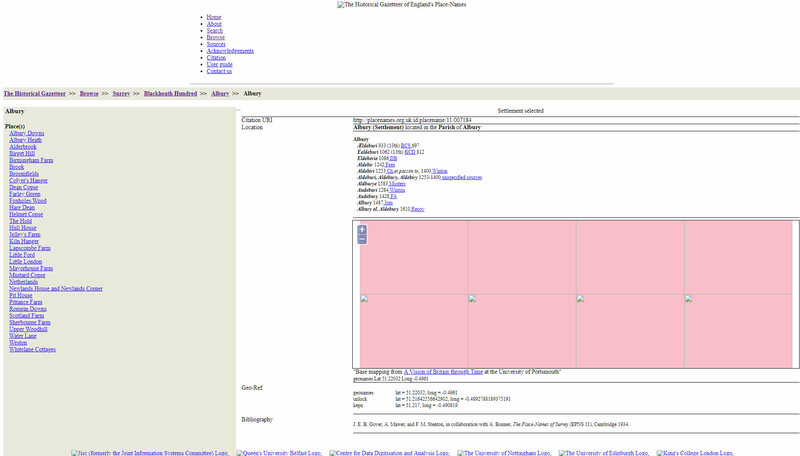 A searchable index of Albury History Society slides, photographs and talk scripts is here.